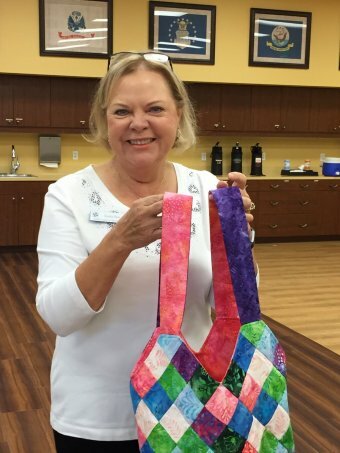 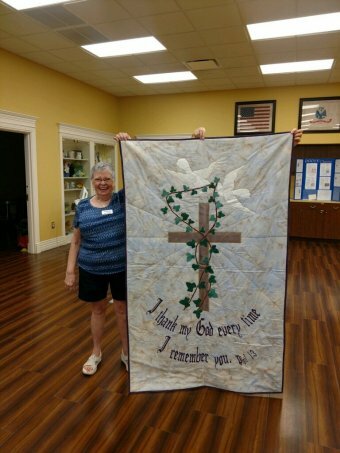 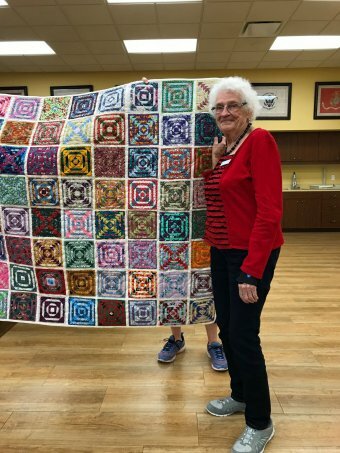 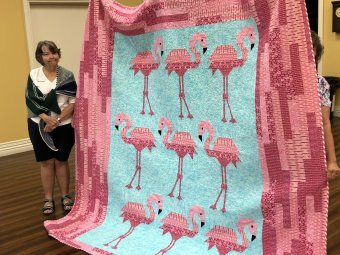 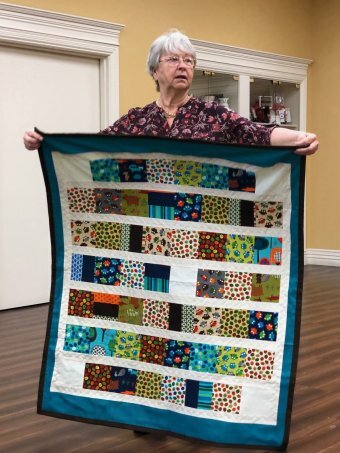 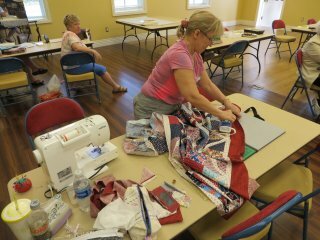 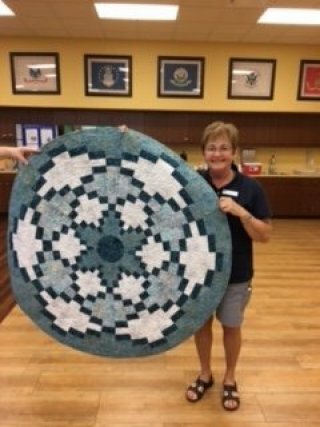 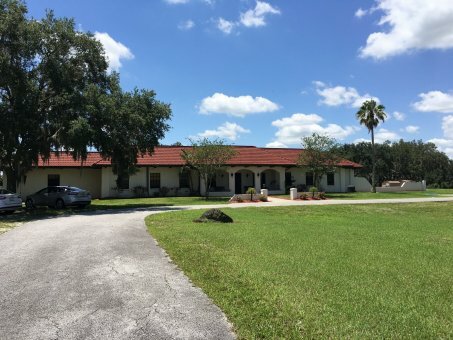 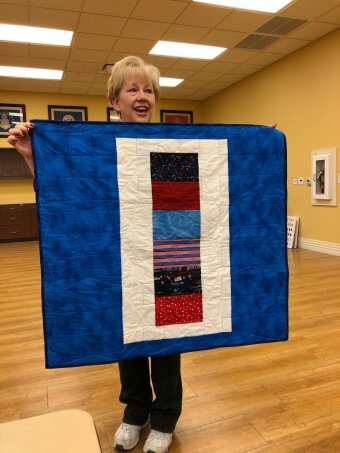 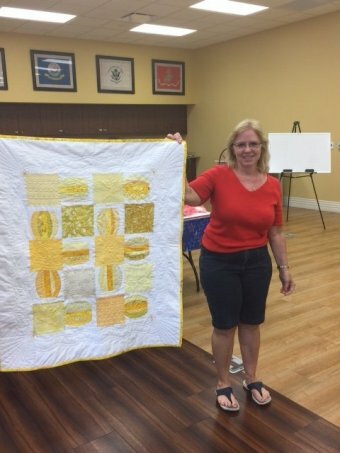 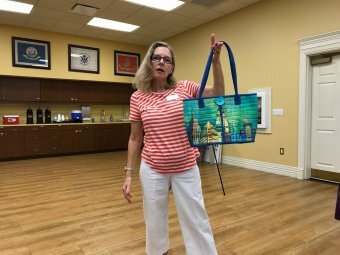 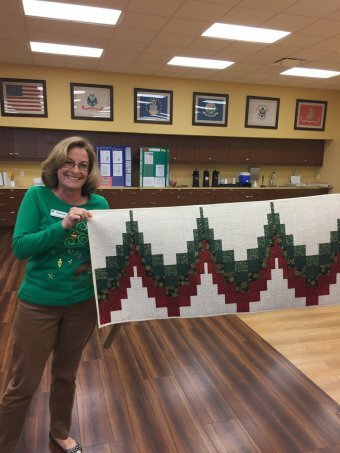 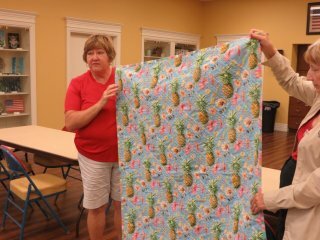 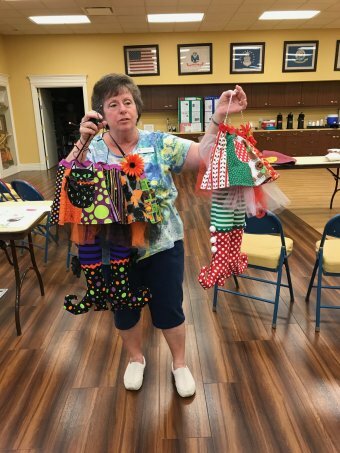 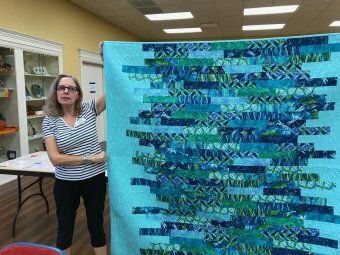 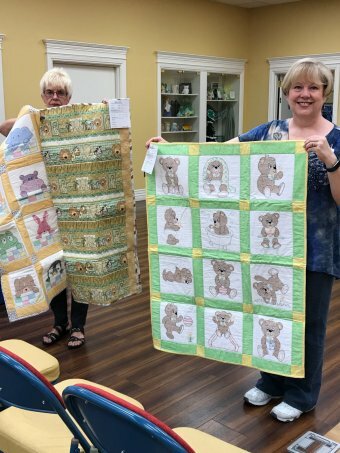 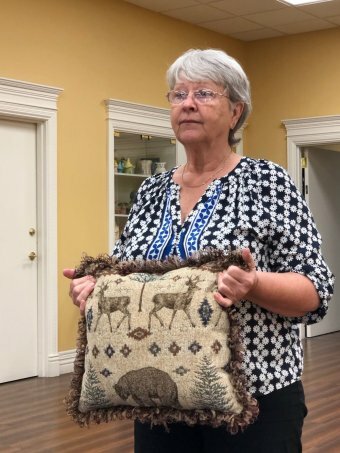 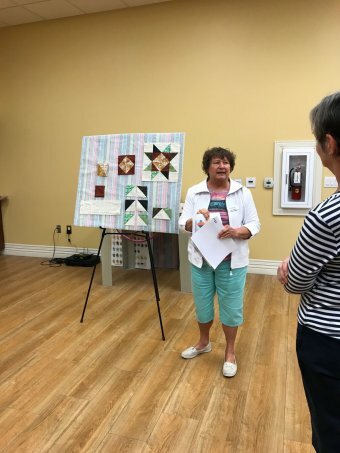 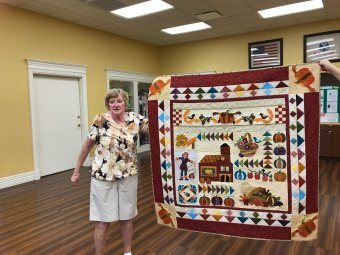 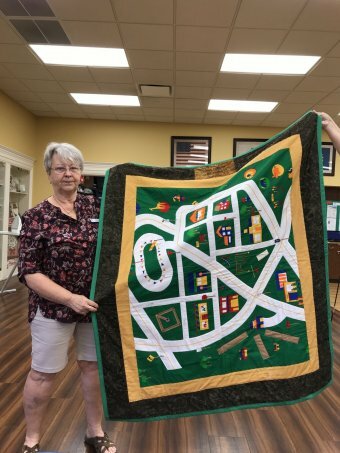 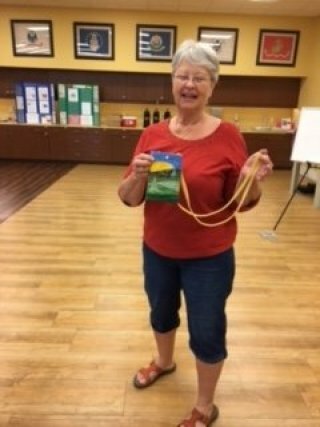 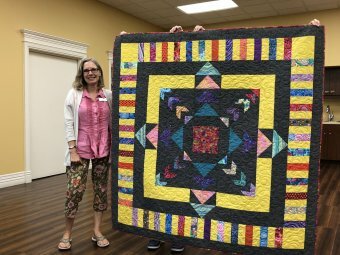 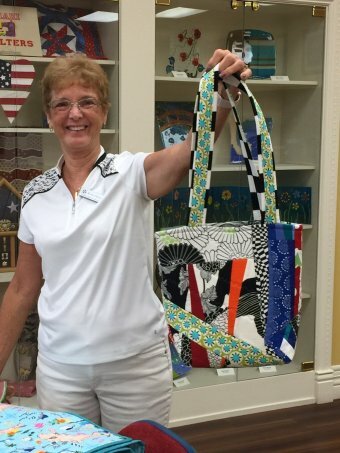 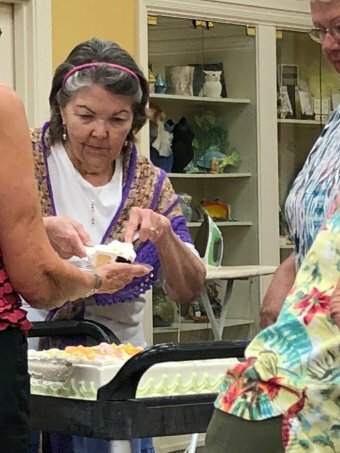 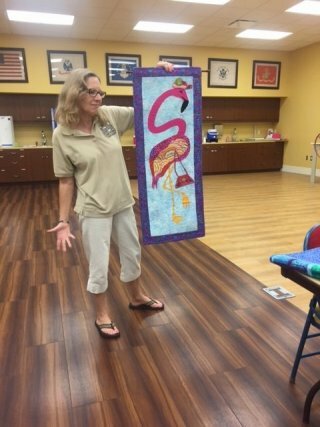 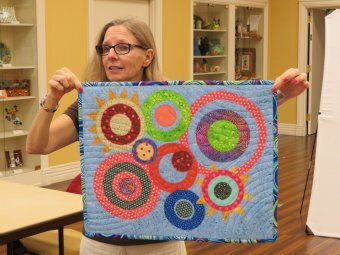 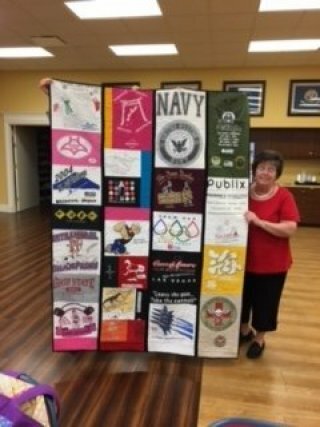 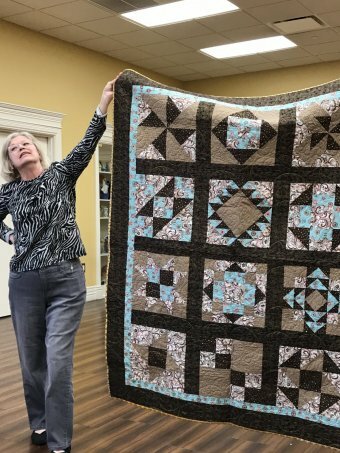 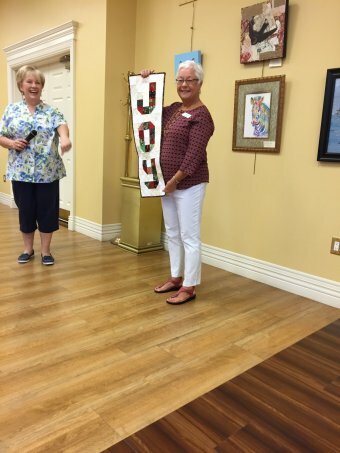 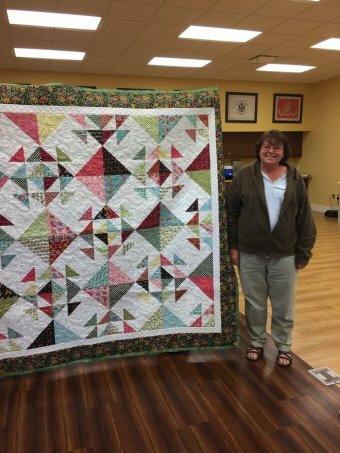 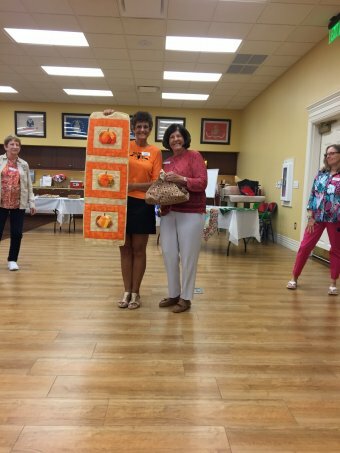 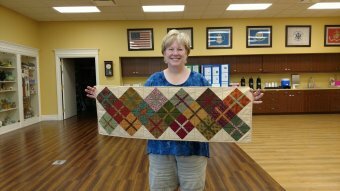 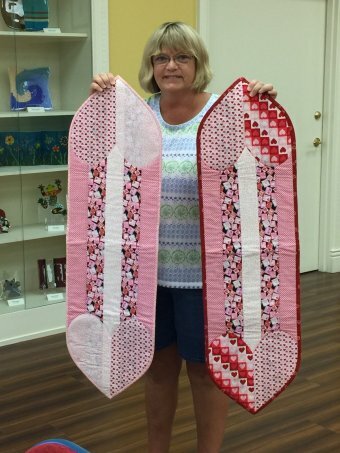 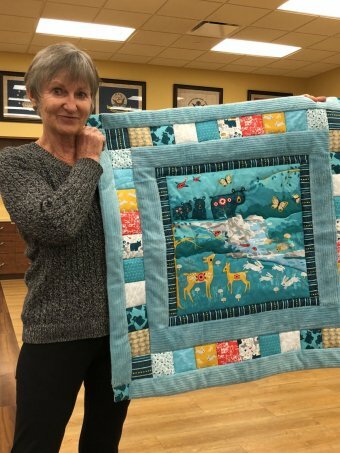 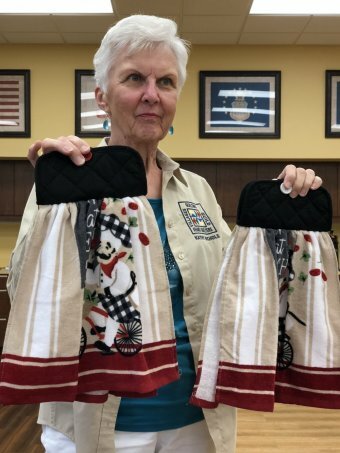 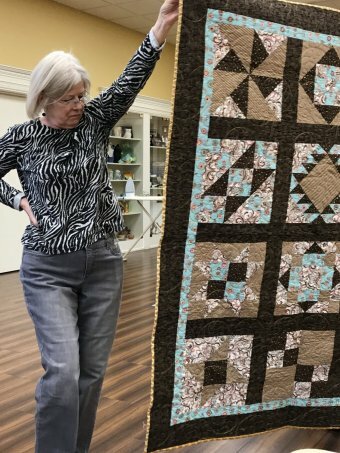 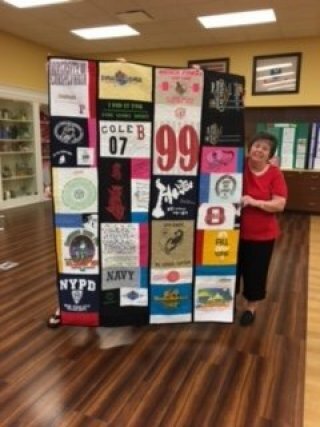 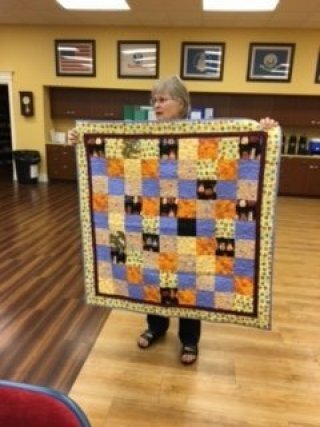 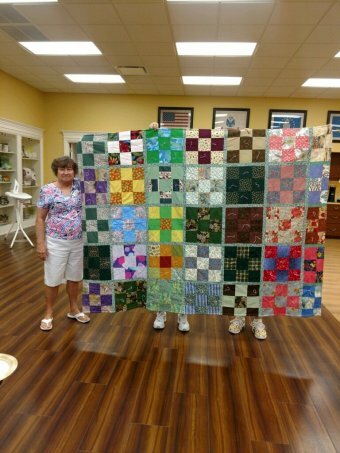 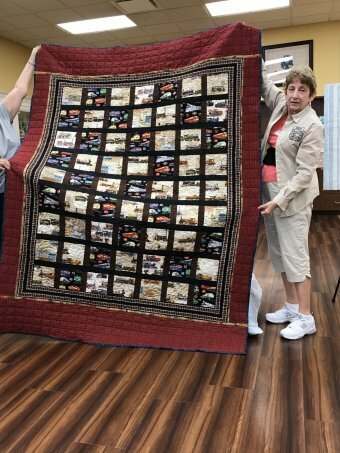 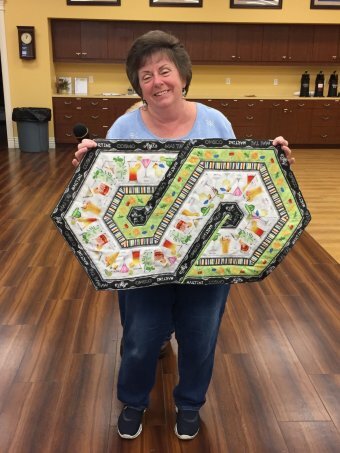 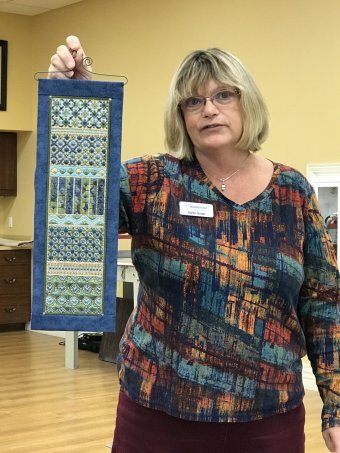 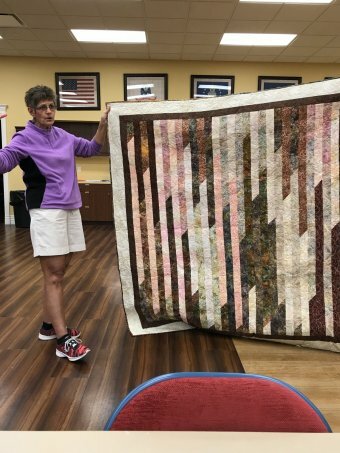 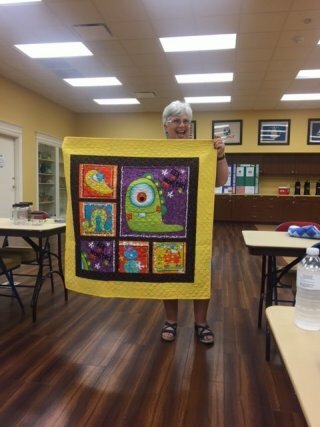 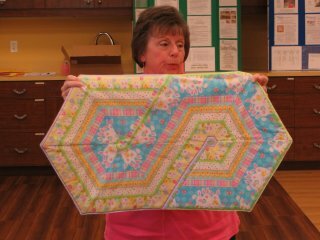 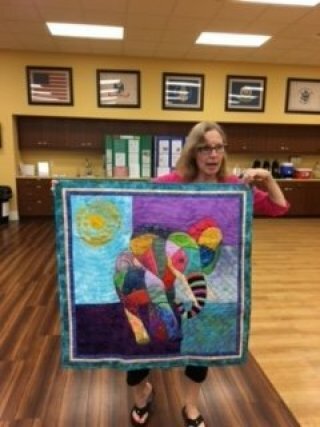 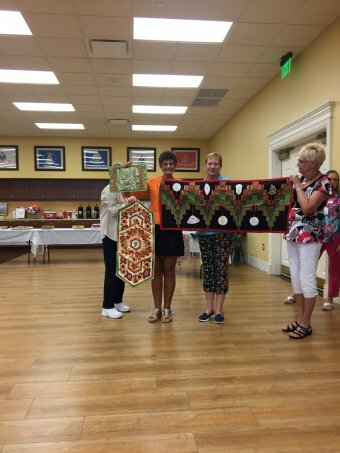 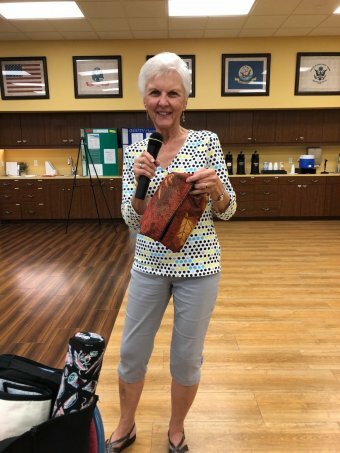 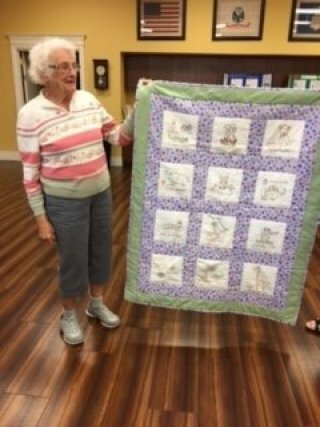 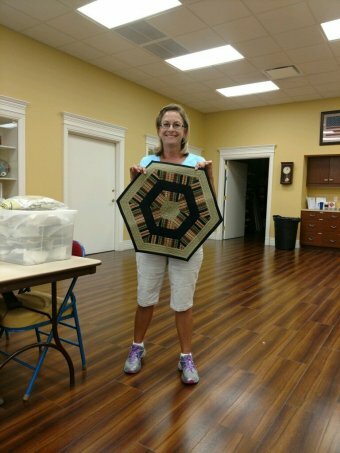 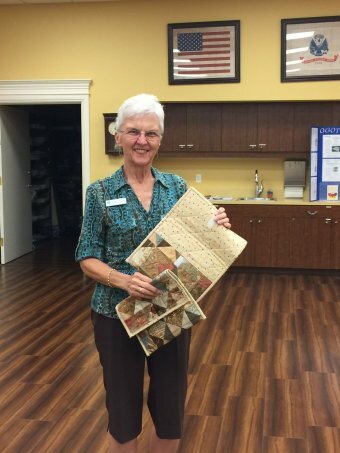 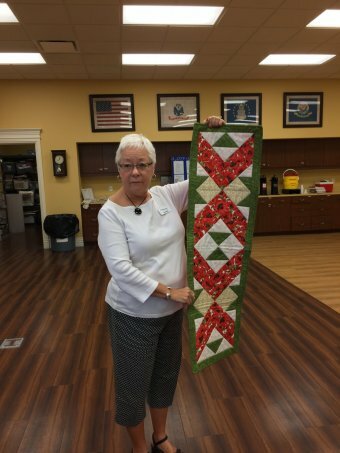 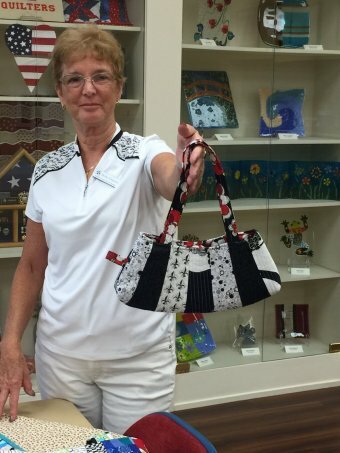 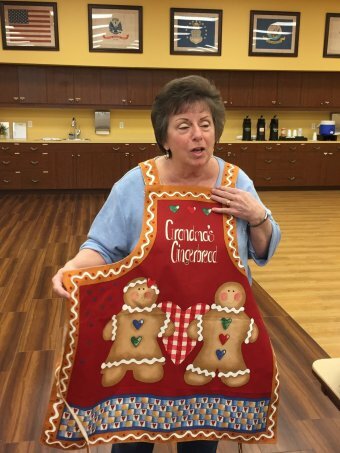 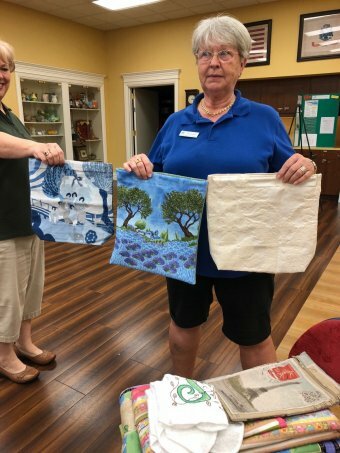 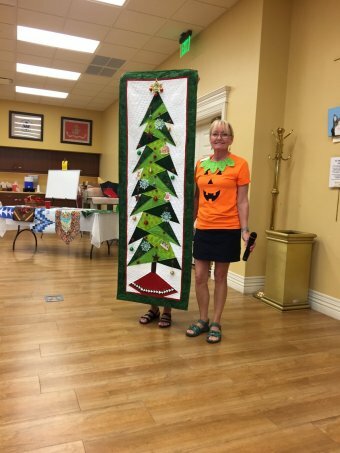 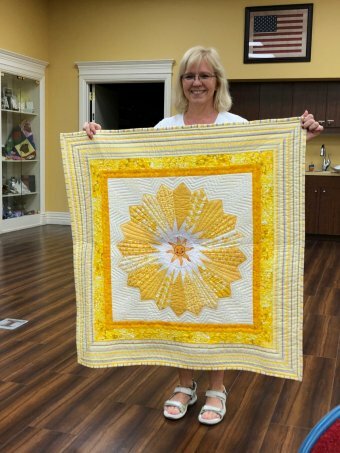 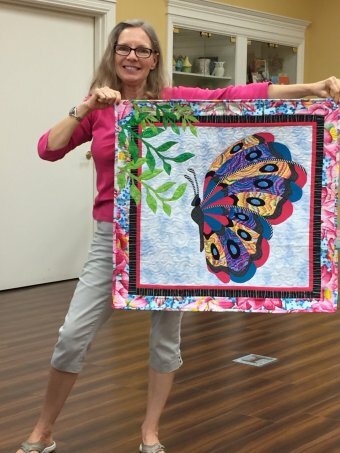 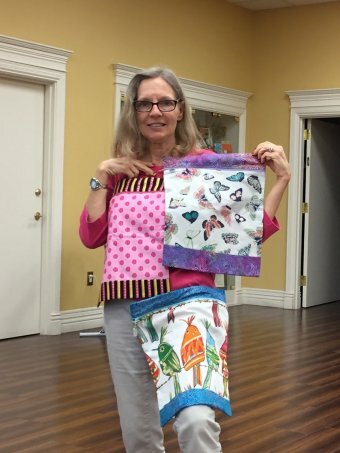 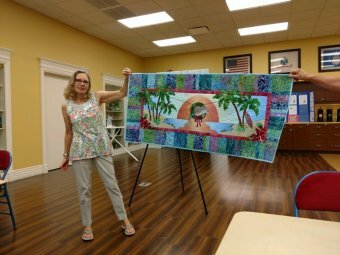 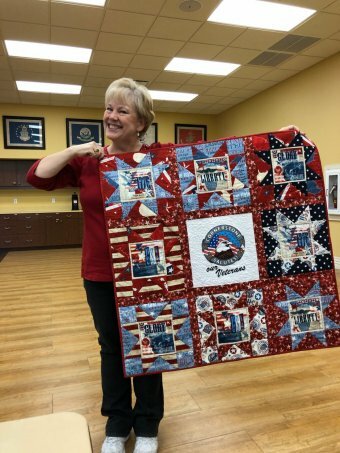 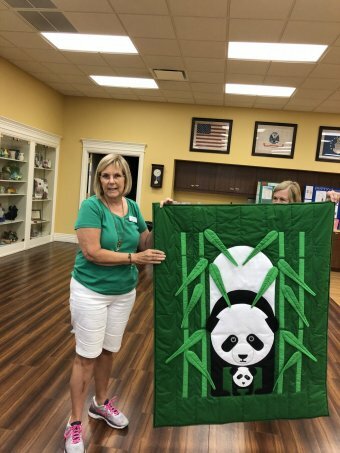 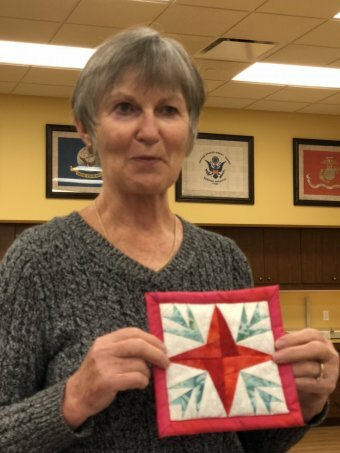 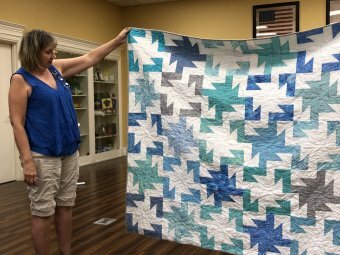 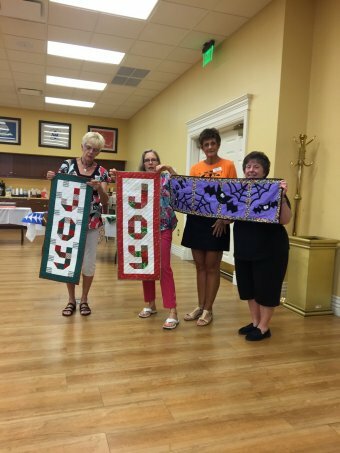 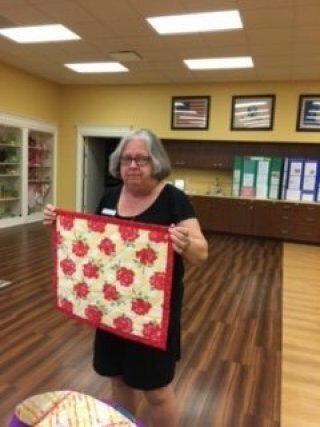 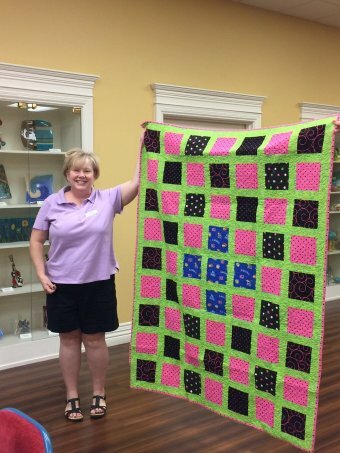 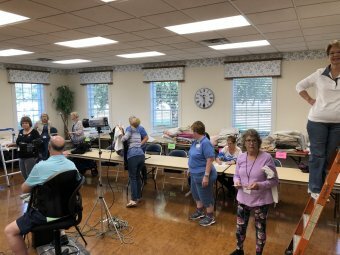 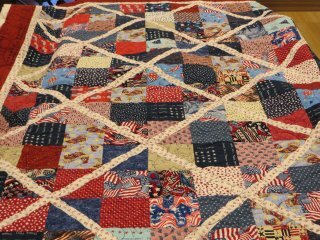 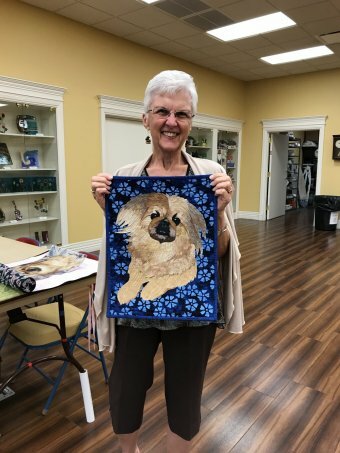 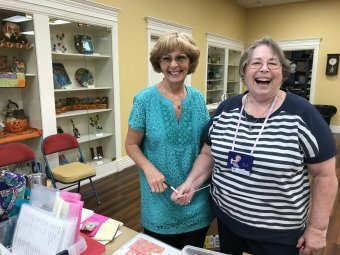 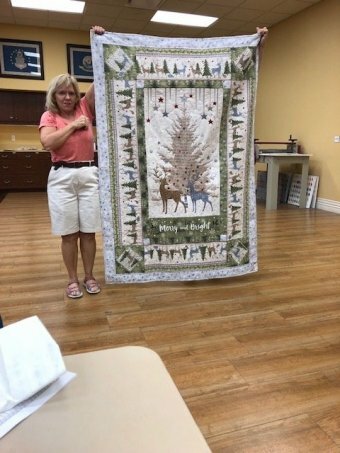 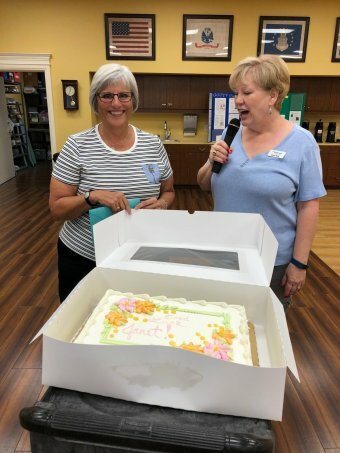 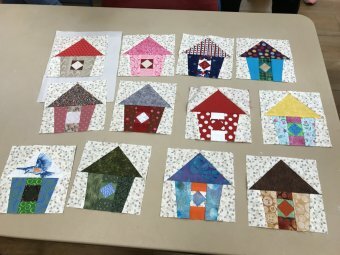 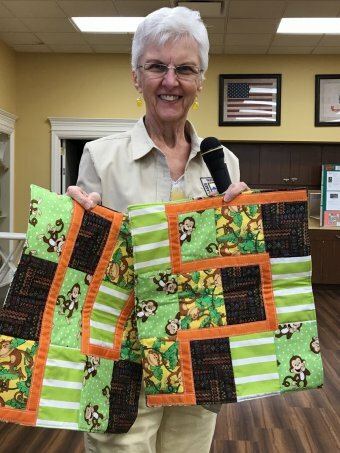 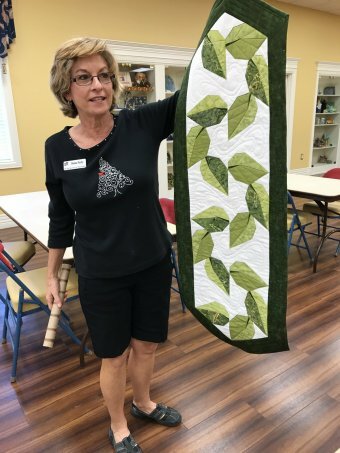 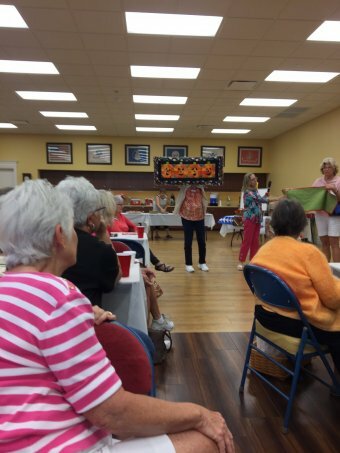 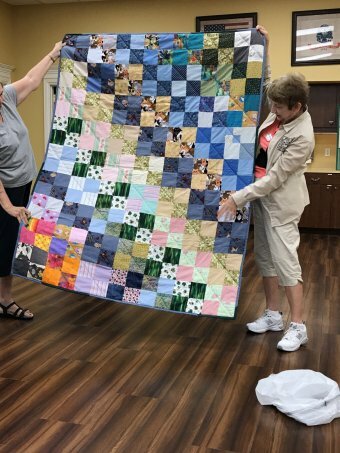 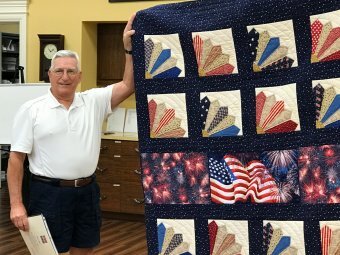 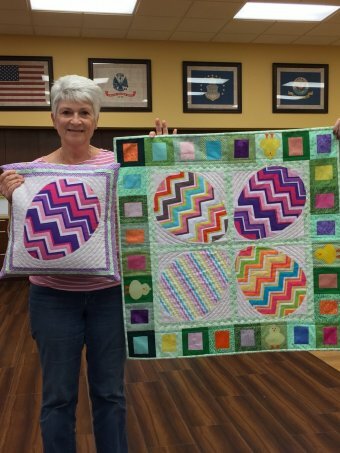 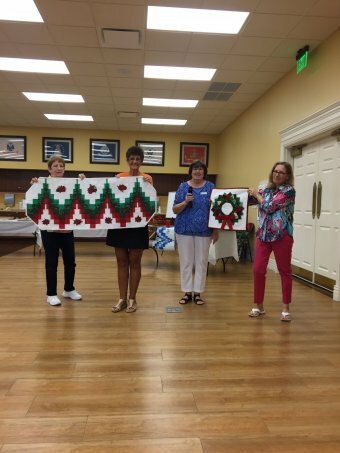 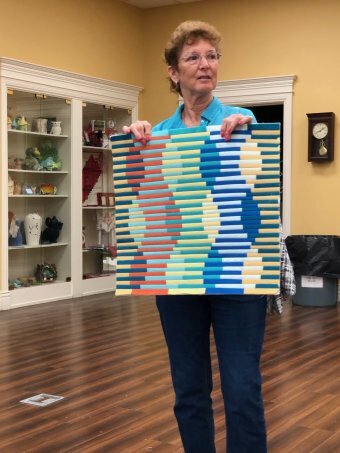 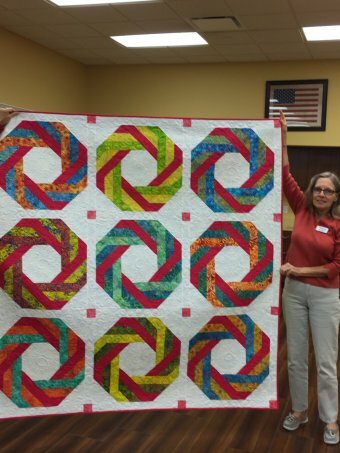 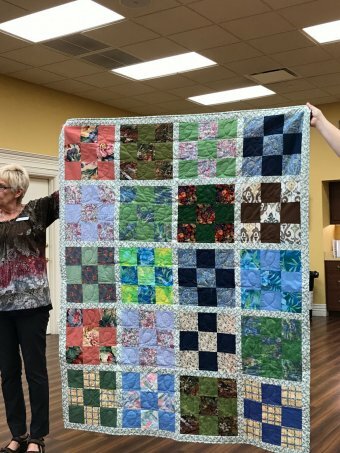 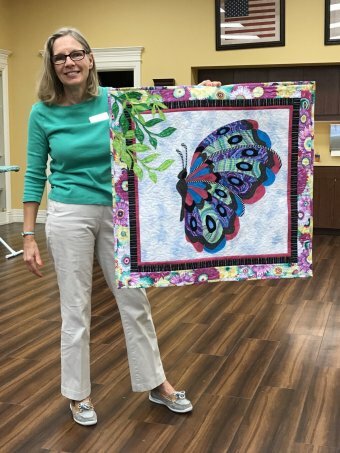 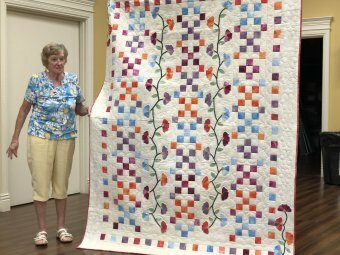 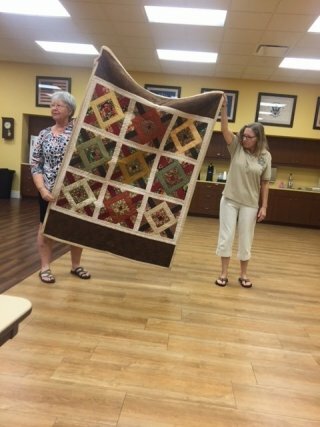 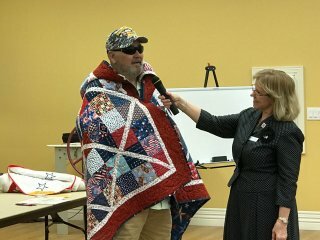 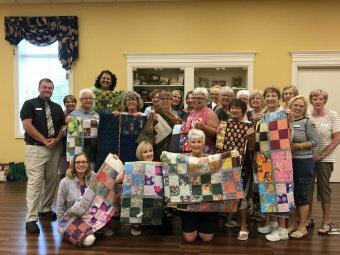 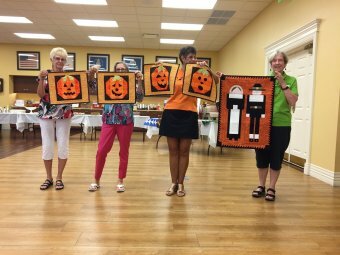 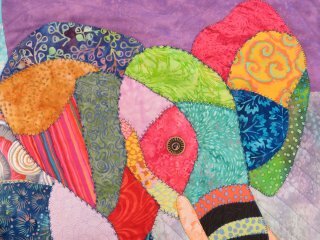 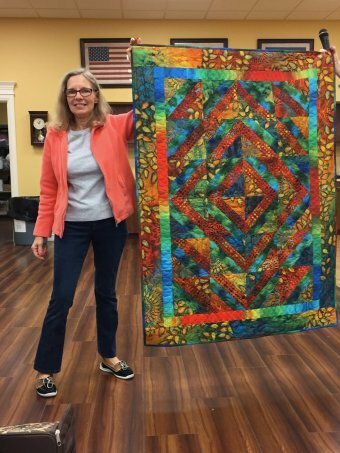 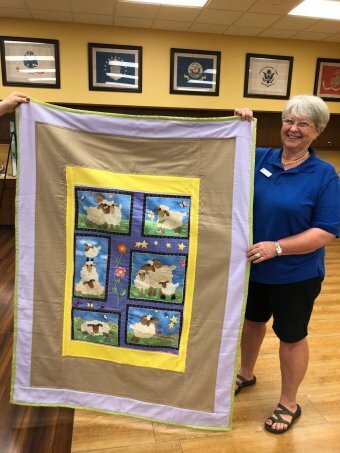 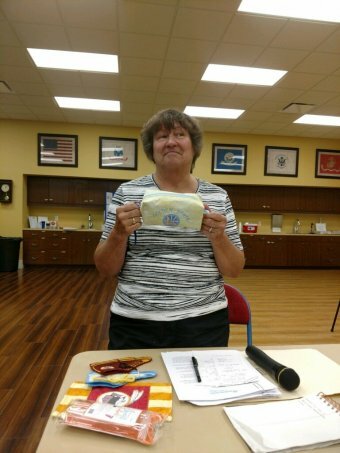 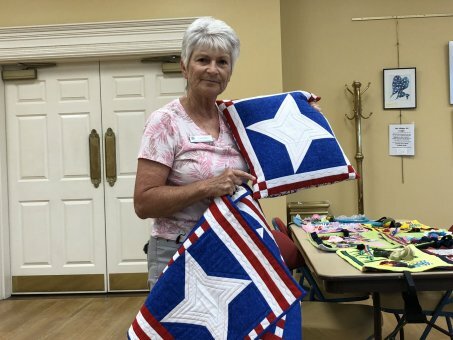 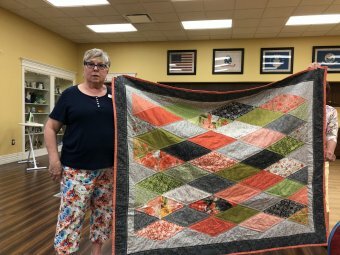 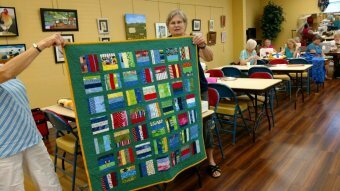 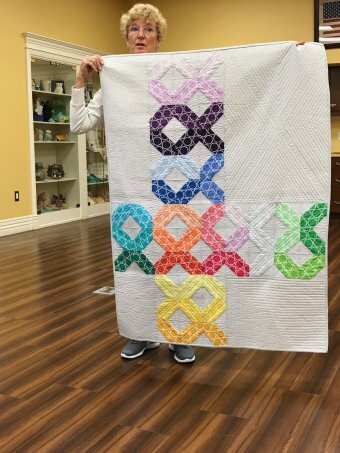 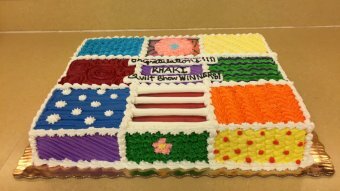 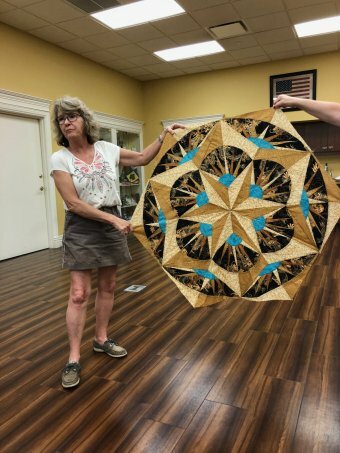 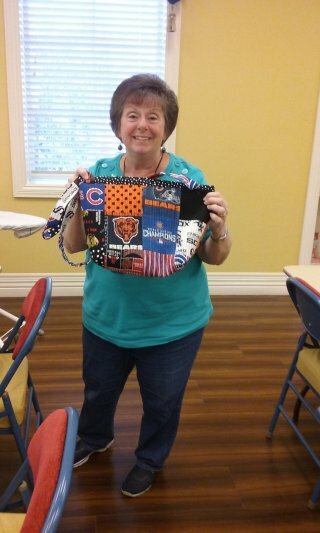 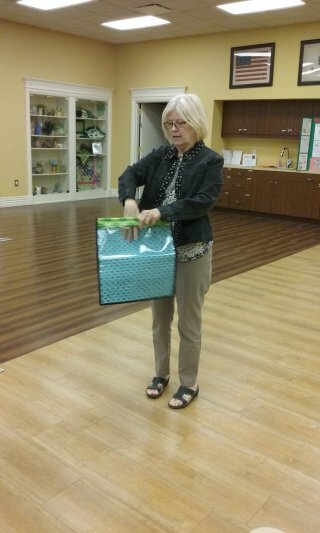 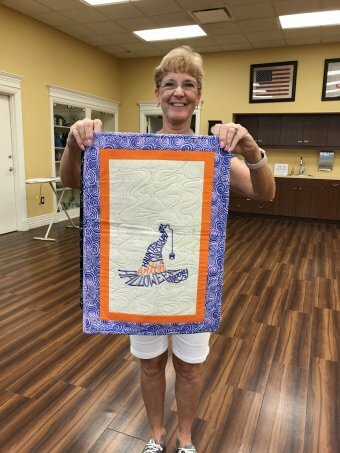 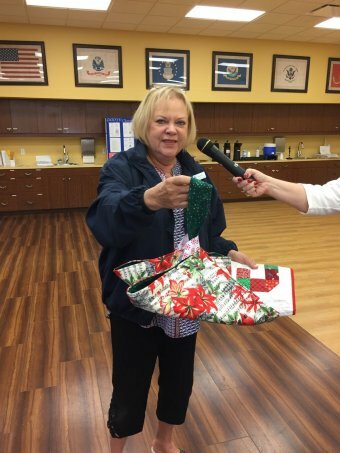 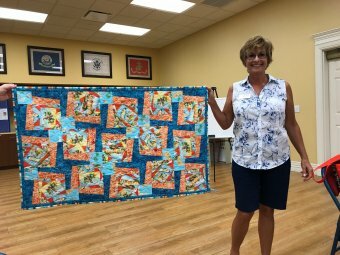 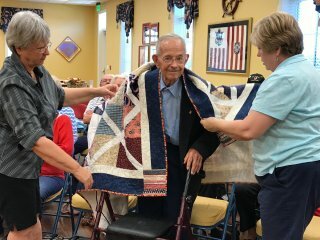 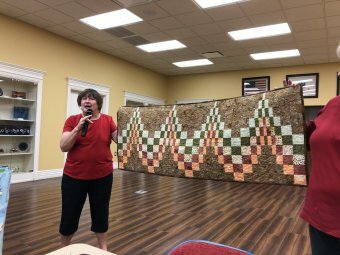 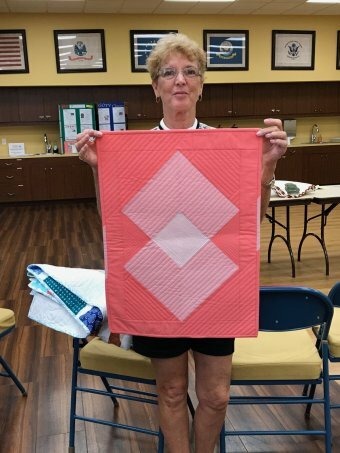 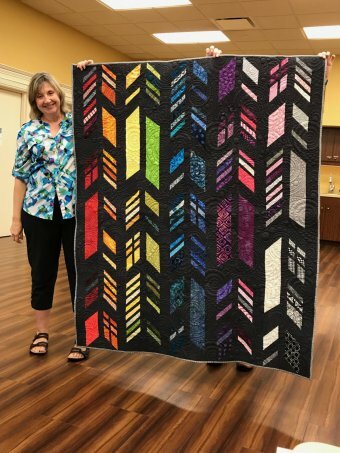 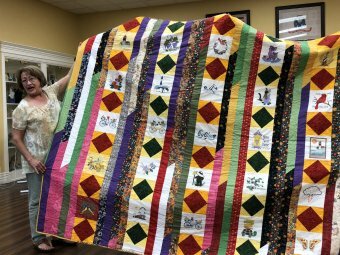 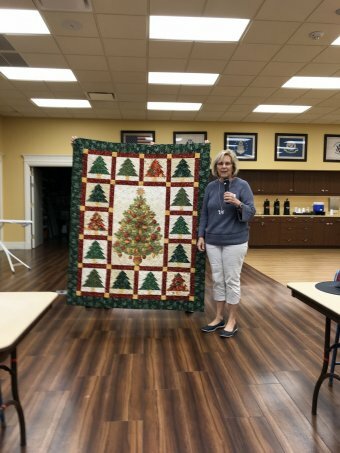 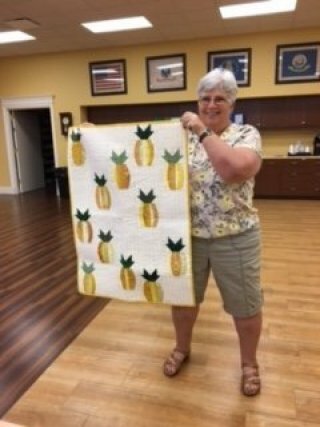 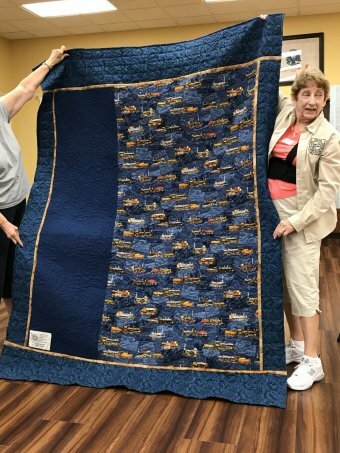 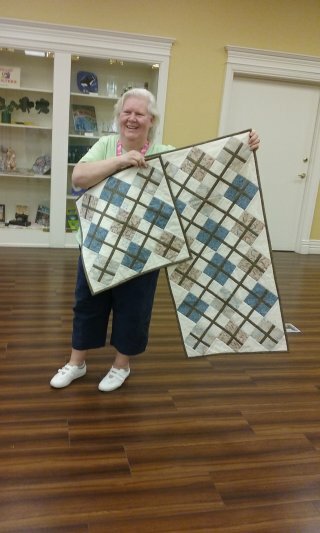 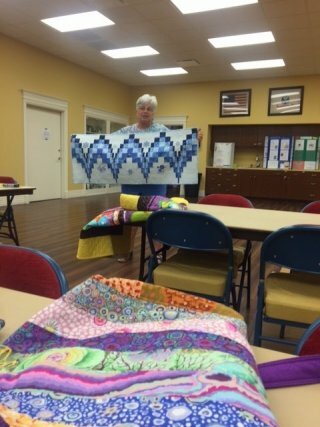 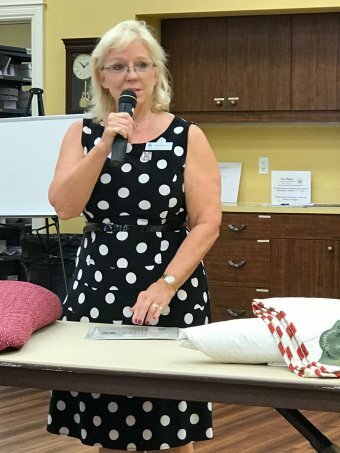 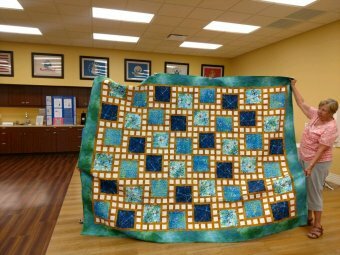 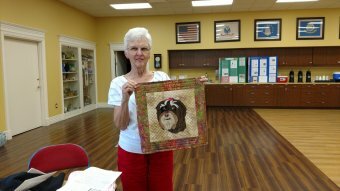 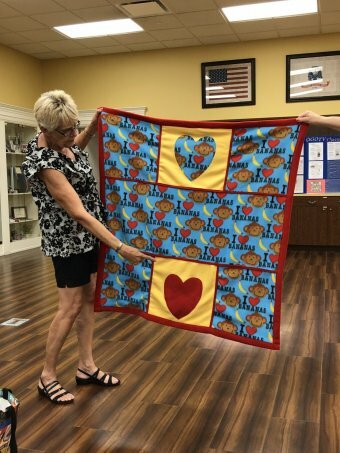 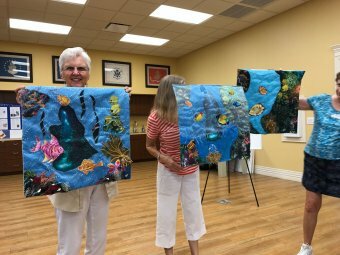 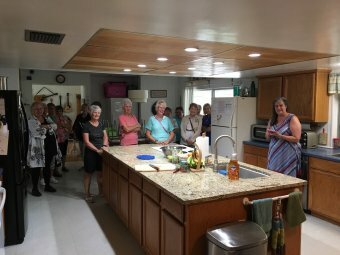 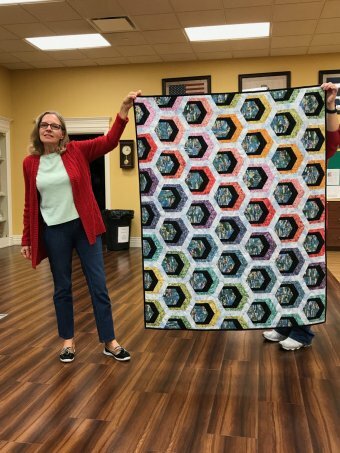 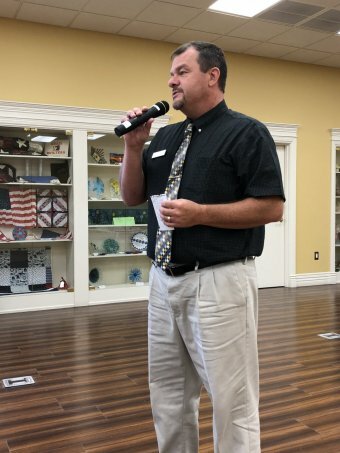 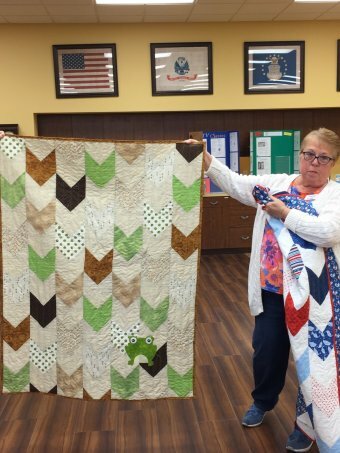 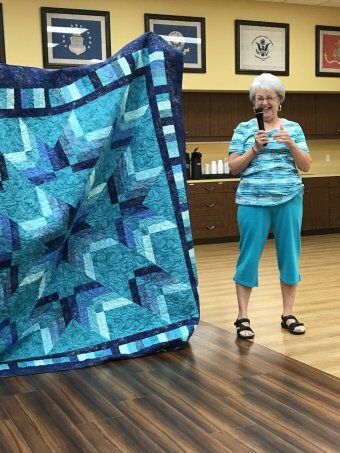 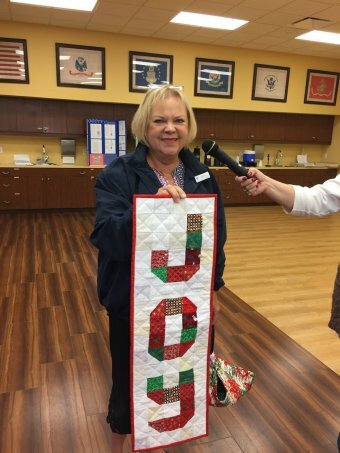 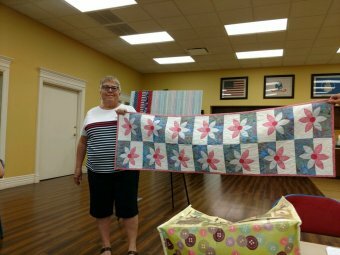 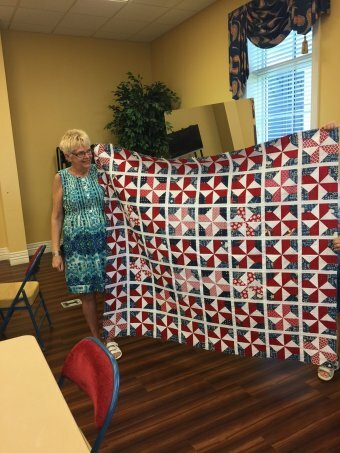 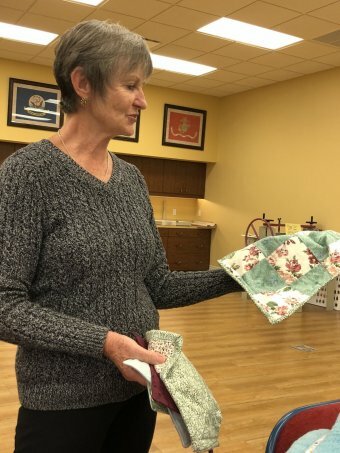 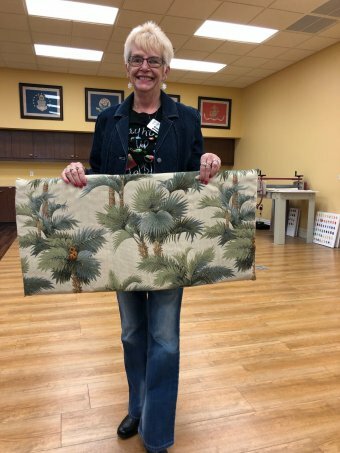 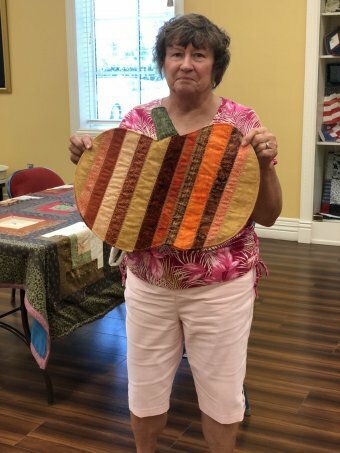 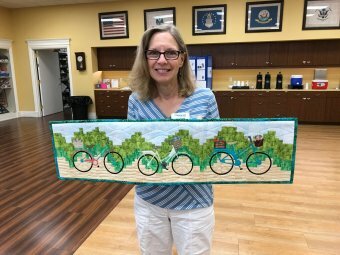 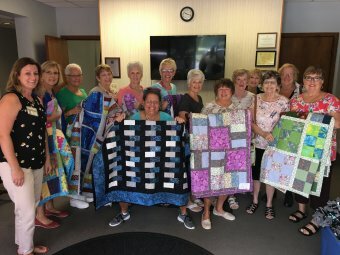 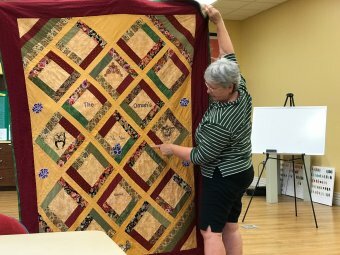 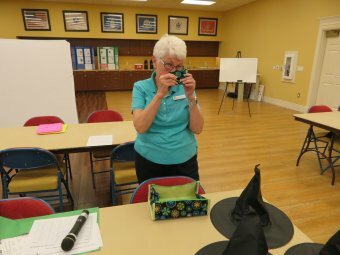 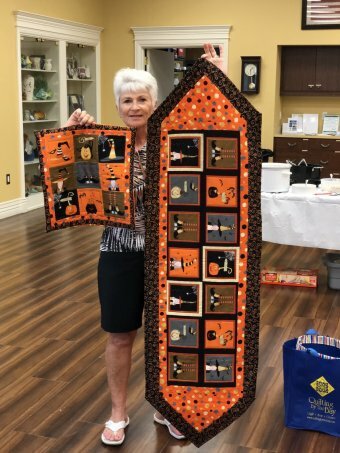 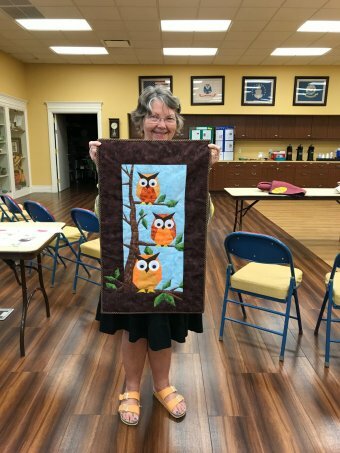 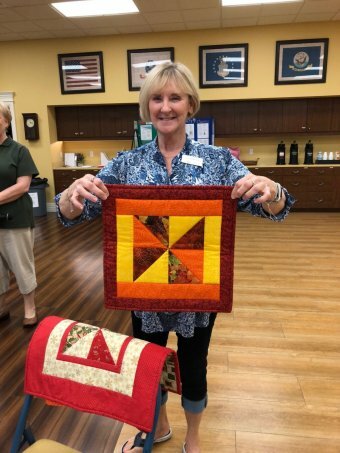 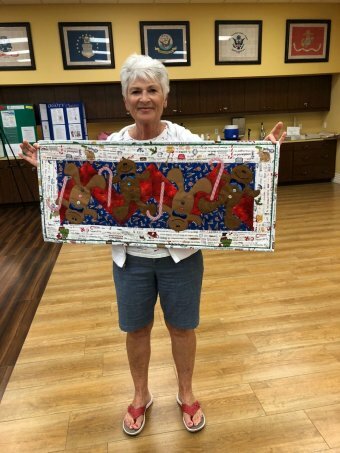 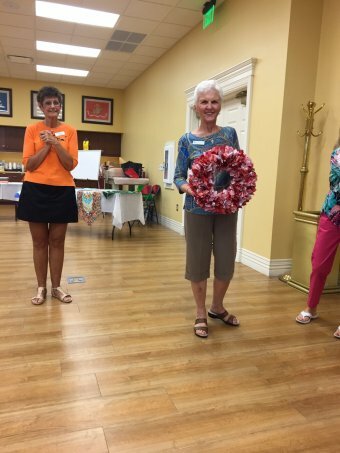 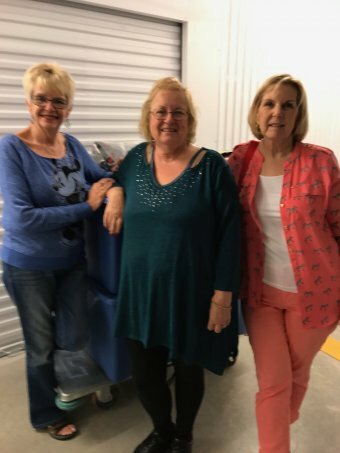 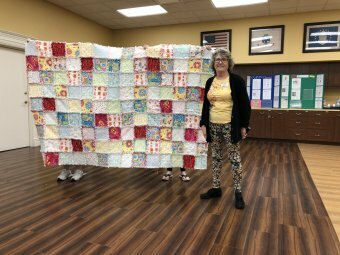 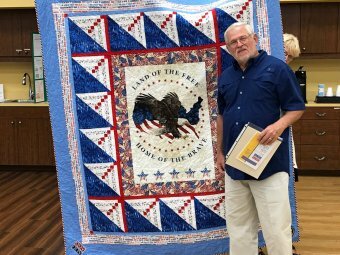 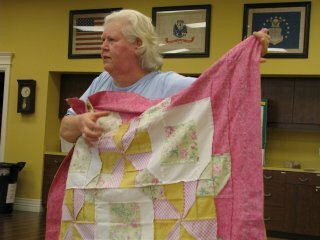 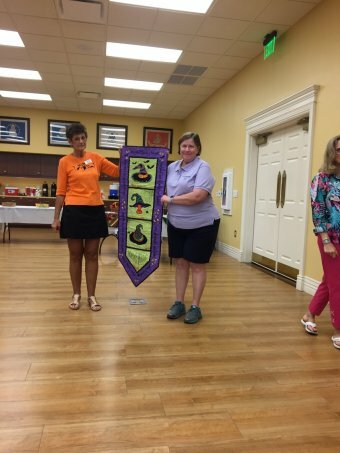 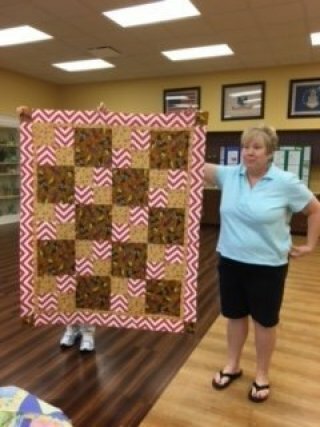 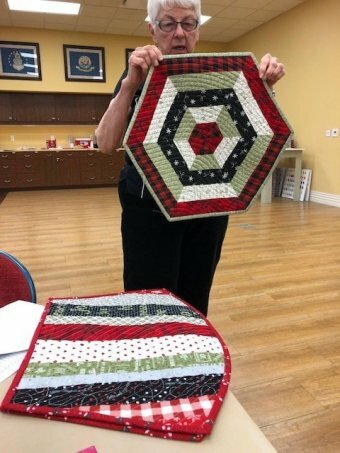 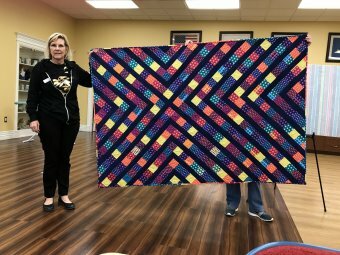 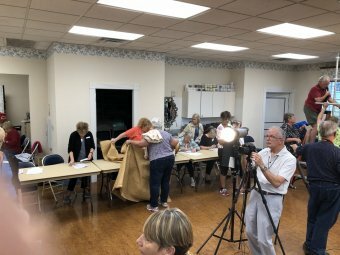 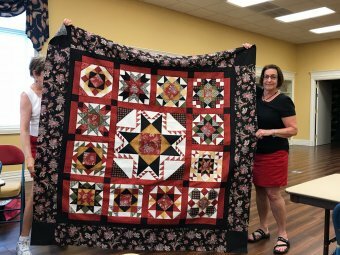 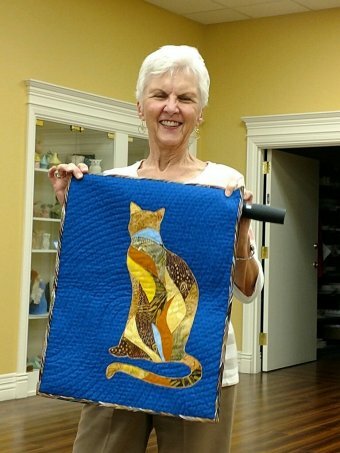 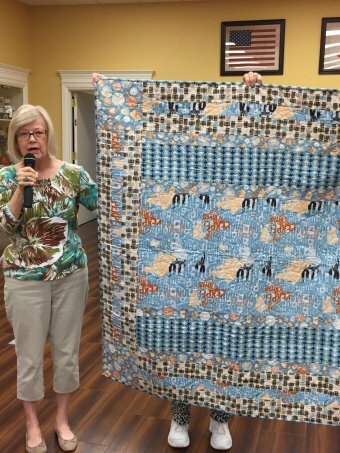 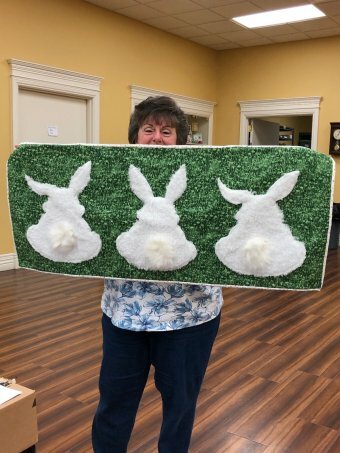 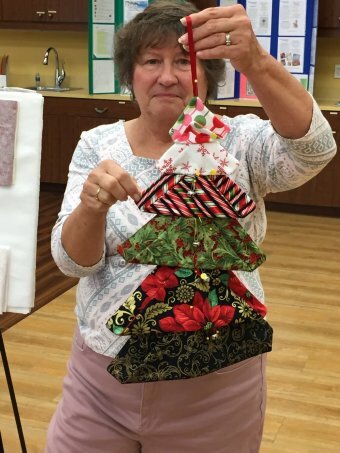 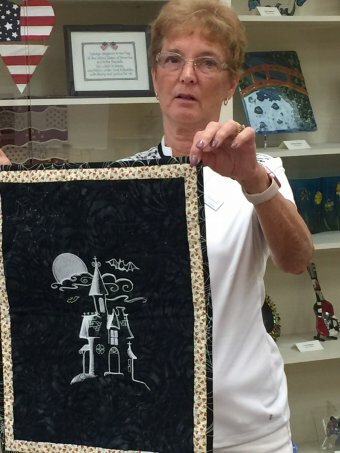 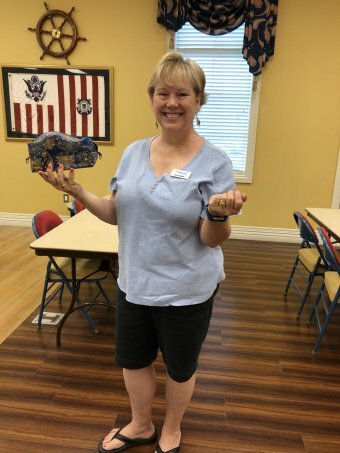 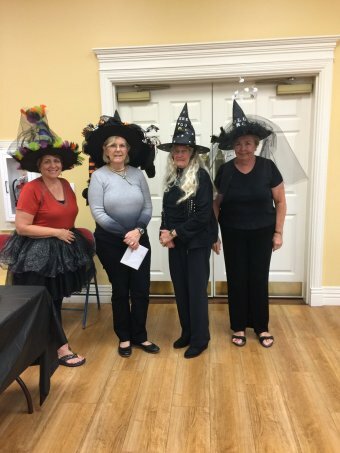 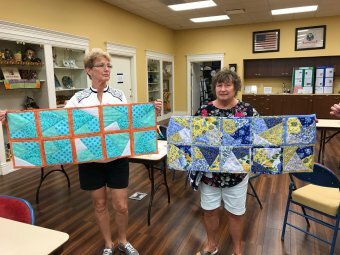 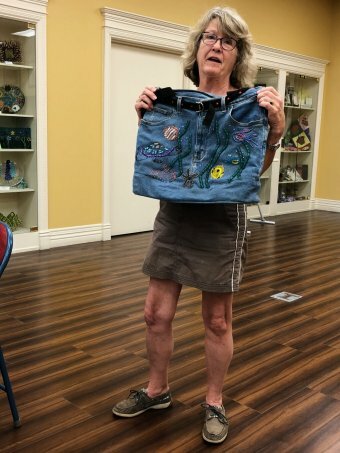 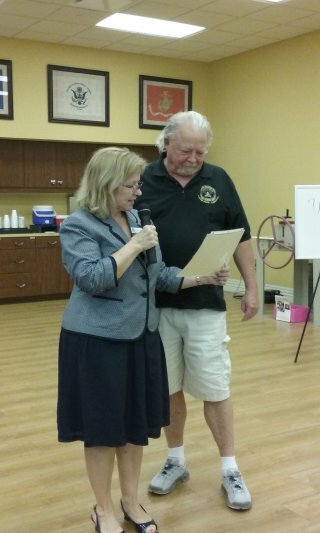 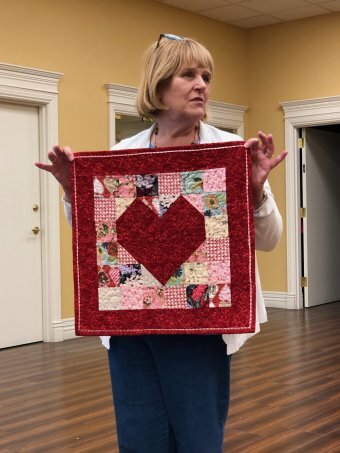 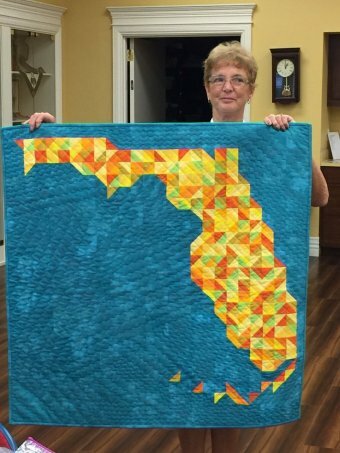 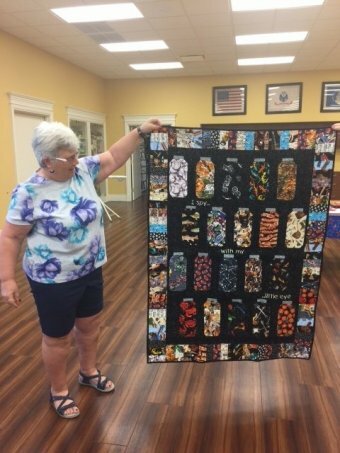 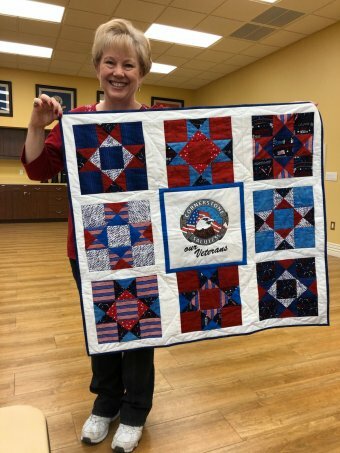 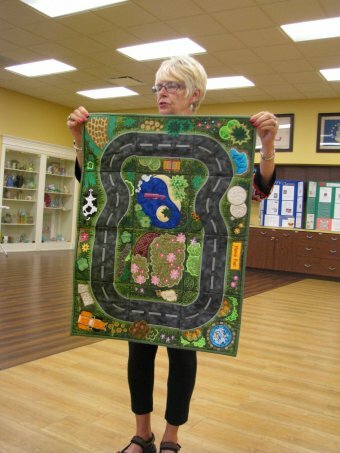 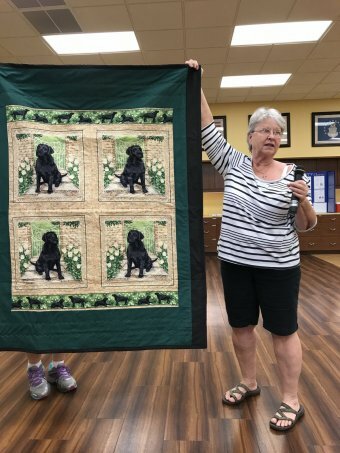 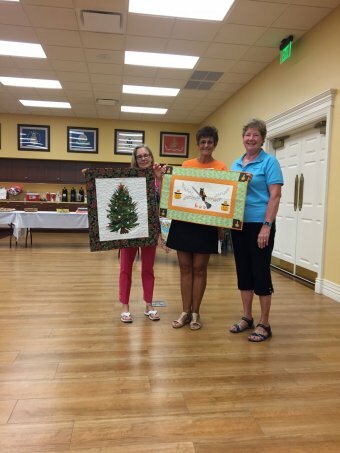 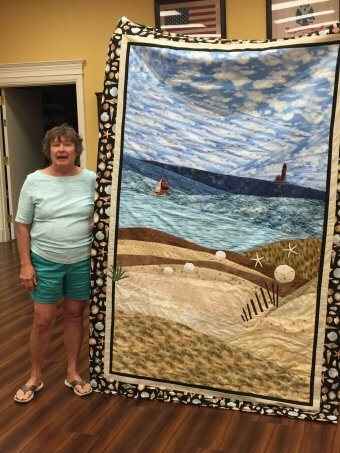 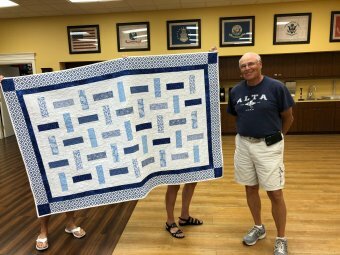 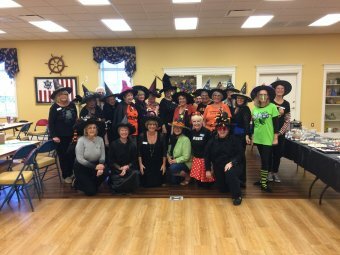 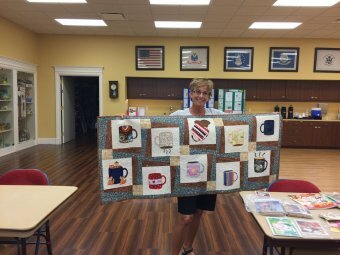 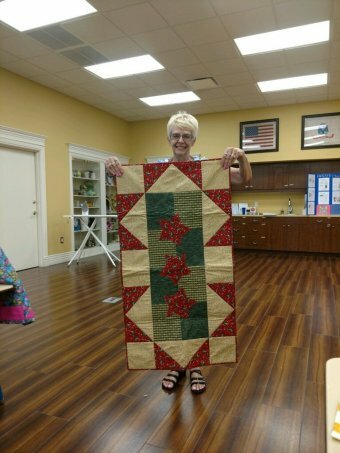 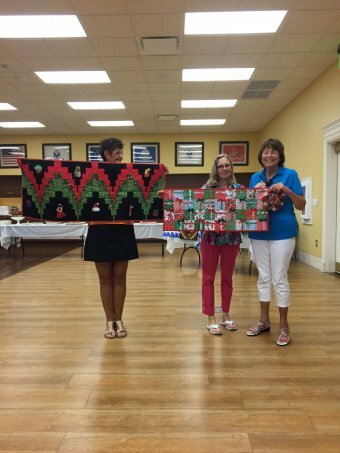 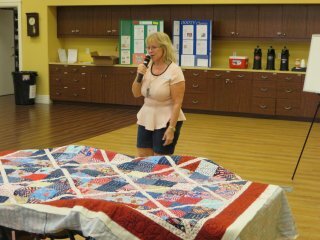 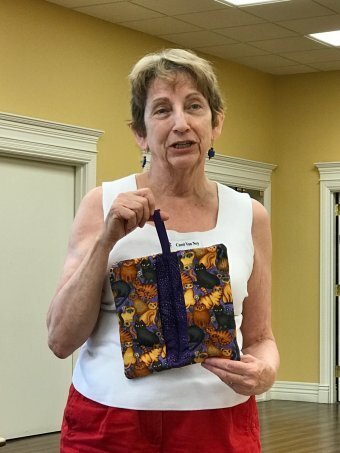 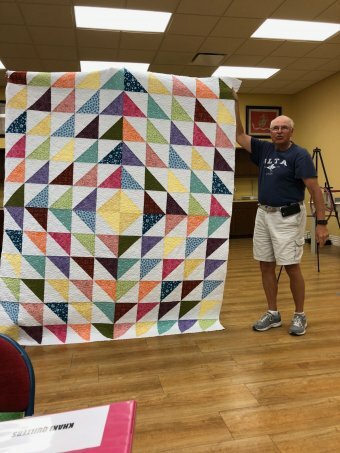 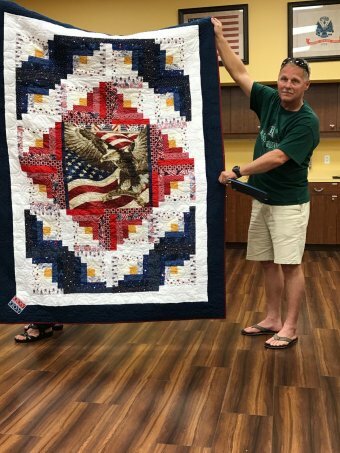 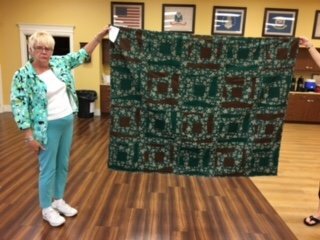 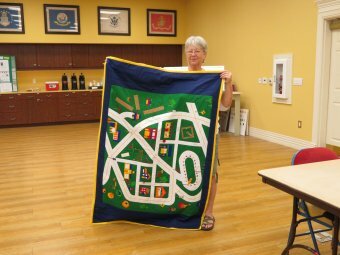 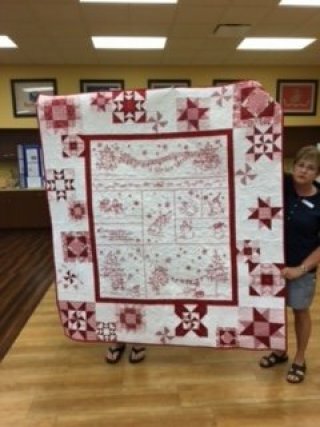 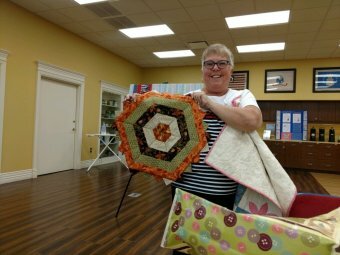 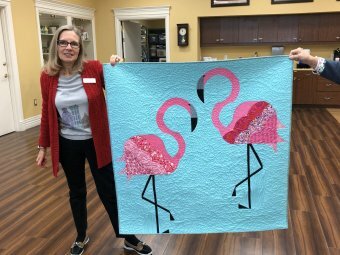 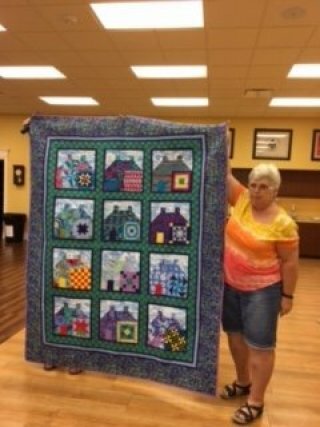 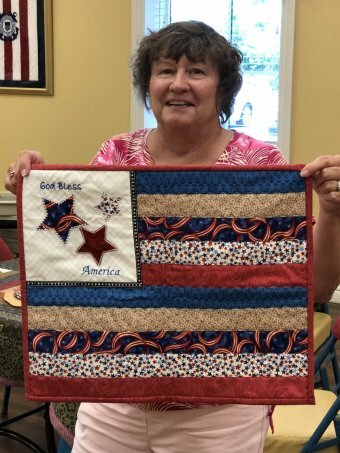 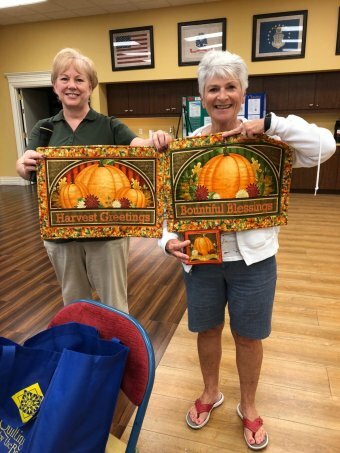 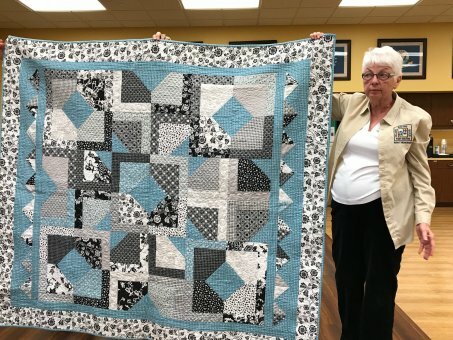 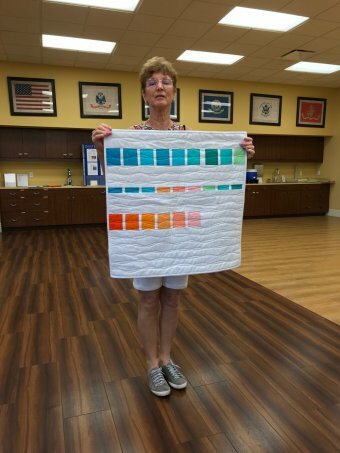 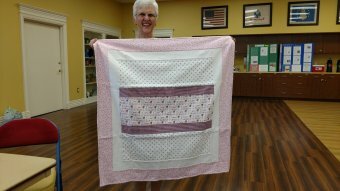 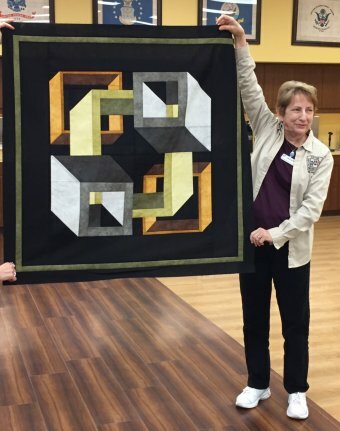 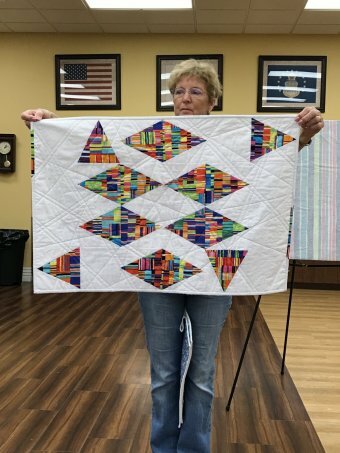 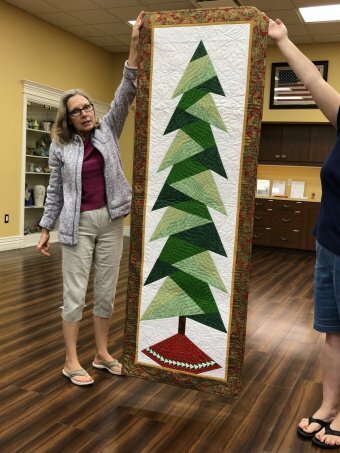 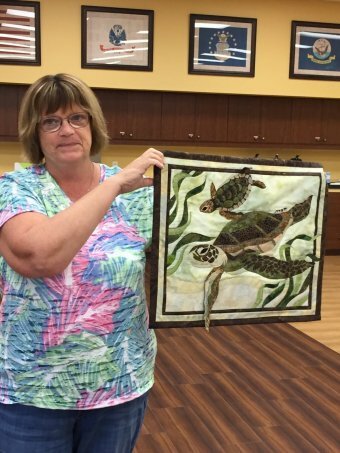 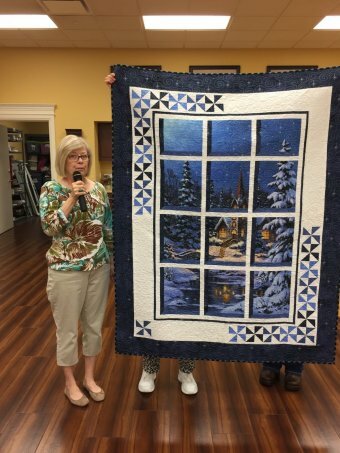 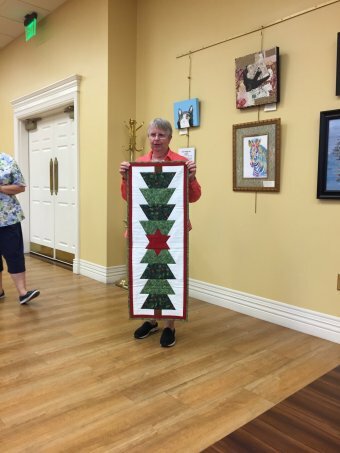 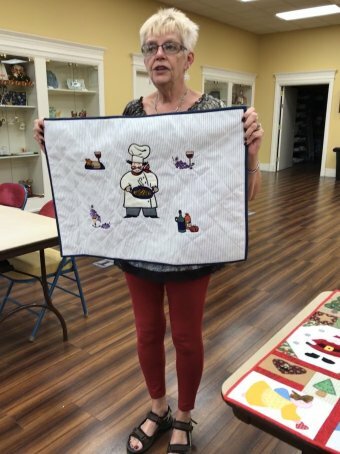 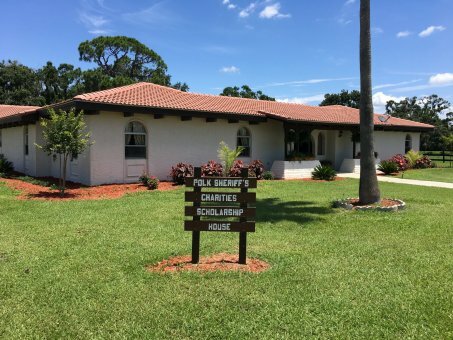 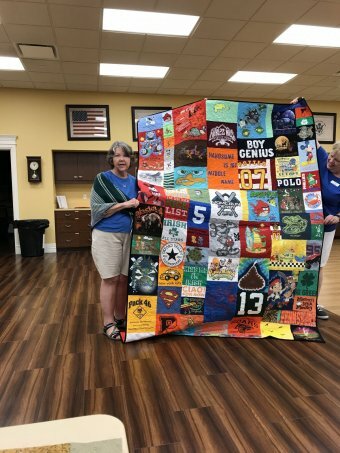 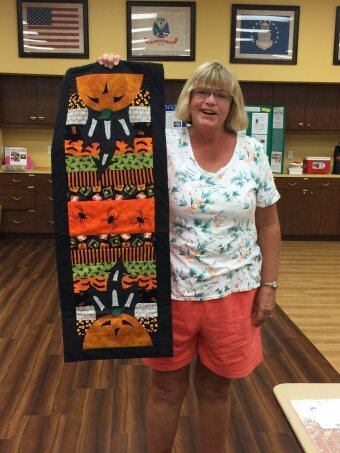 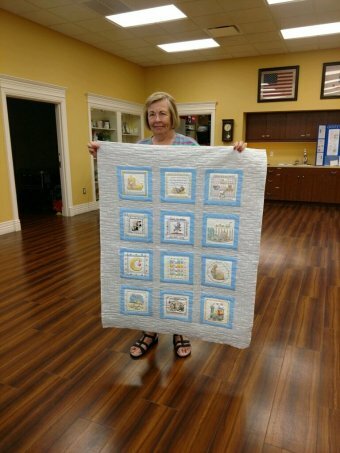 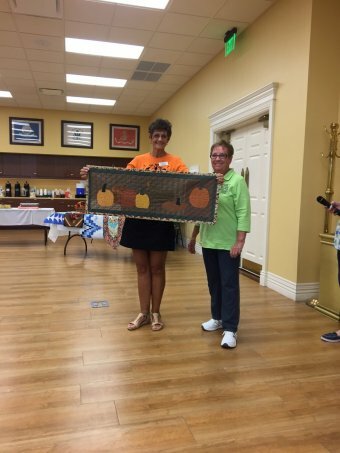 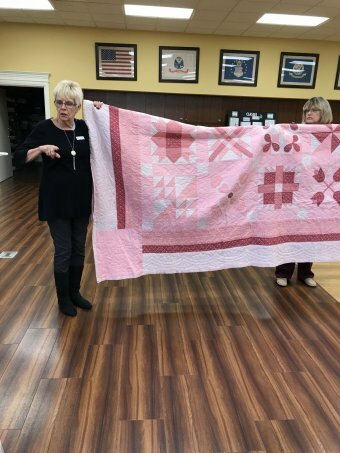 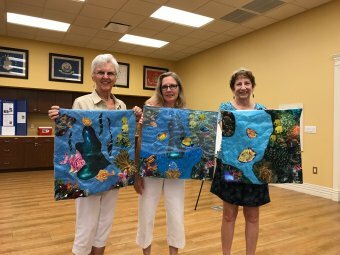 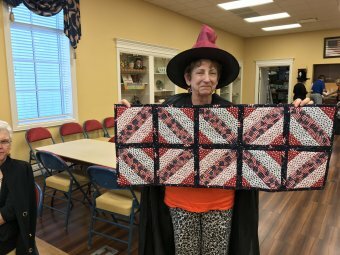 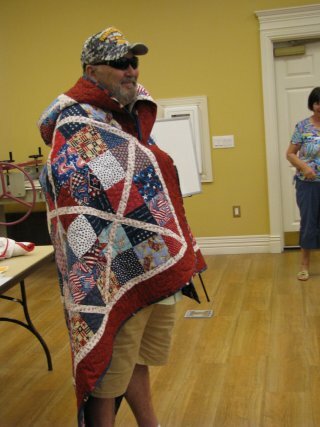 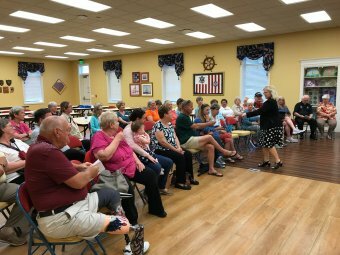 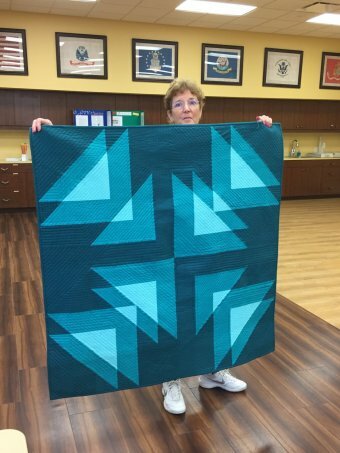 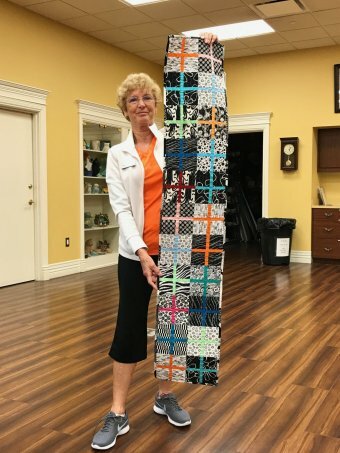 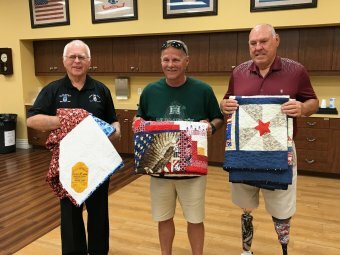 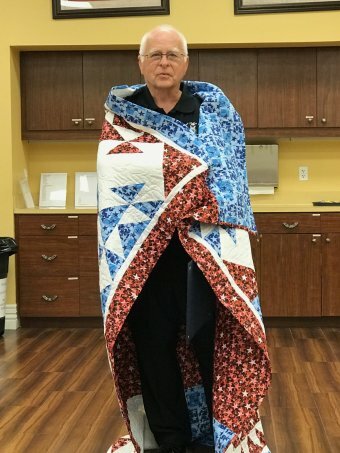 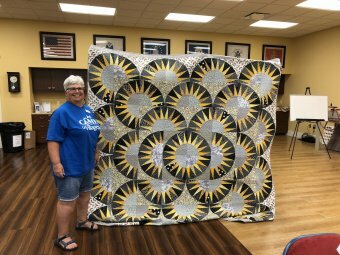 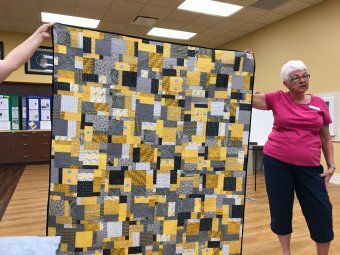 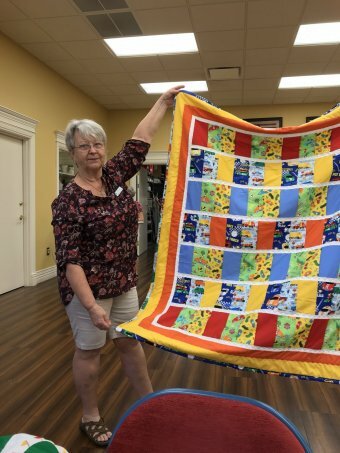 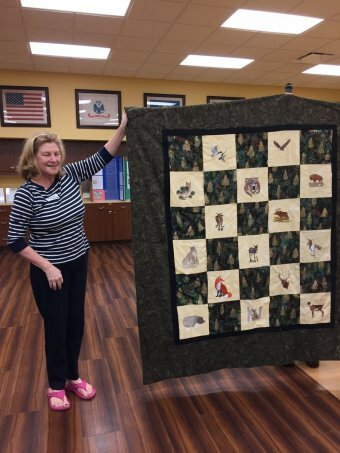 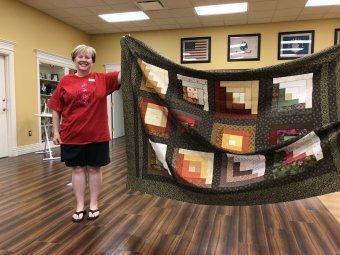 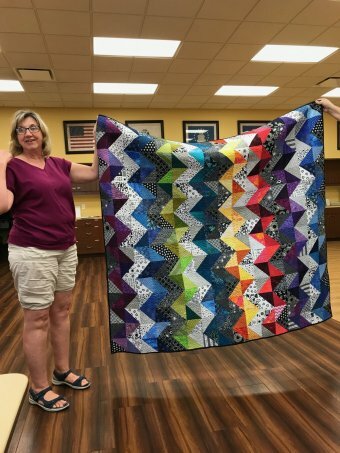 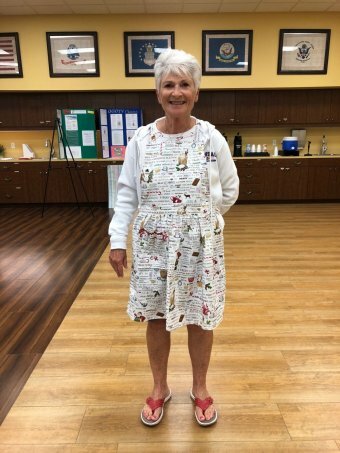 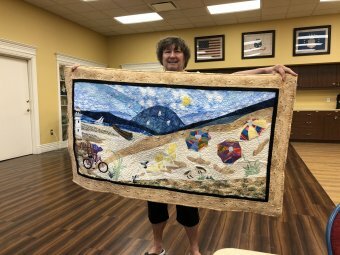 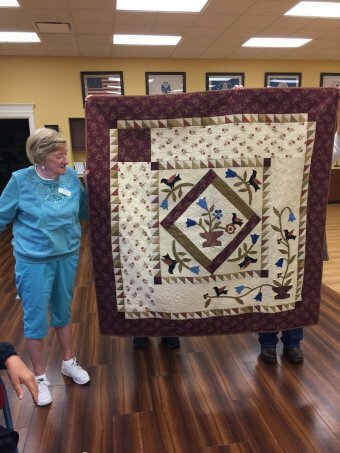 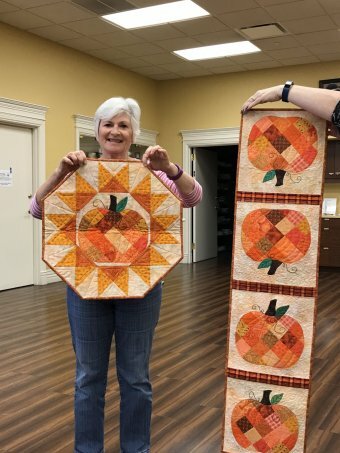 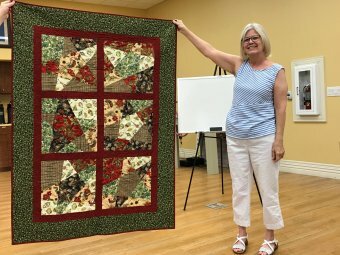 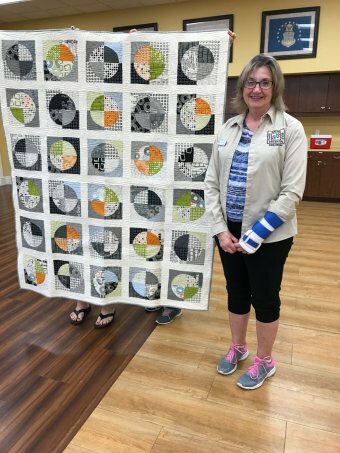 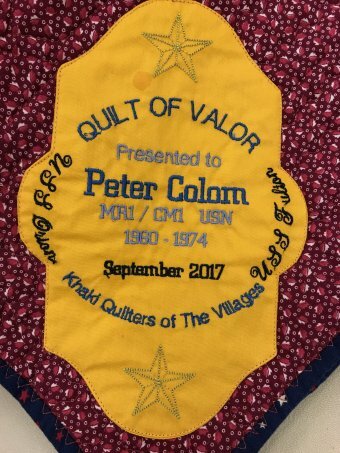 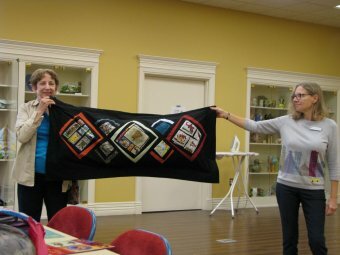 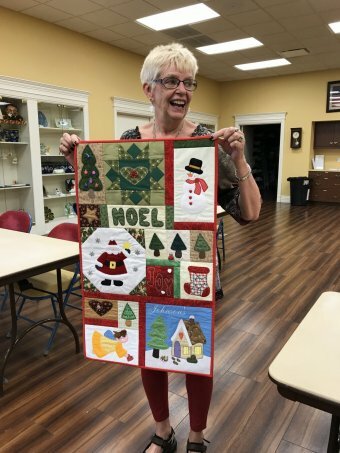 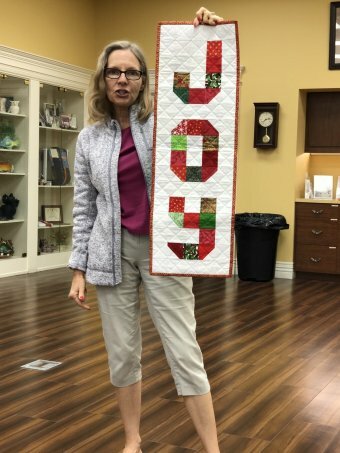 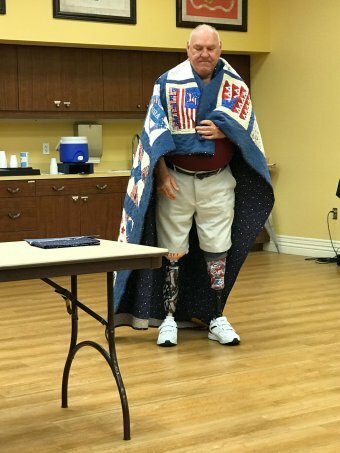 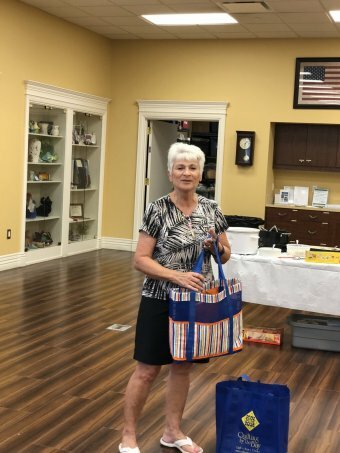 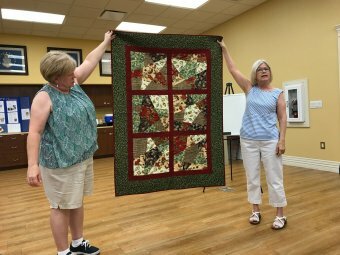 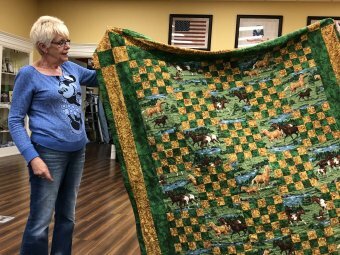 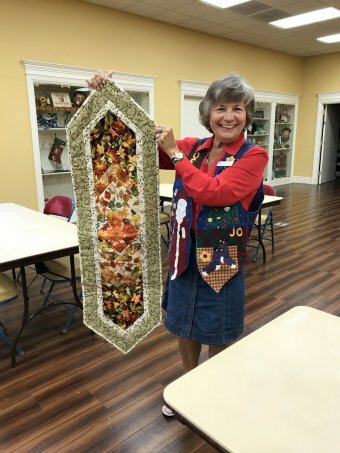 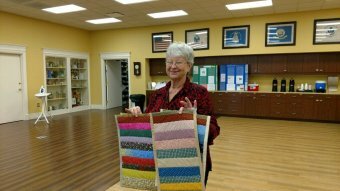 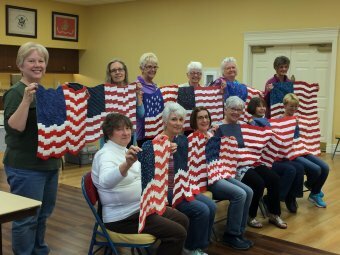 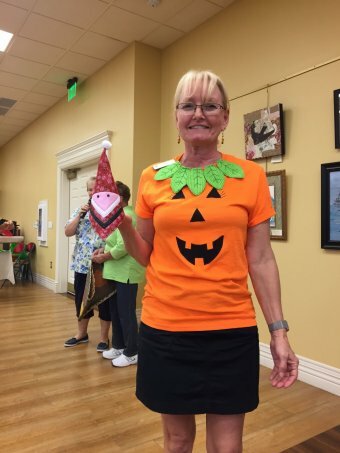 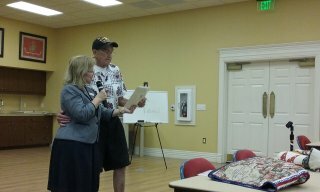 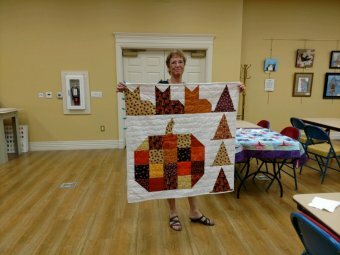 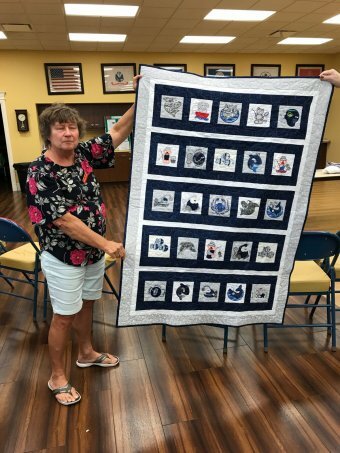 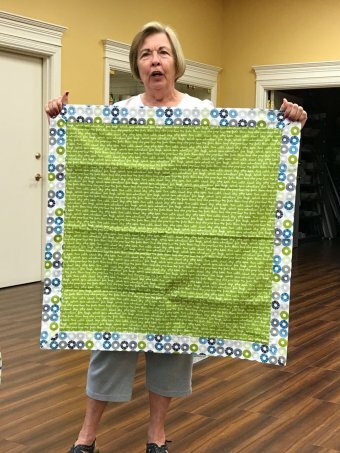 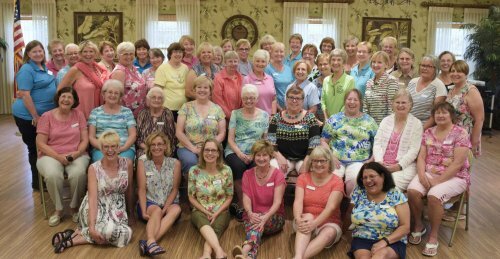 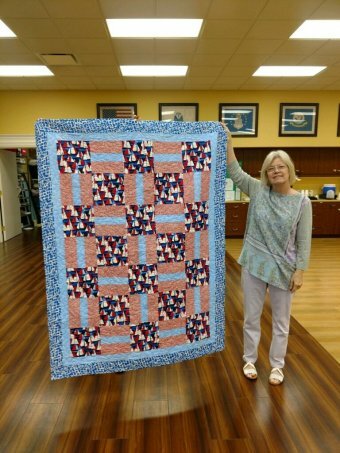 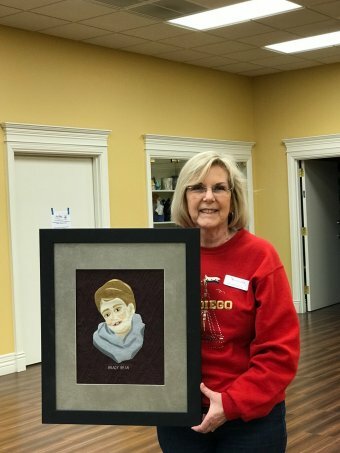 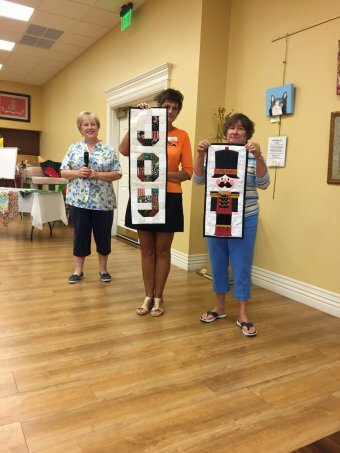 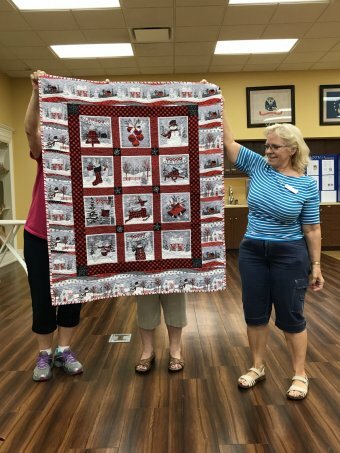 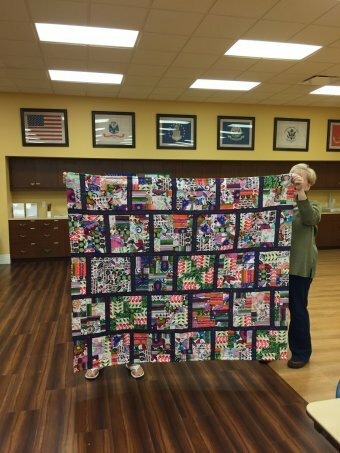 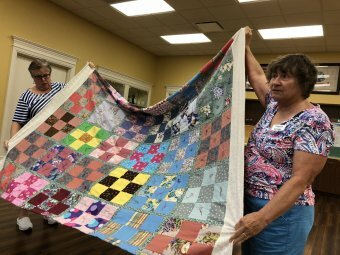 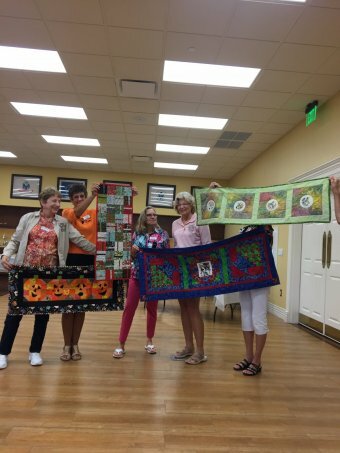 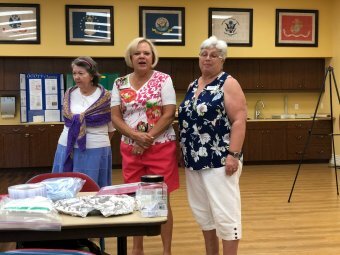 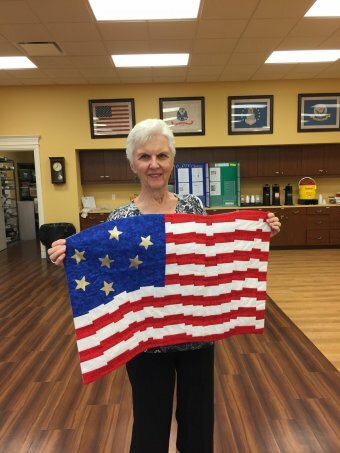 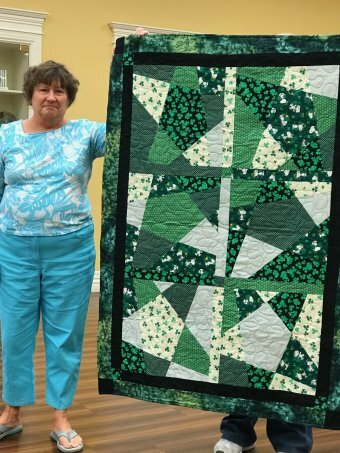 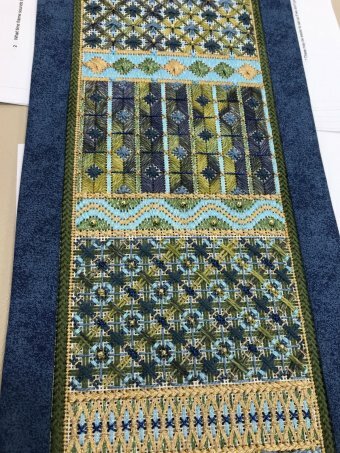 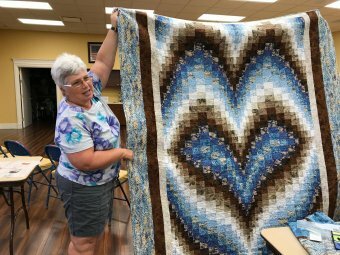 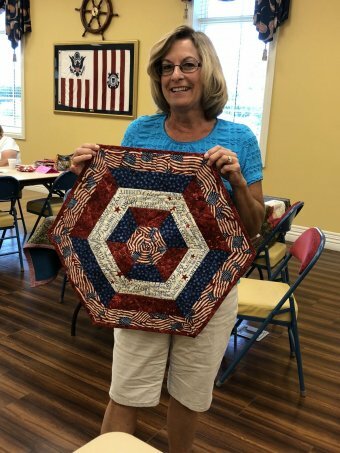 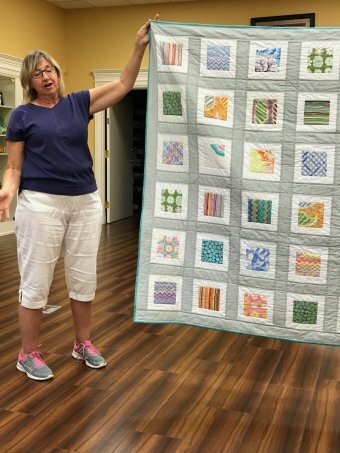 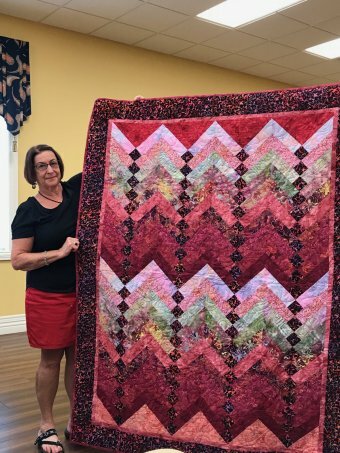 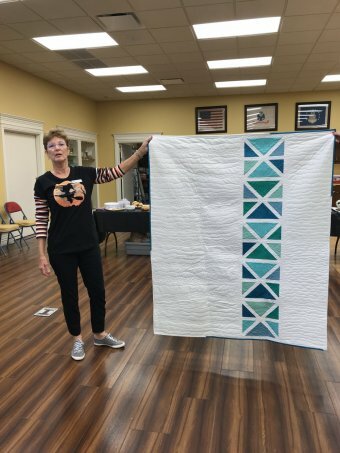 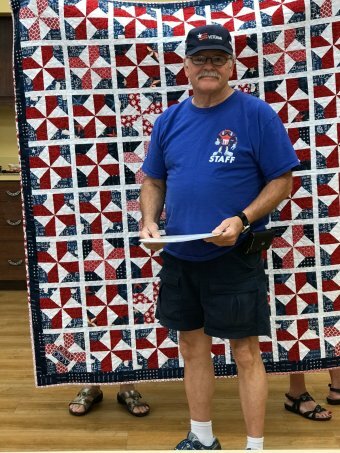 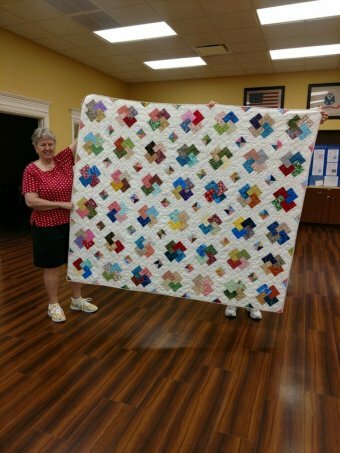 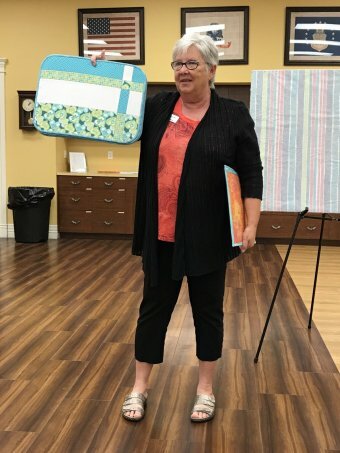 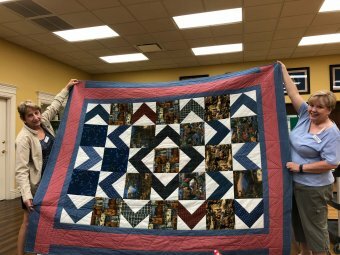 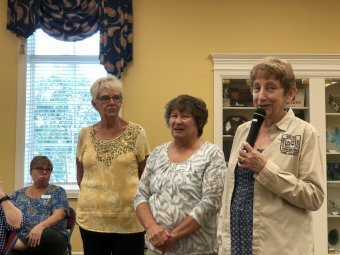 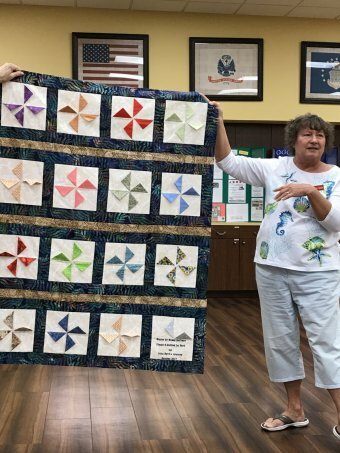 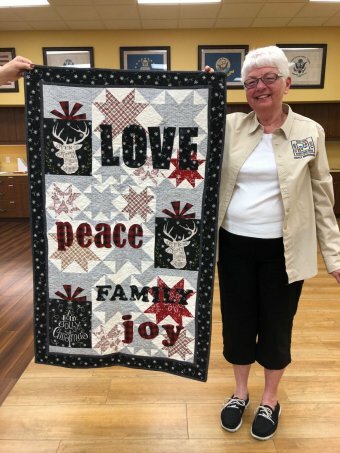 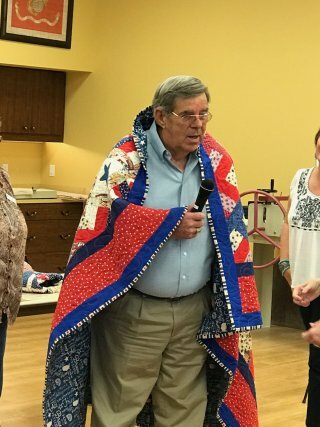 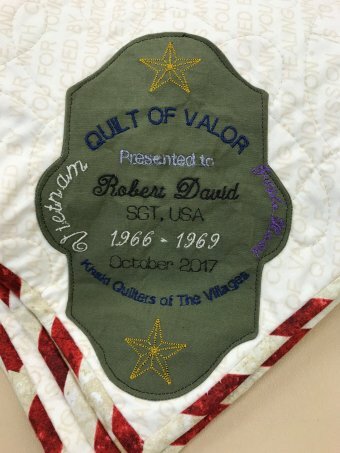 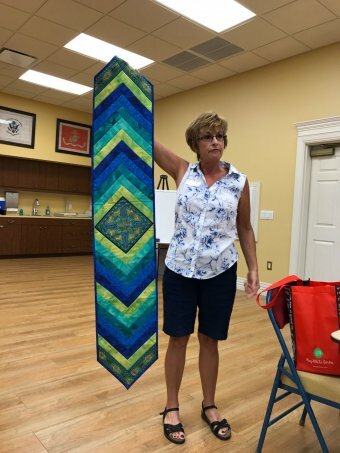 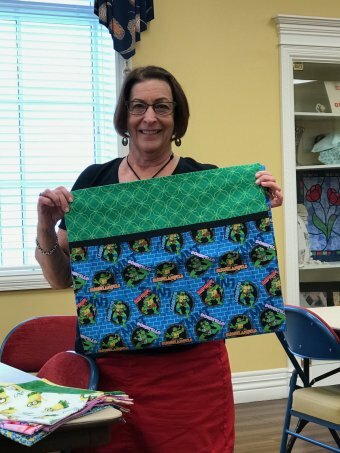 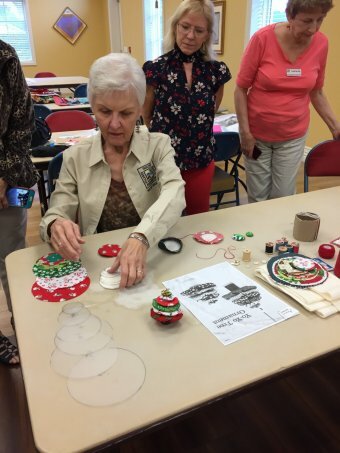 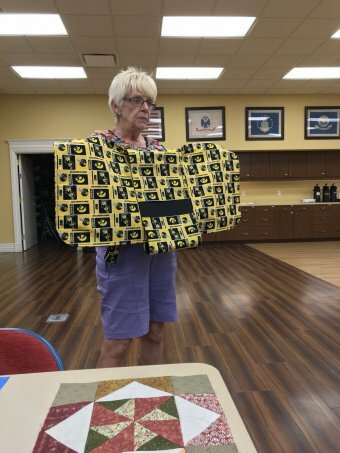 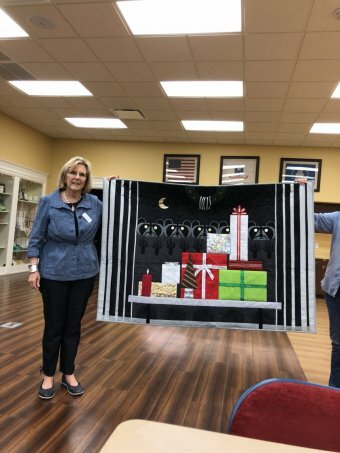 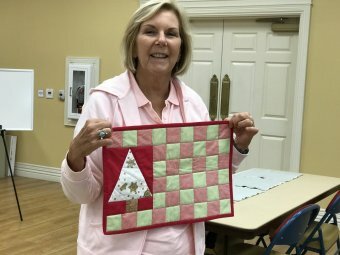 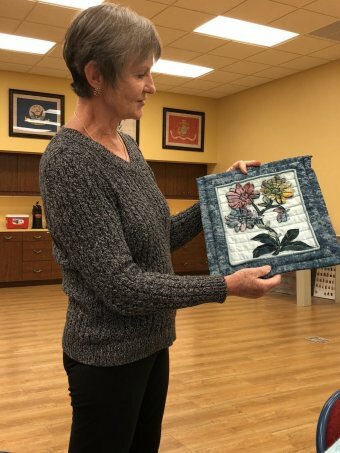 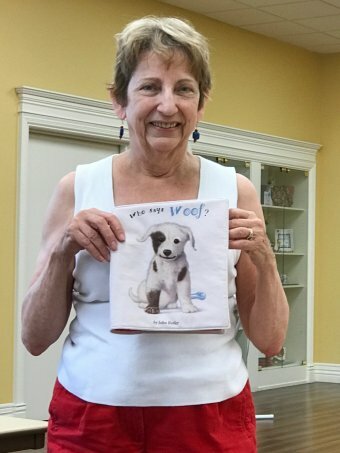 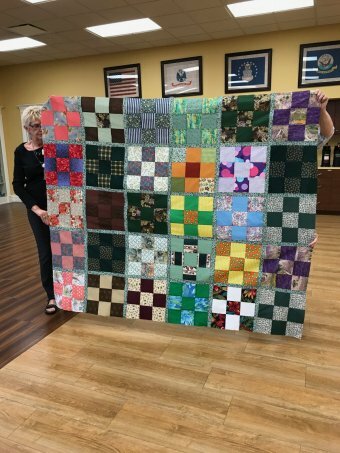 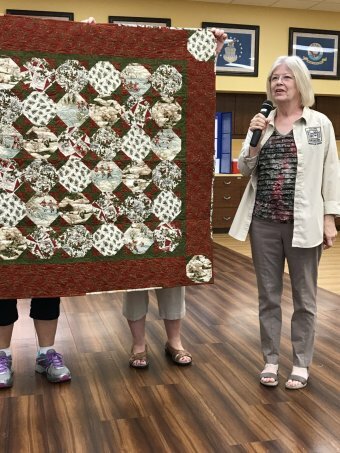 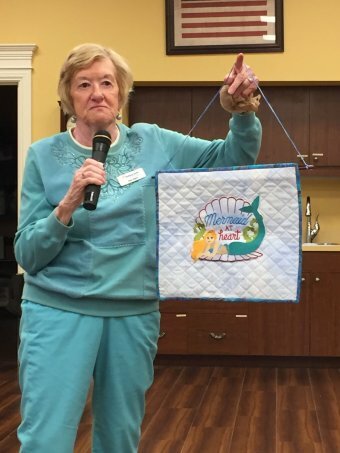 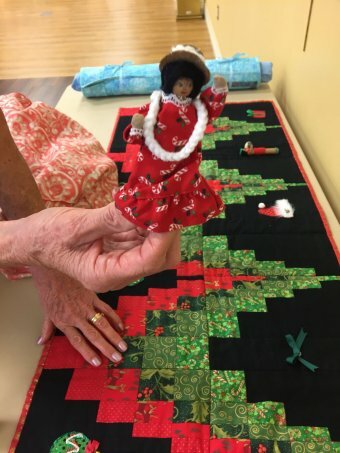 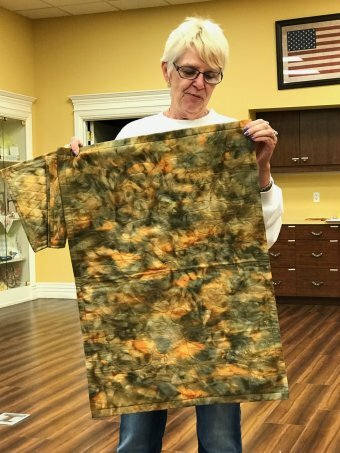 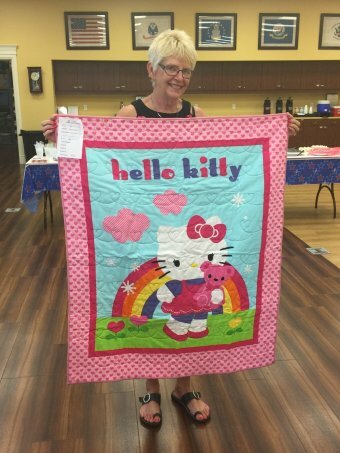 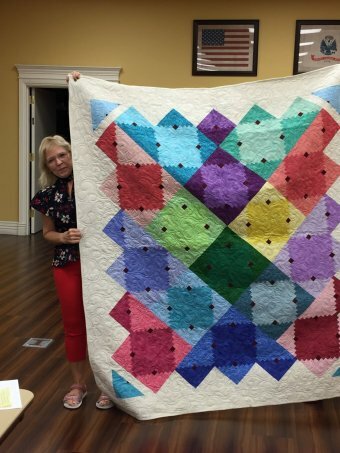 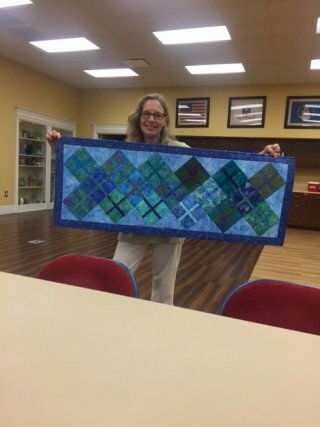 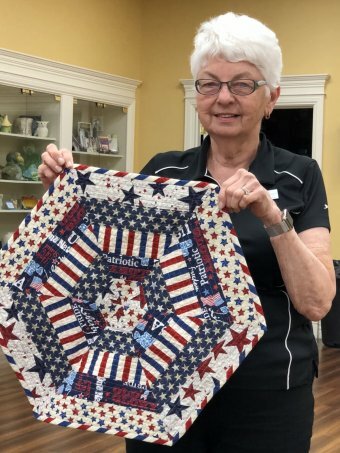 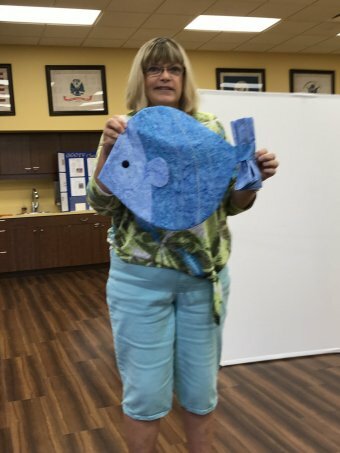 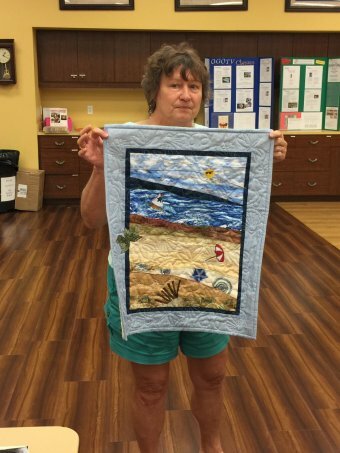 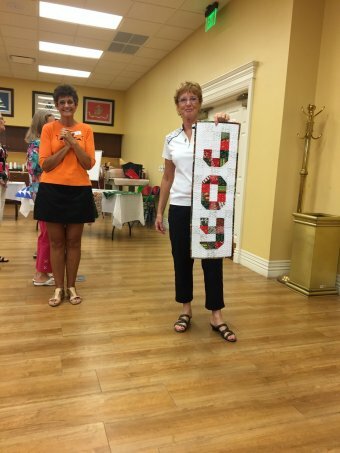 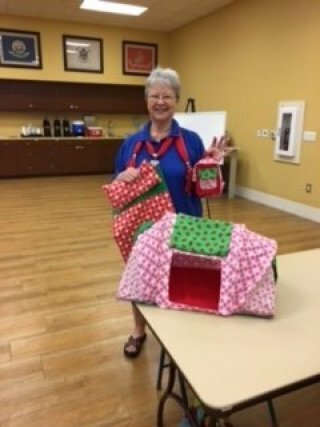 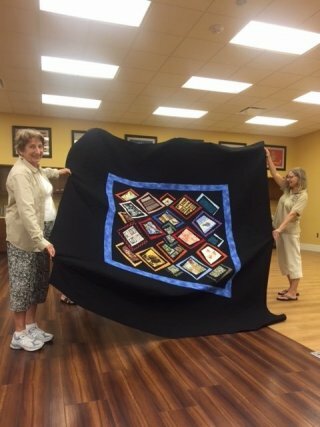 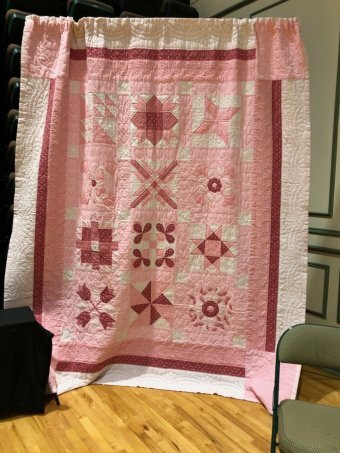 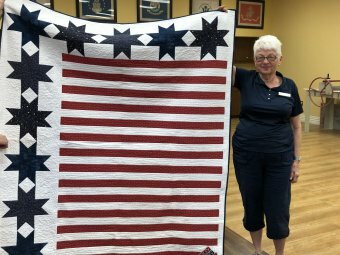 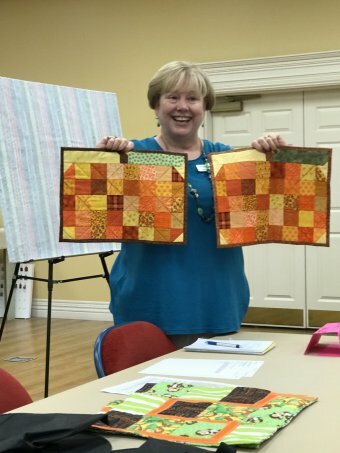 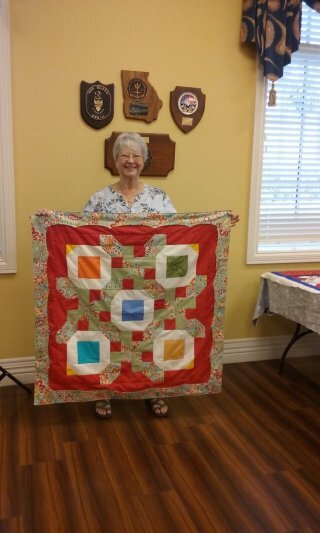 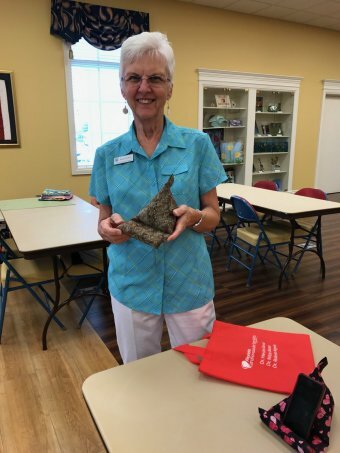 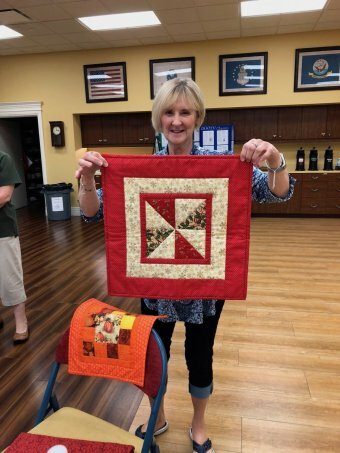 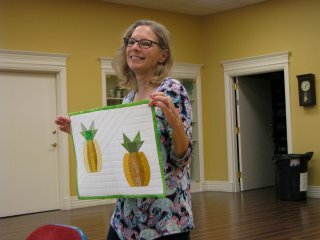 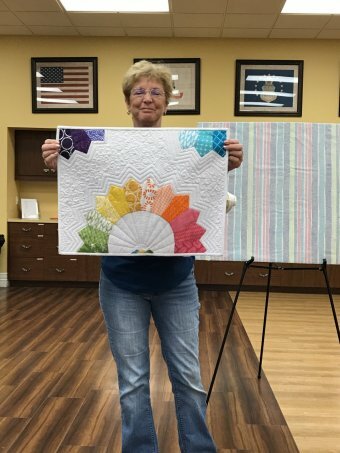 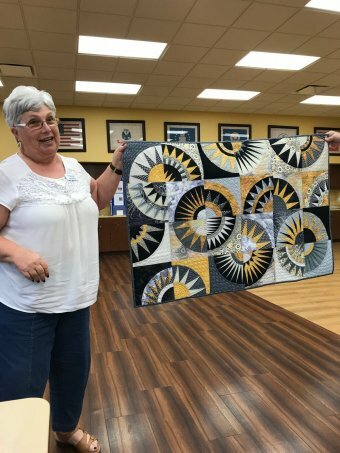 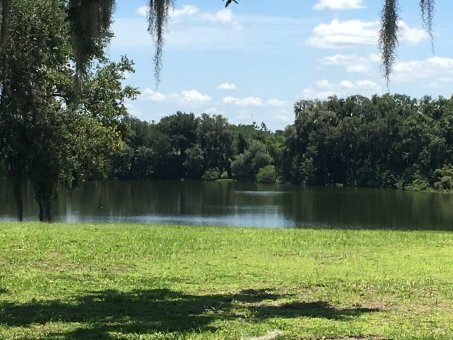 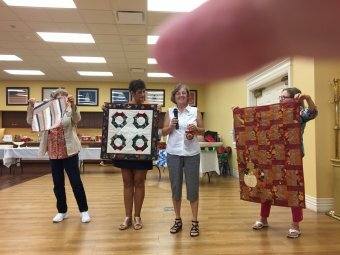 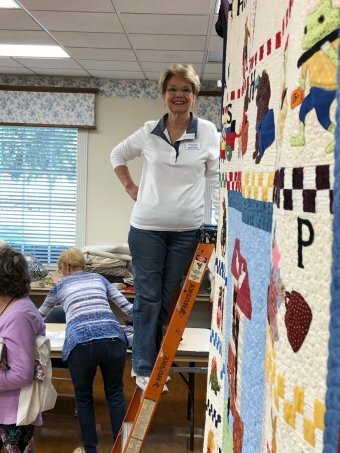 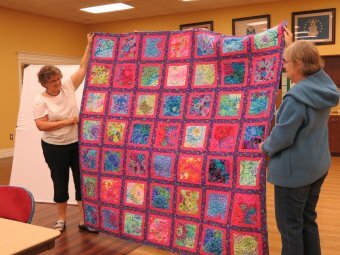 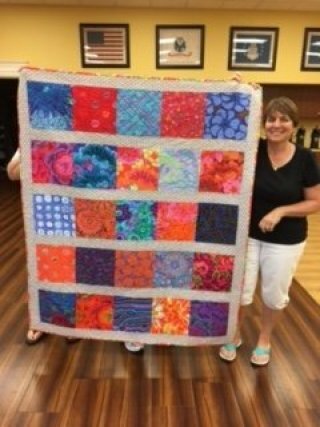 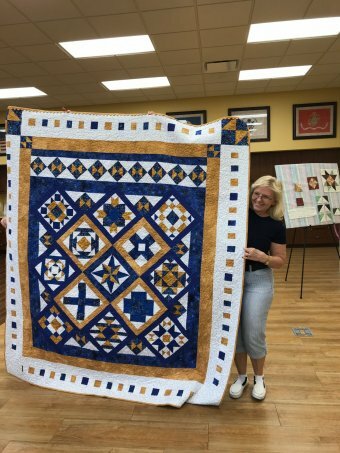 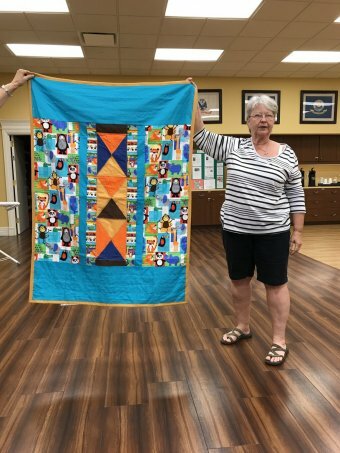 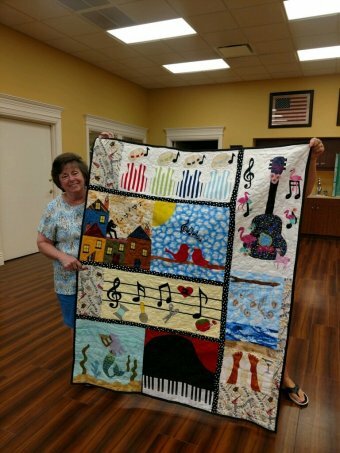 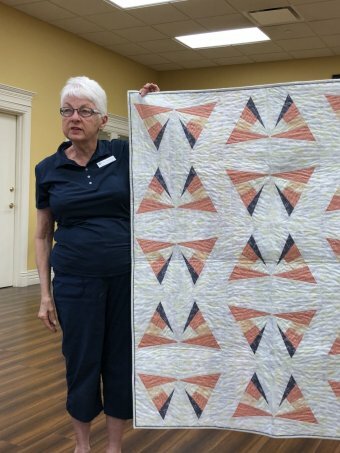 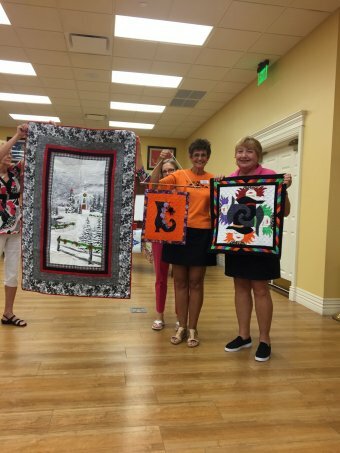 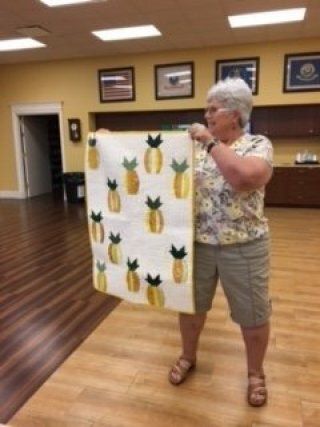 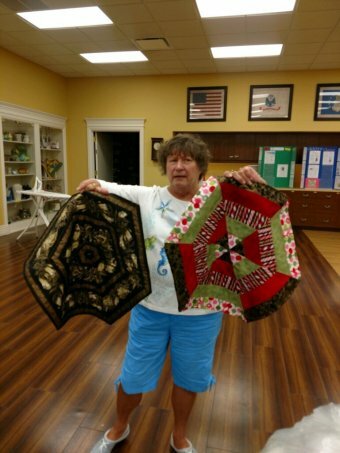 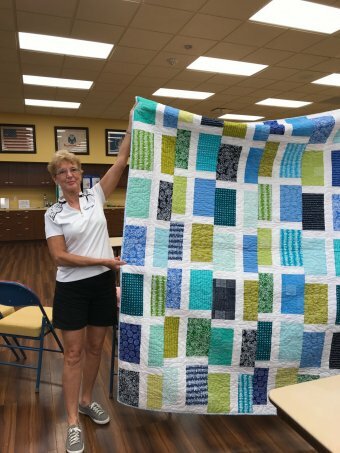 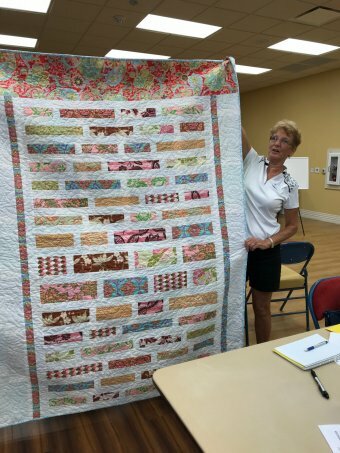 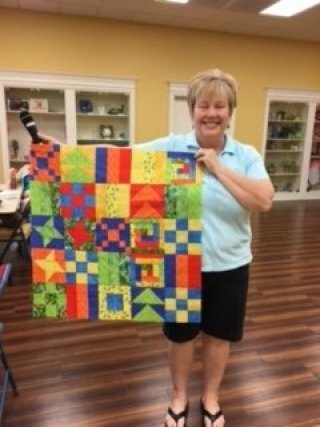 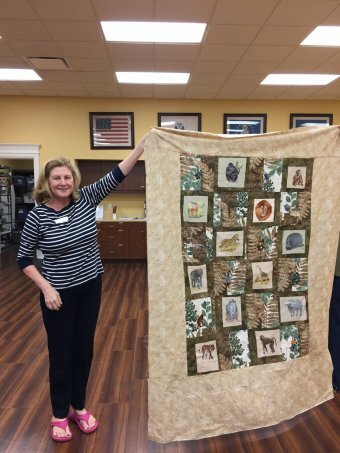 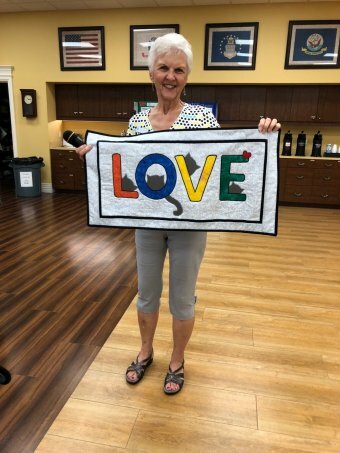 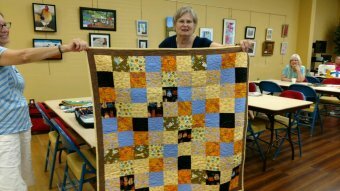 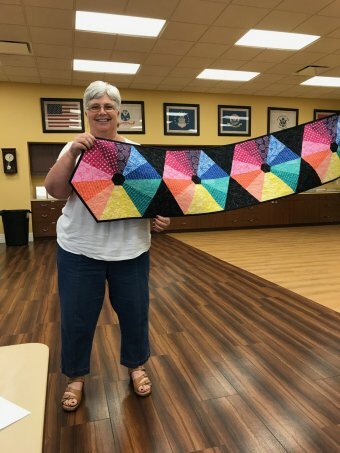 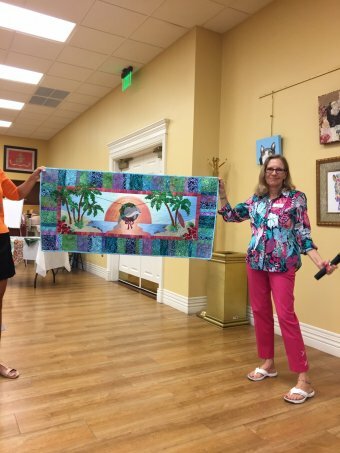 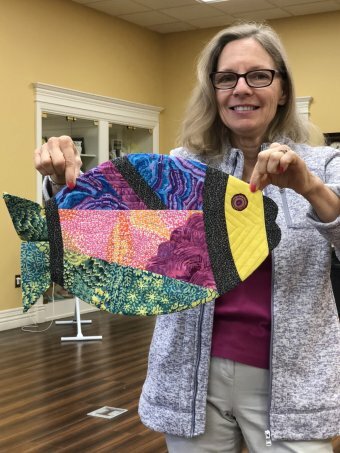 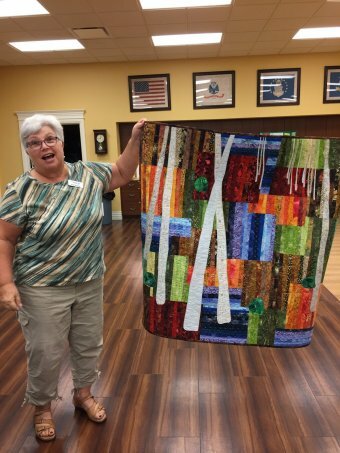 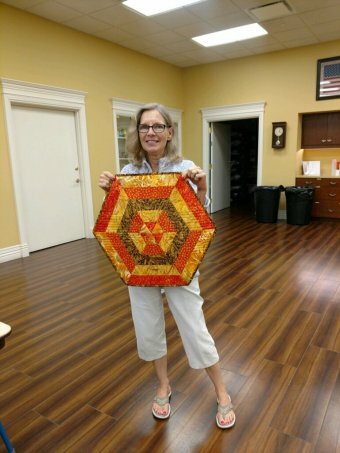 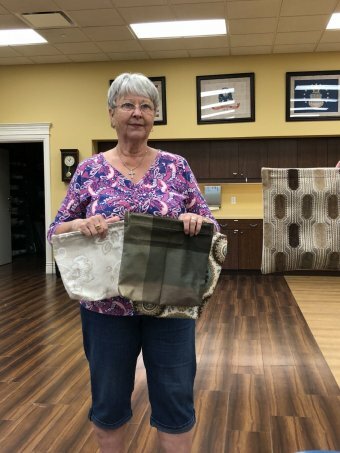 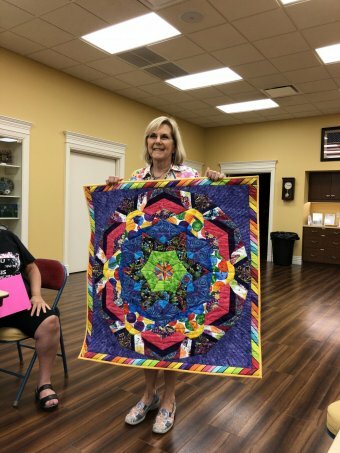 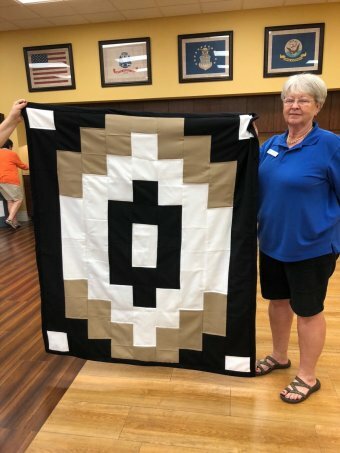 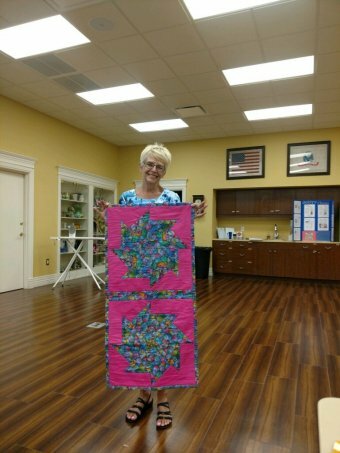 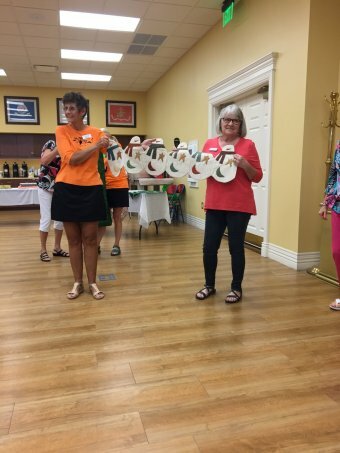 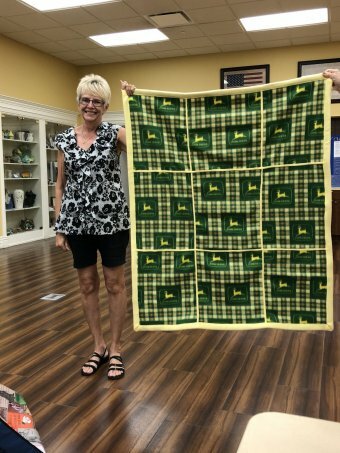 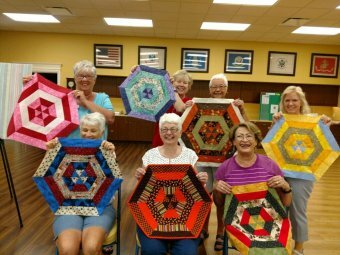 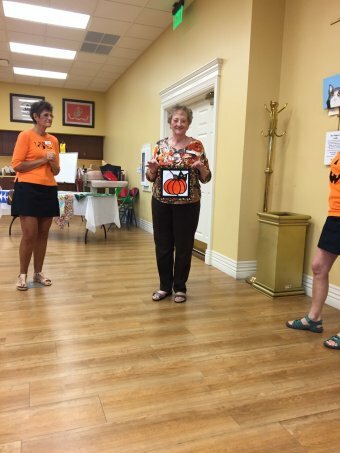 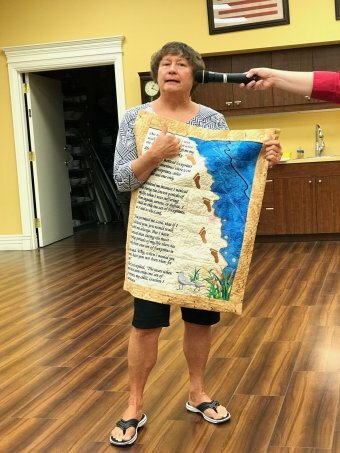 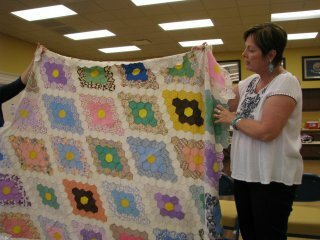 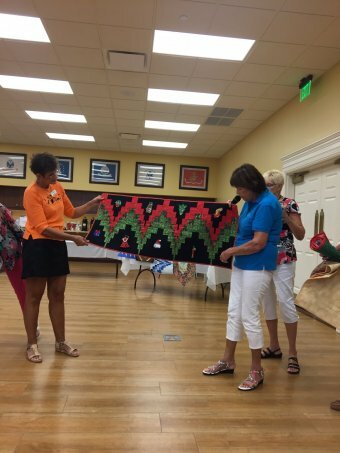 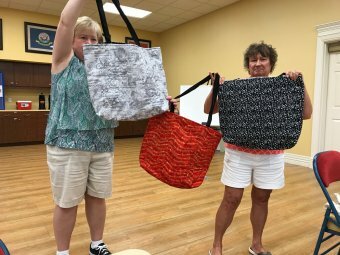 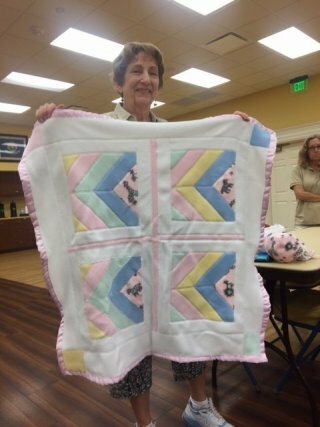 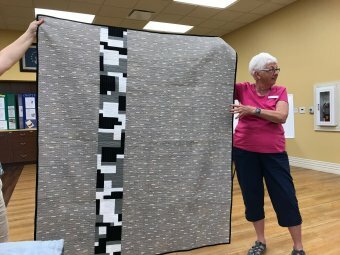 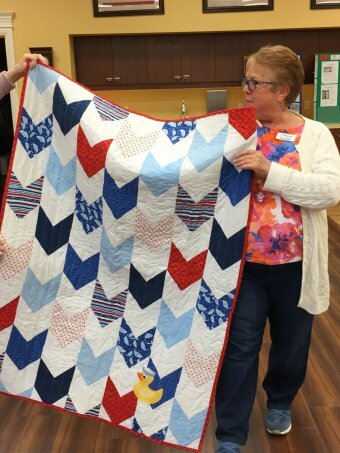 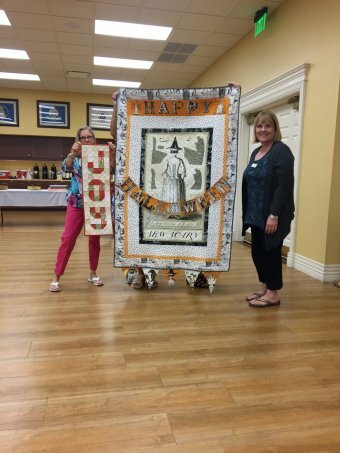 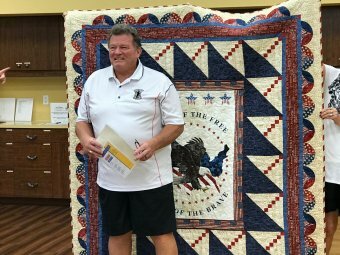 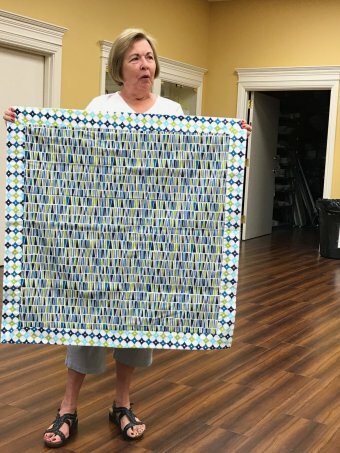 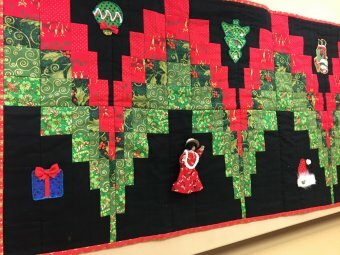 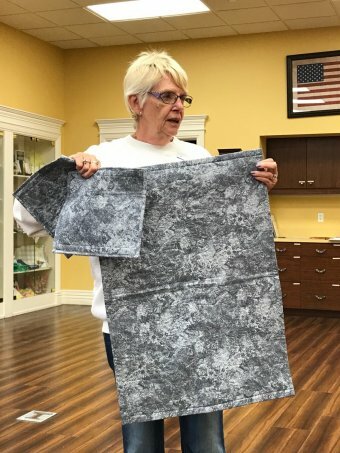 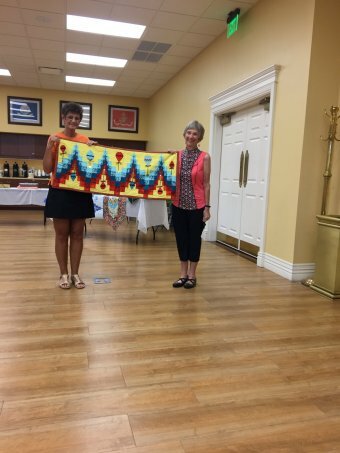 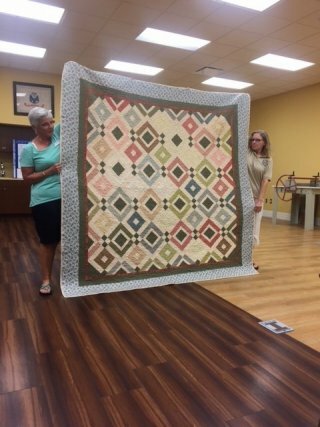 The Quilting Guild of The Villages and Khaki Quilters, both embrace as many different forms and levels of quilting, as there are quilts. 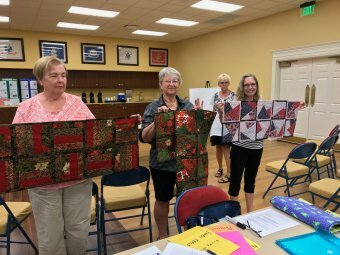 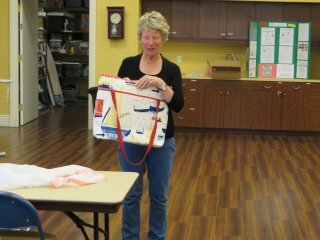 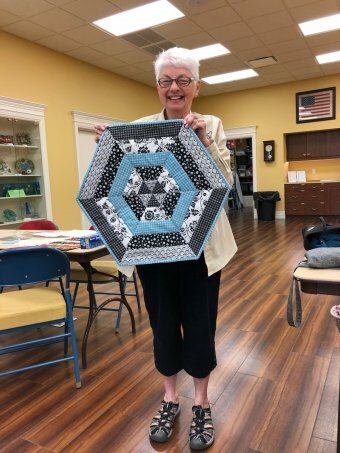 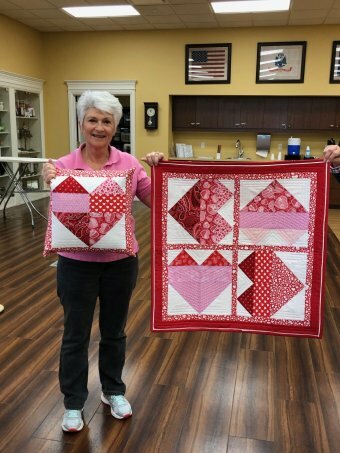 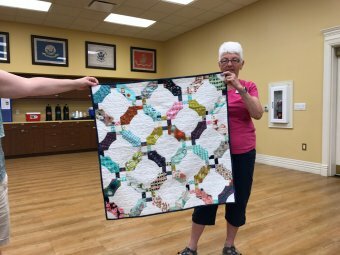 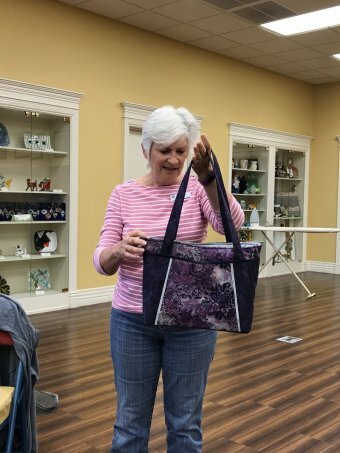 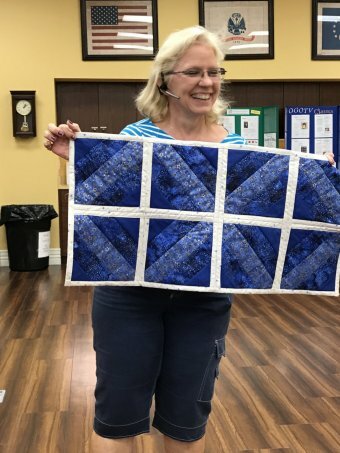 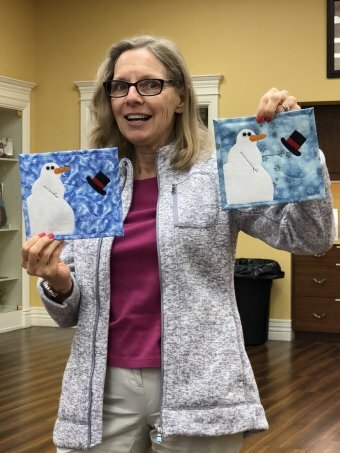 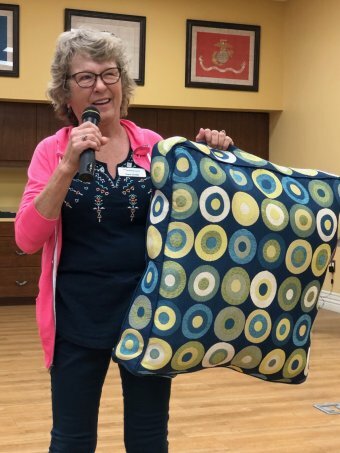 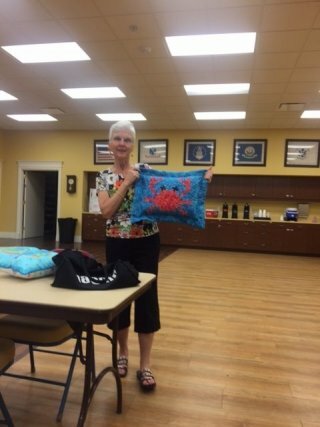 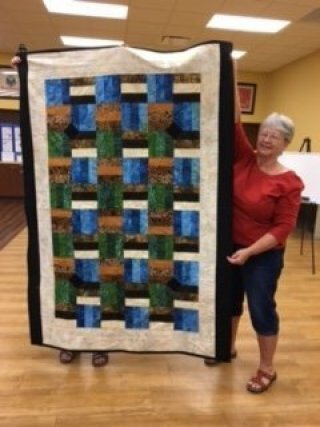 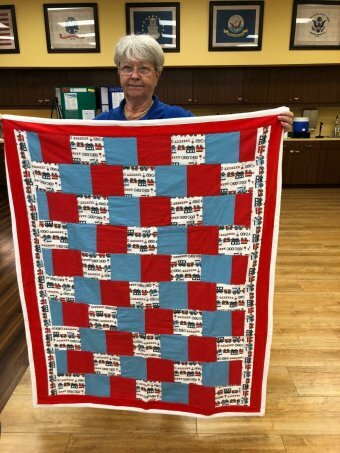 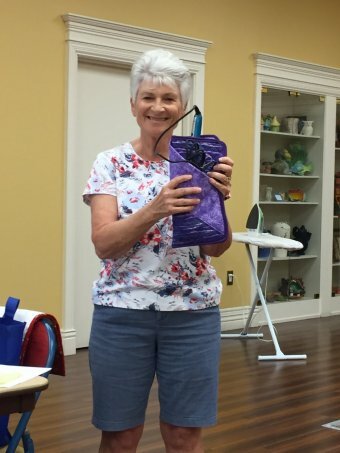 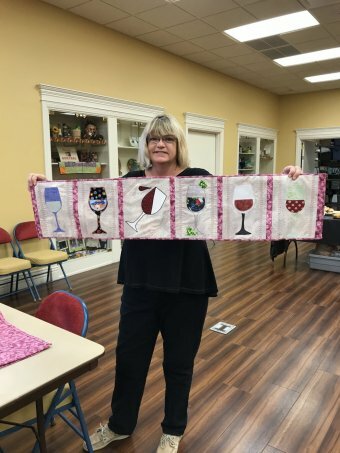 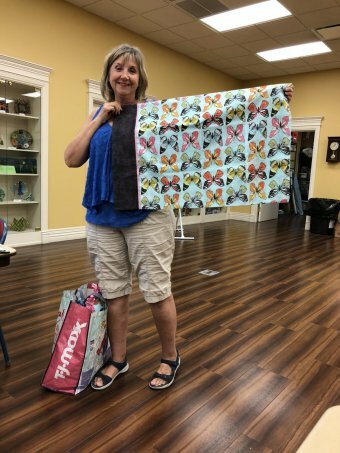 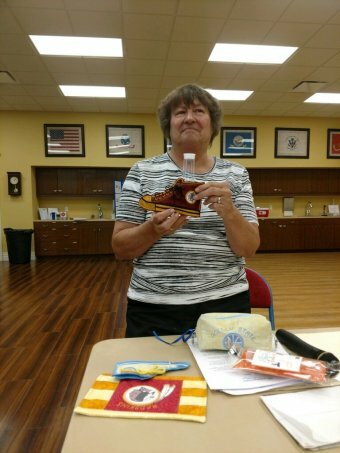 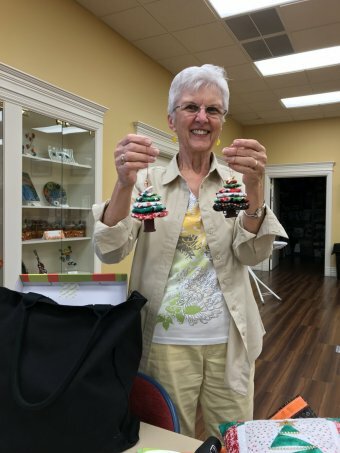 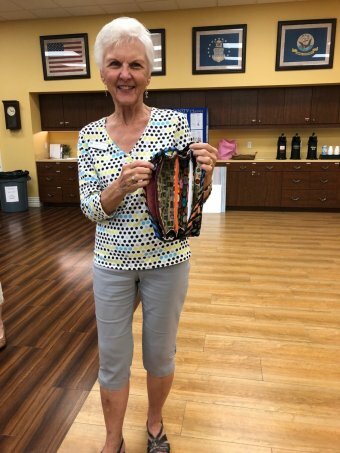 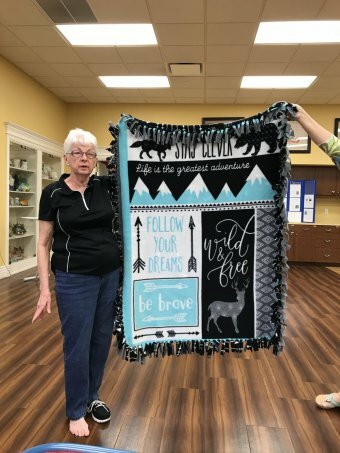 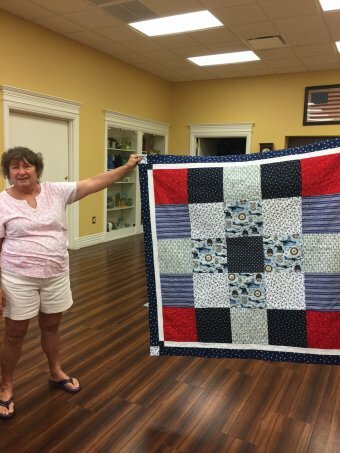 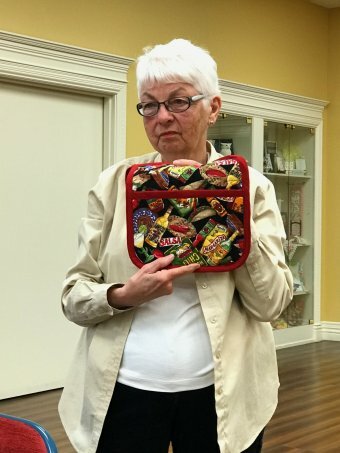 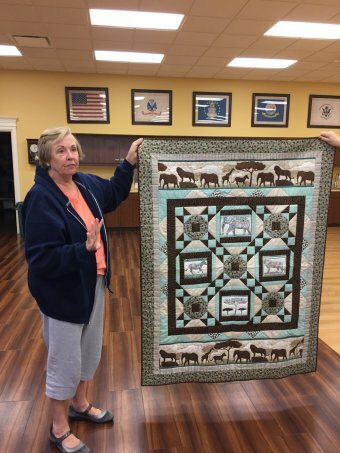 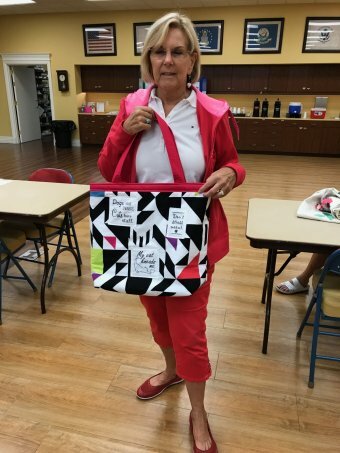 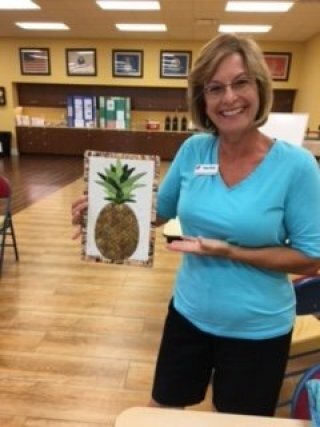 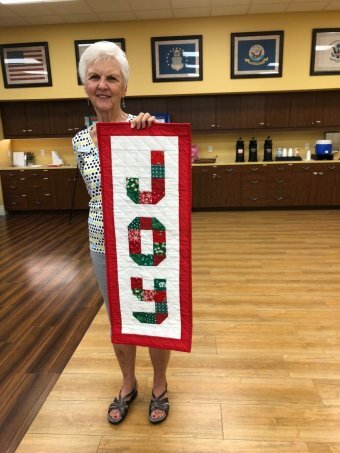 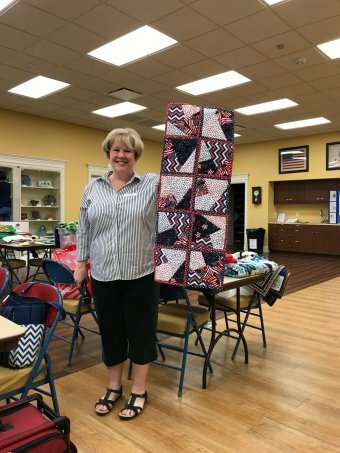 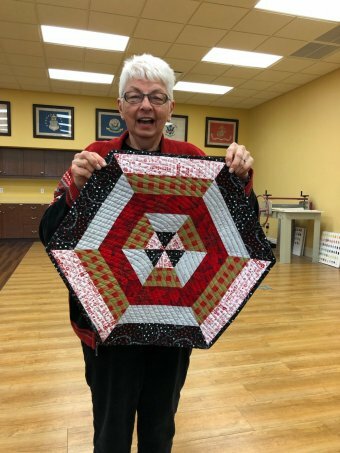 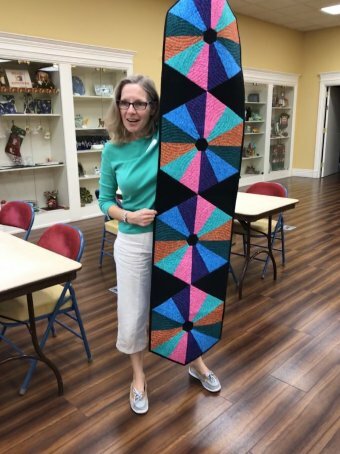 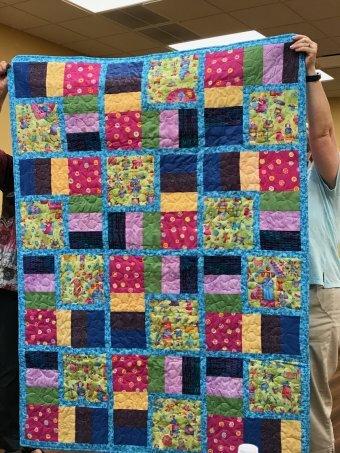 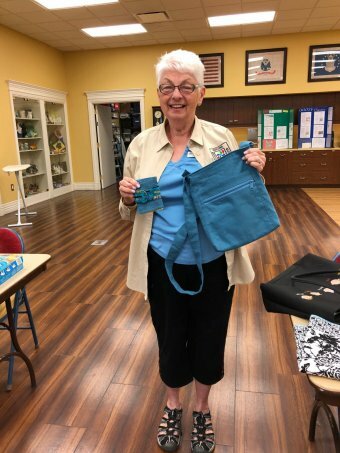 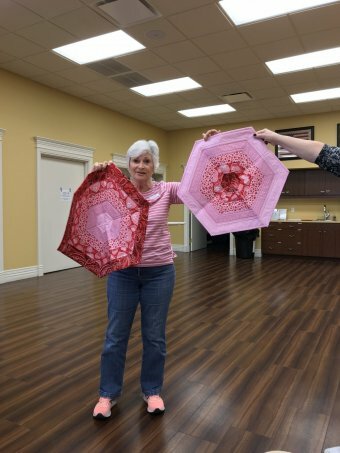 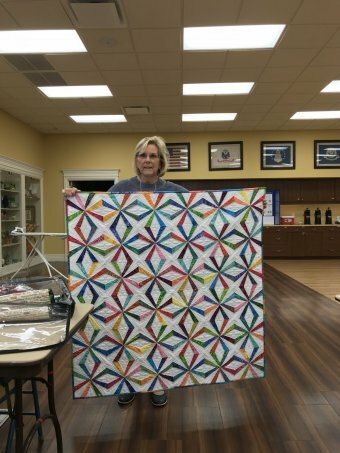 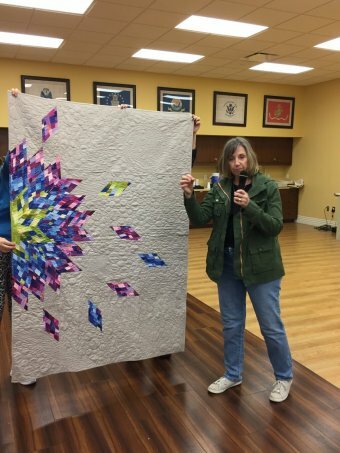 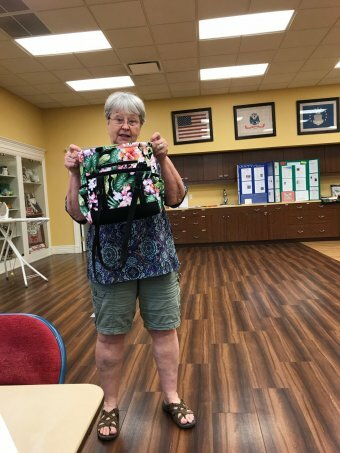 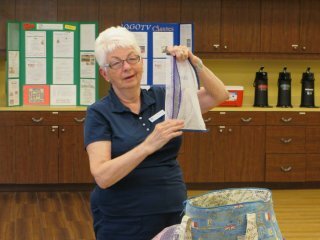 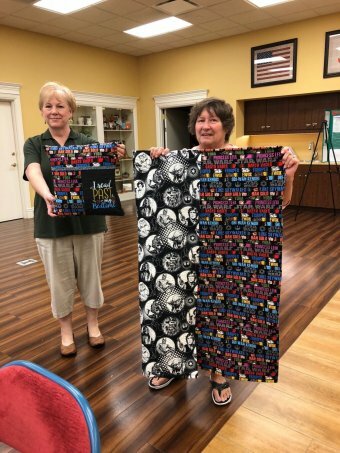 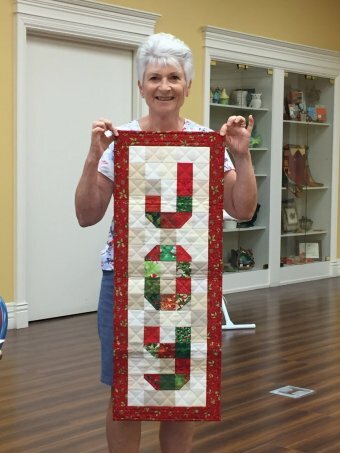 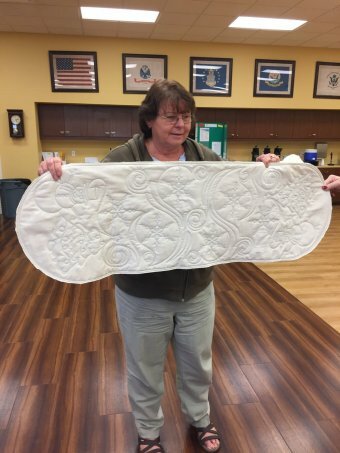 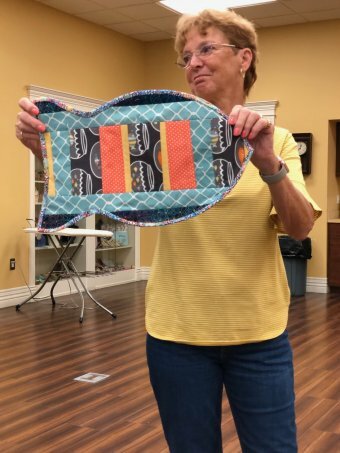 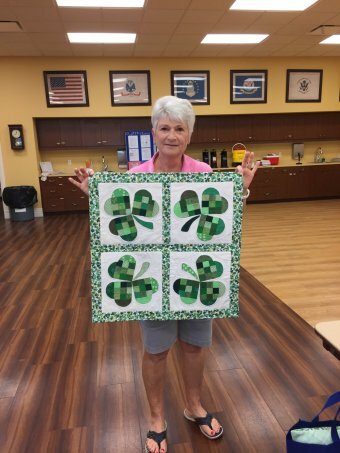 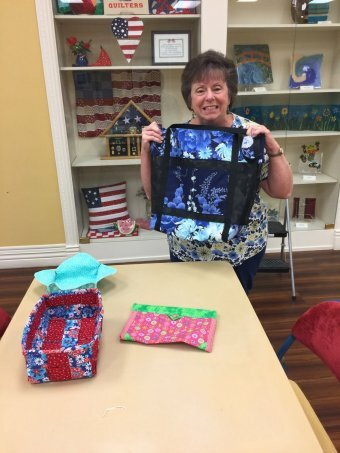 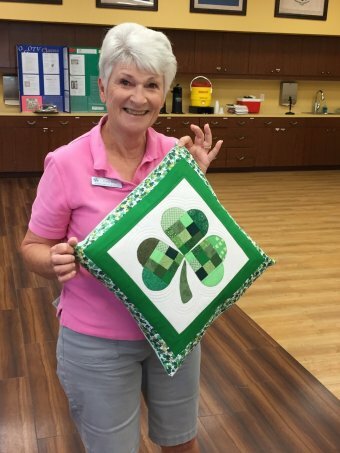 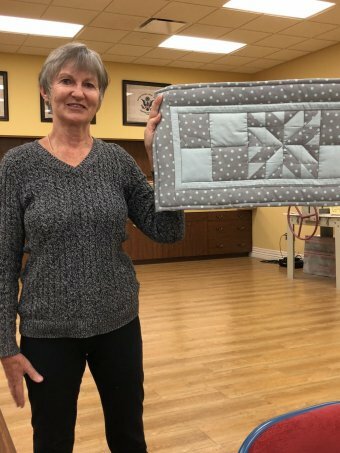 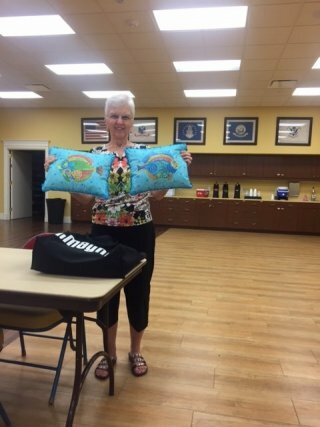 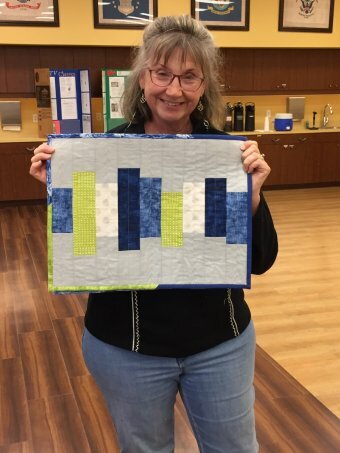 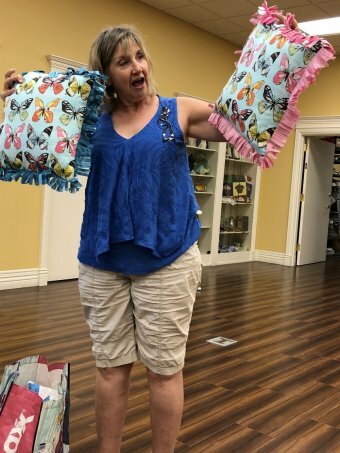 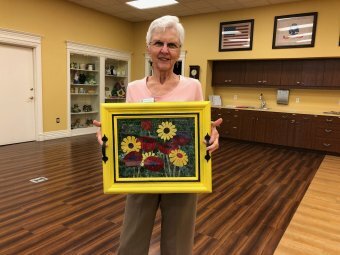 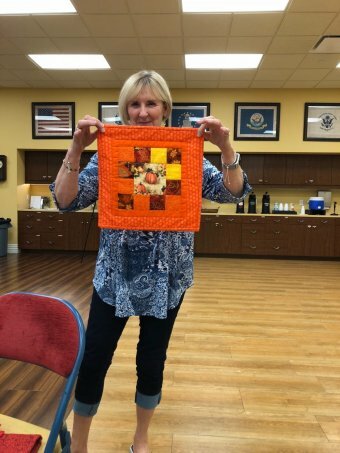 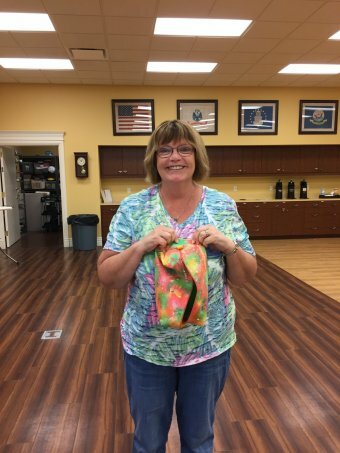 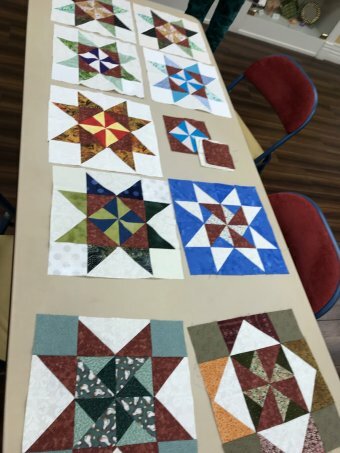 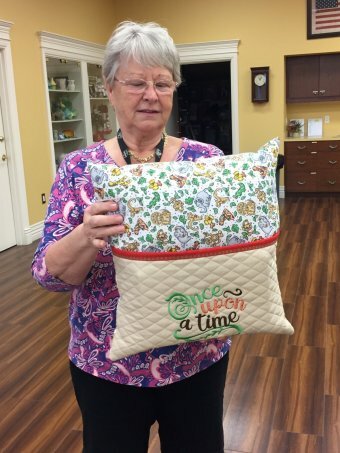 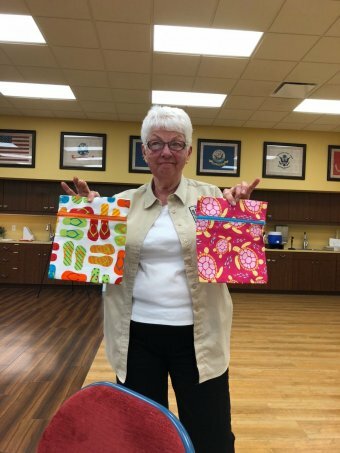 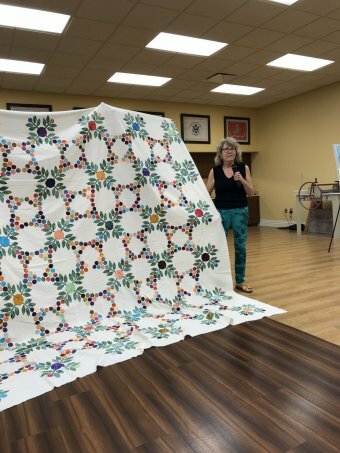 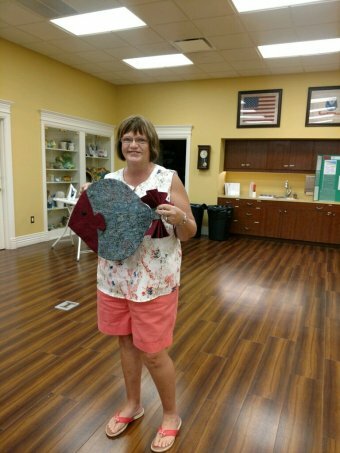 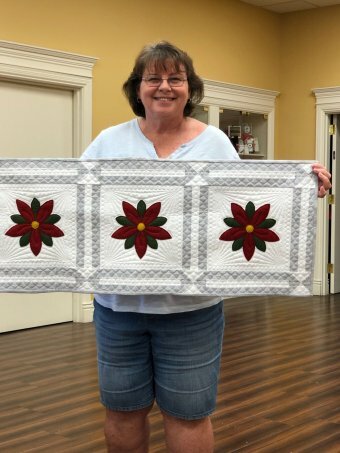 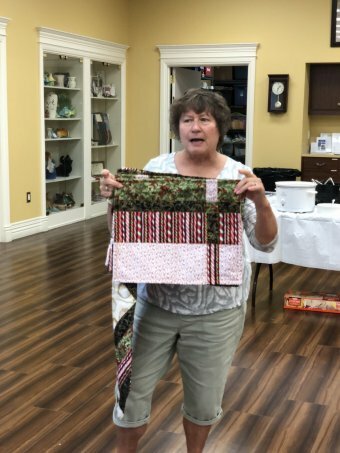 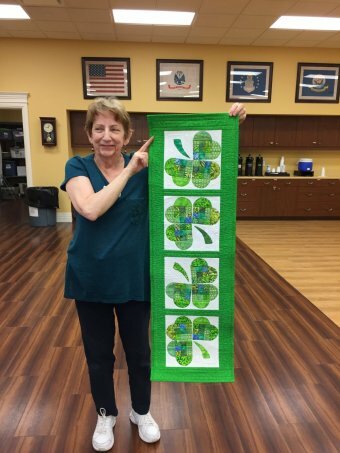 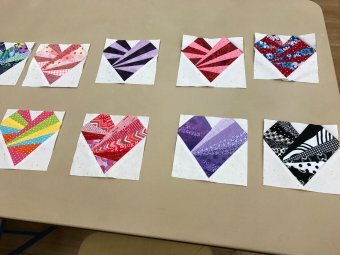 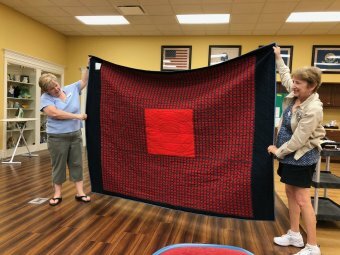 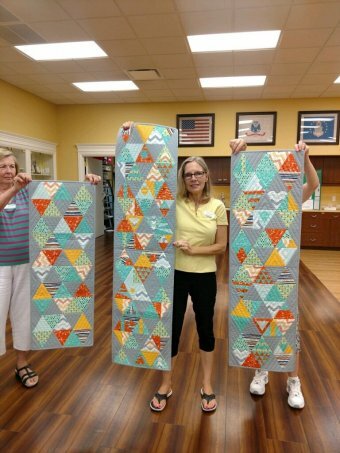 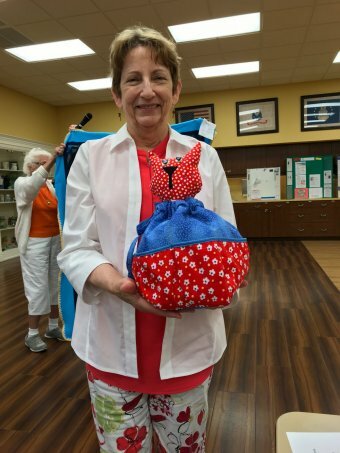 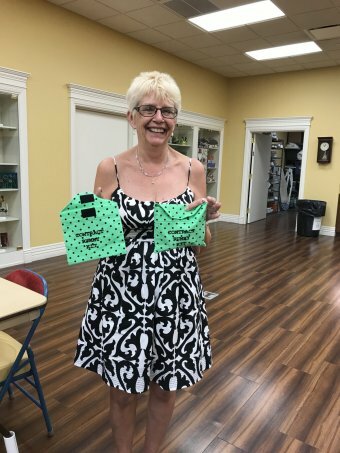 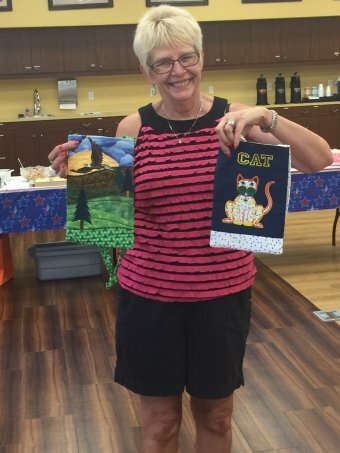 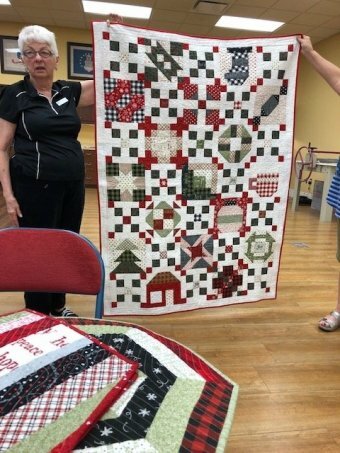 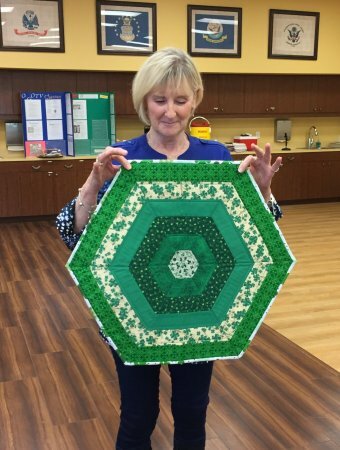 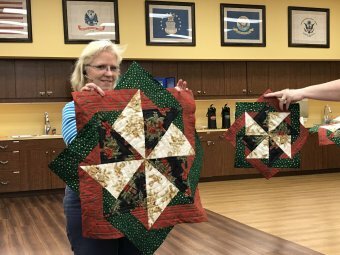 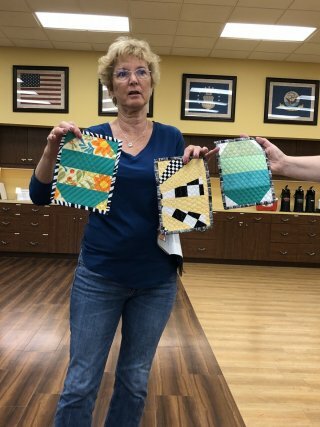 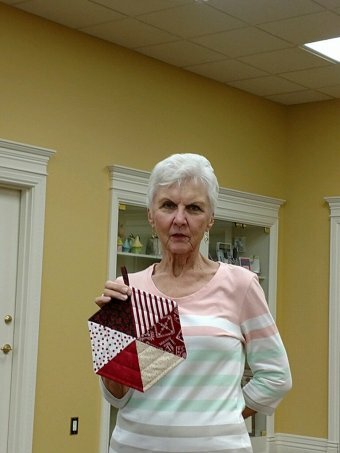 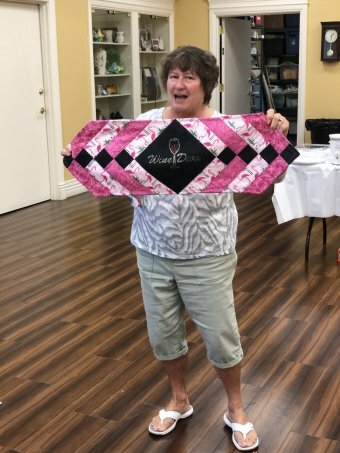 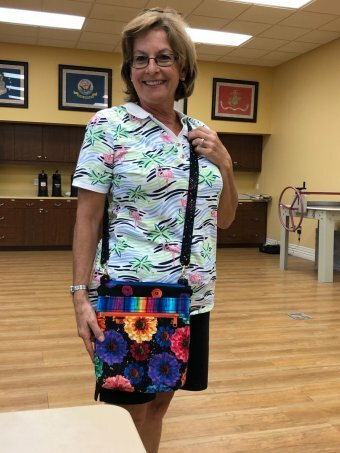 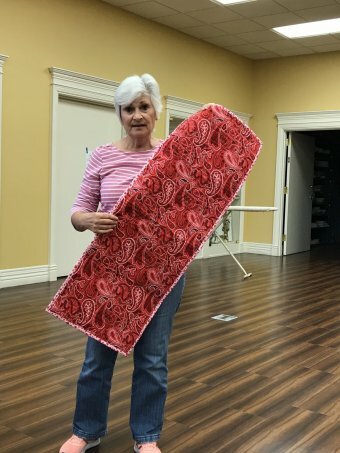 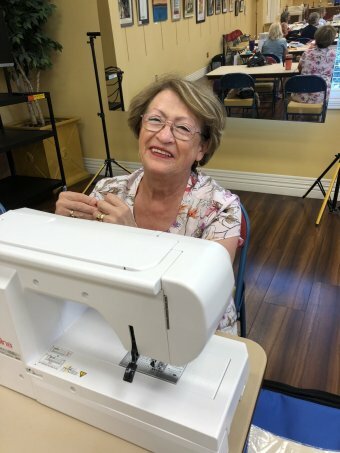 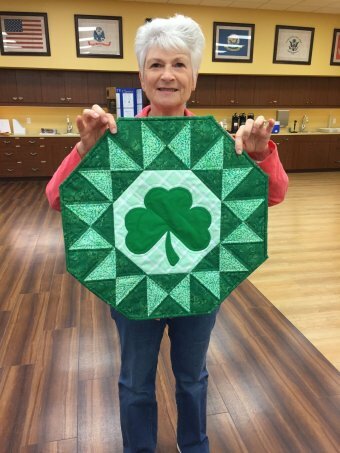 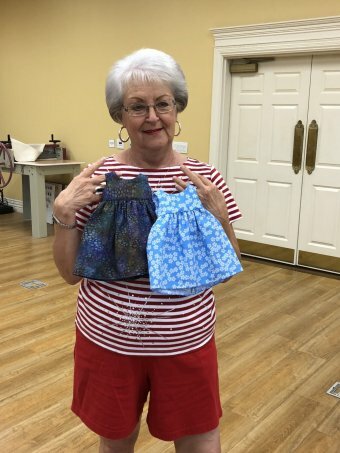 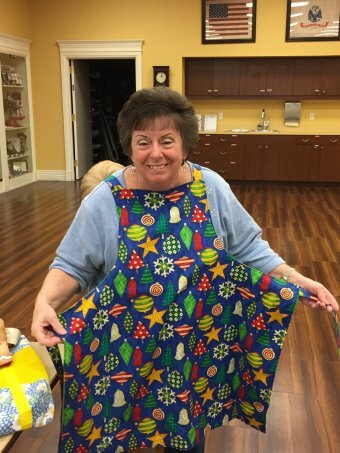 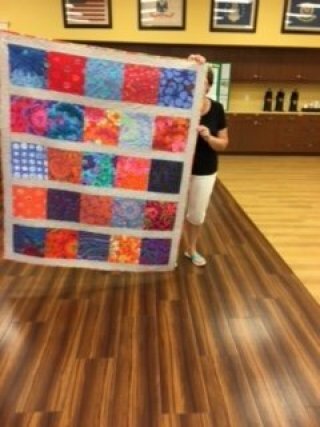 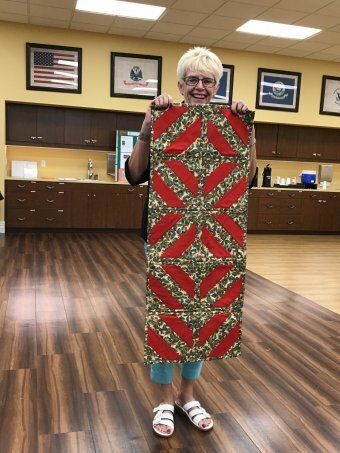 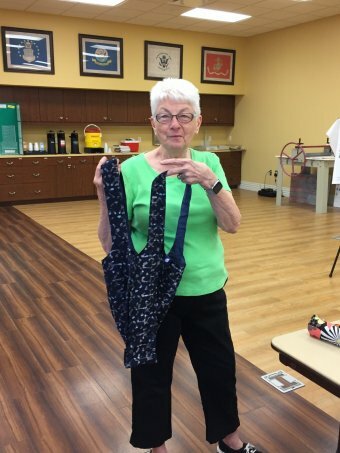 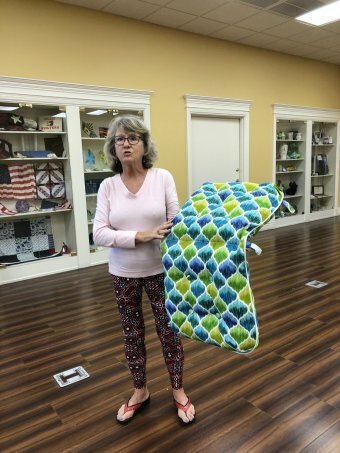 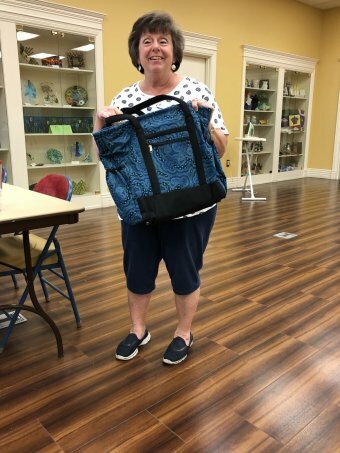 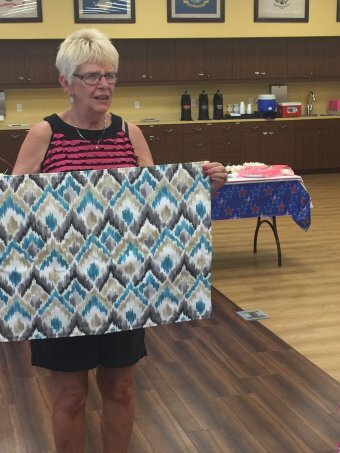 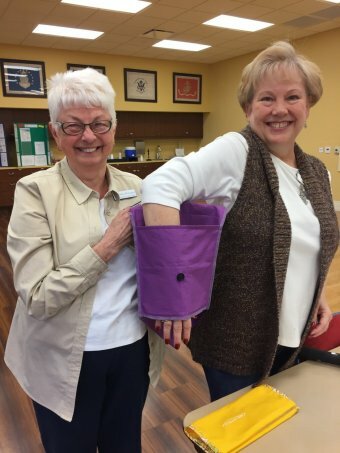 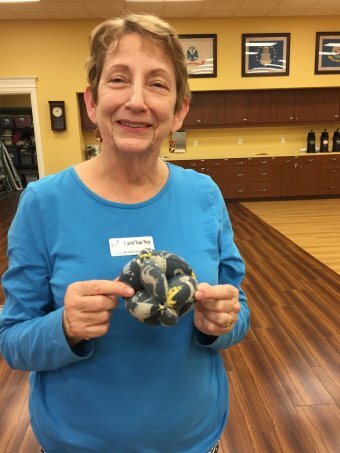 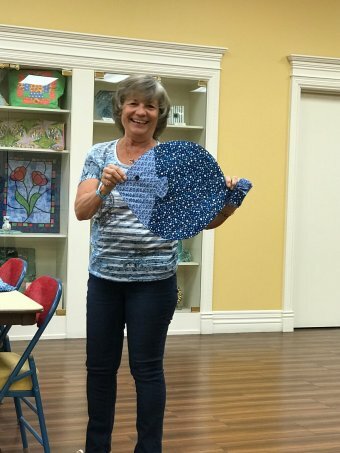 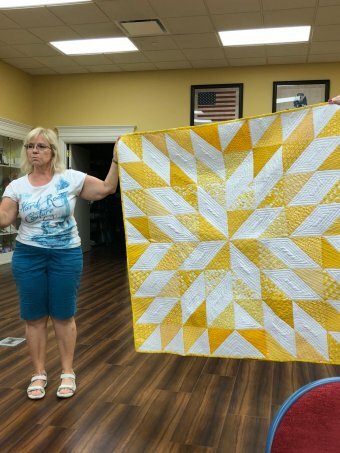 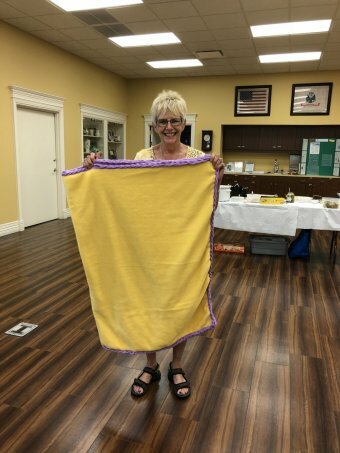 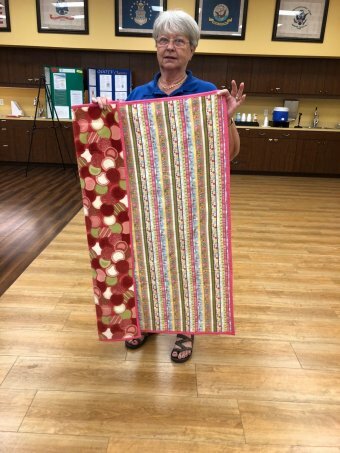 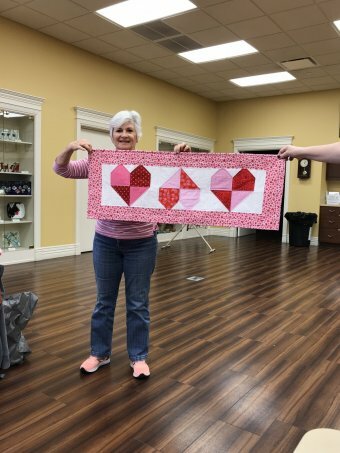 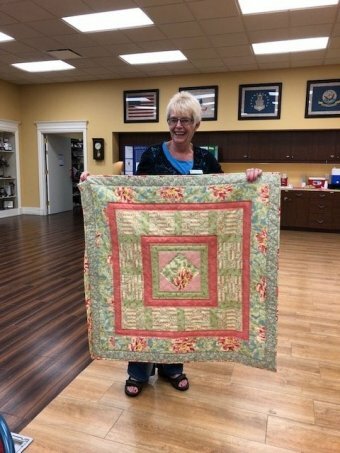 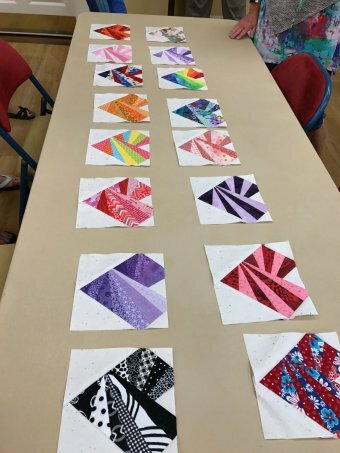 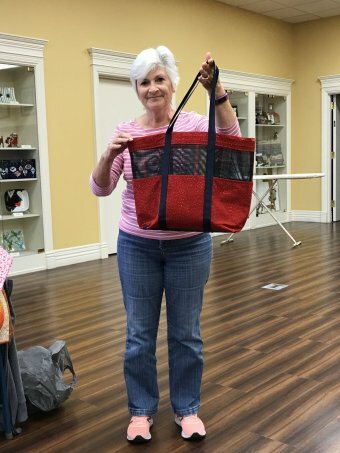 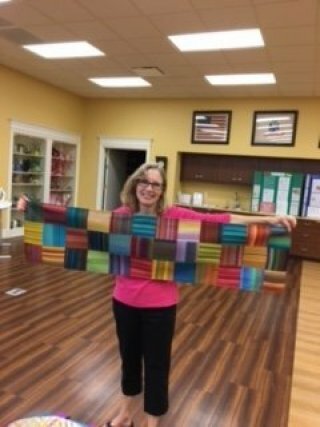 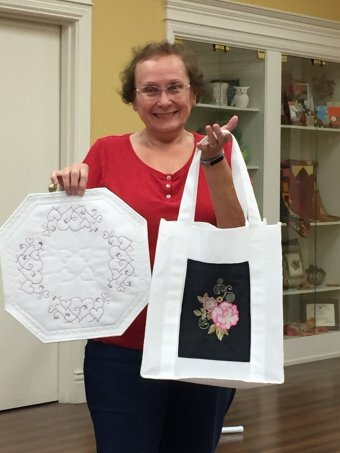 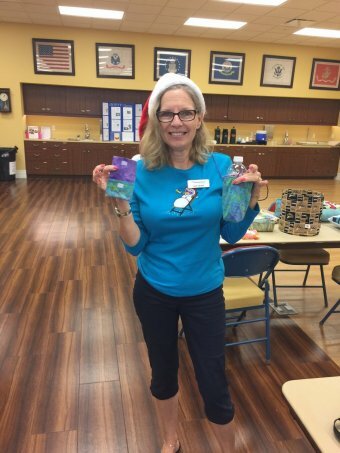 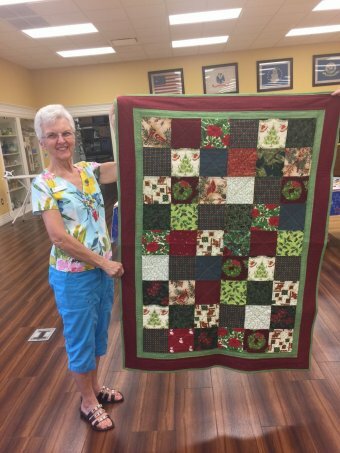 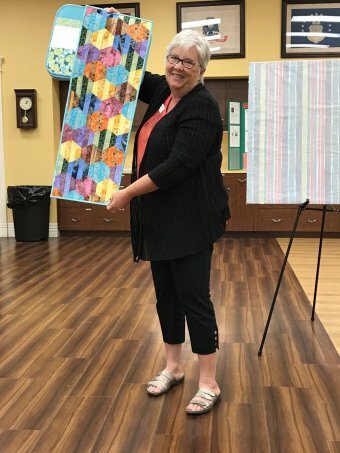 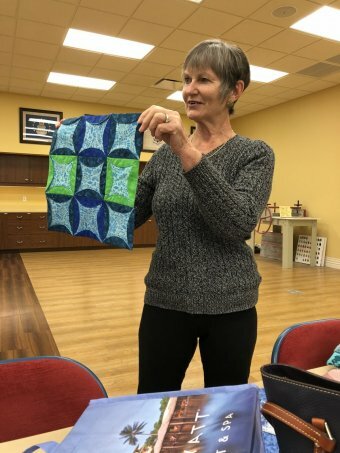 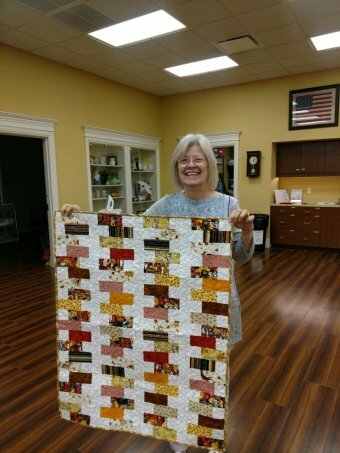 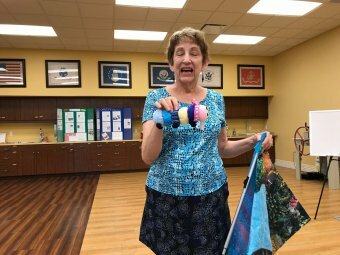 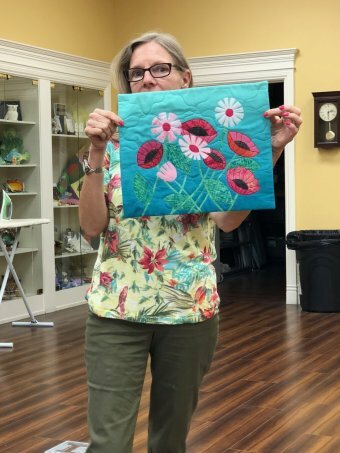 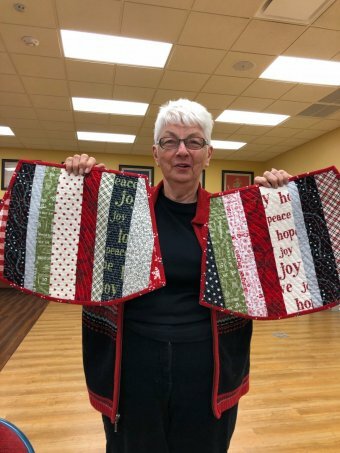 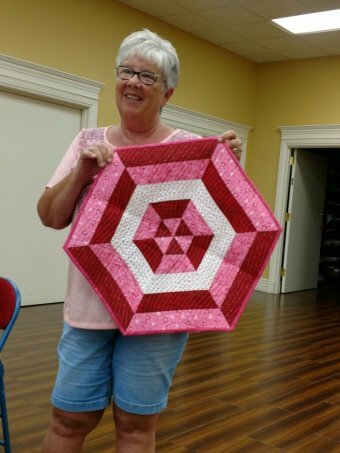 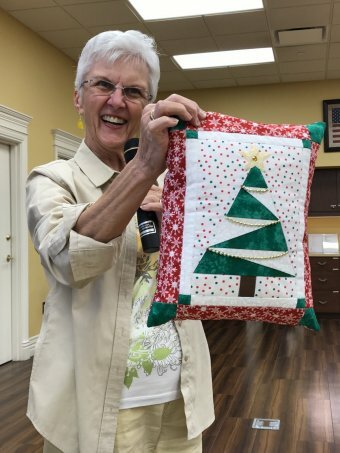 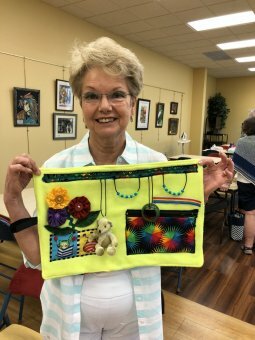 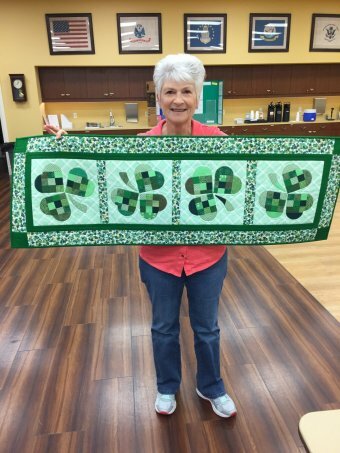 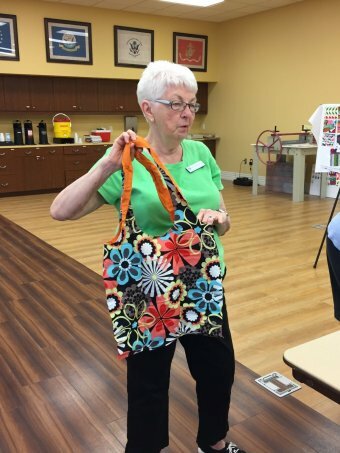 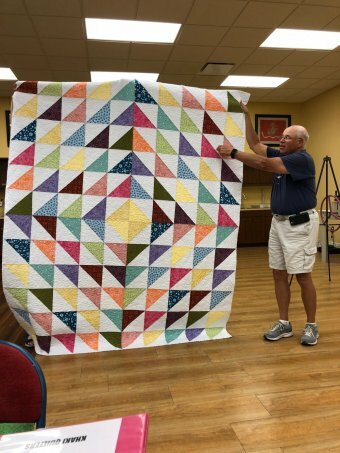 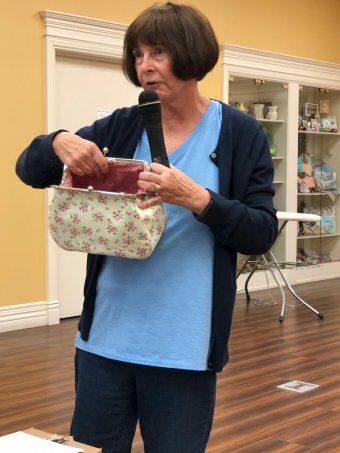 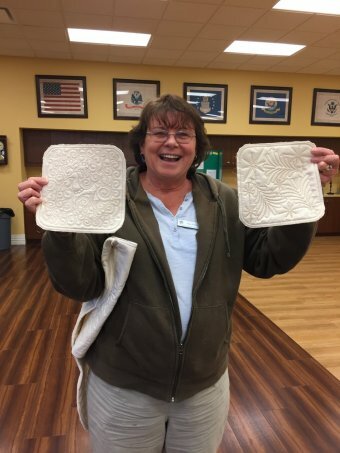 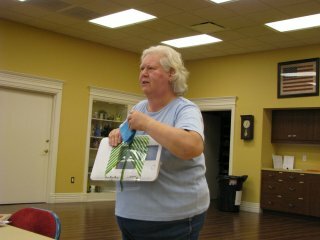 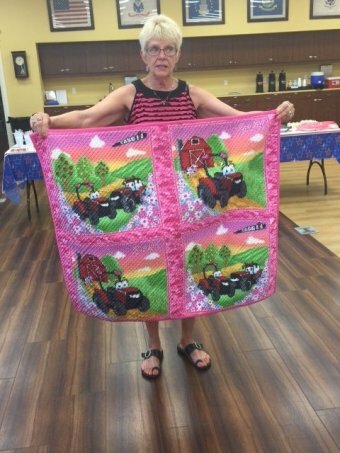 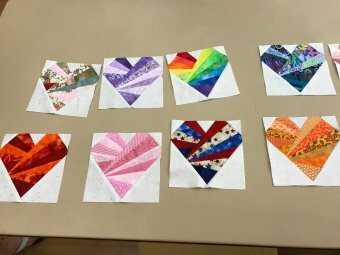 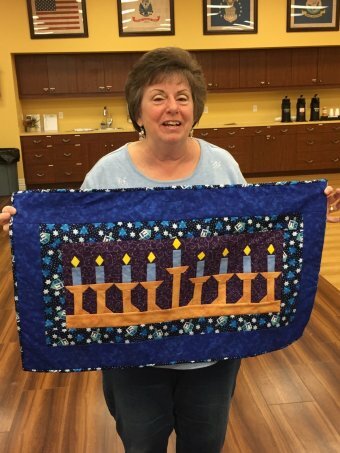 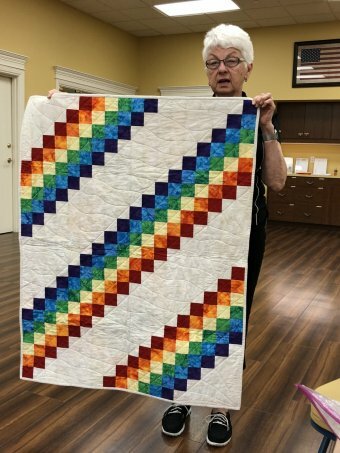 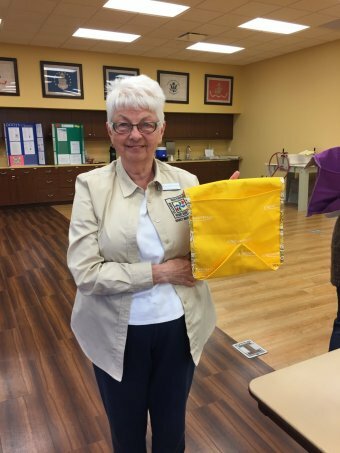 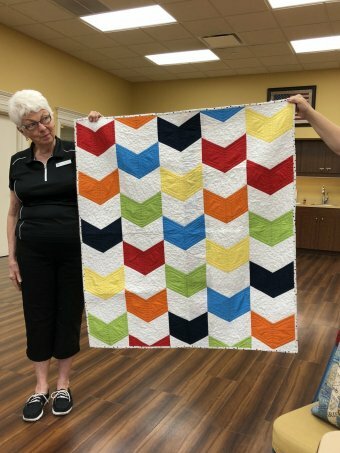 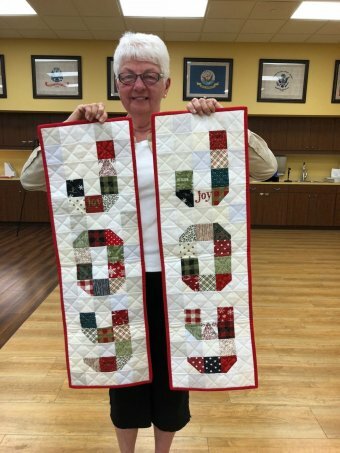 If quilting is something you have done for many years, or maybe something you want to learn but have not had the time, we have a place for you! 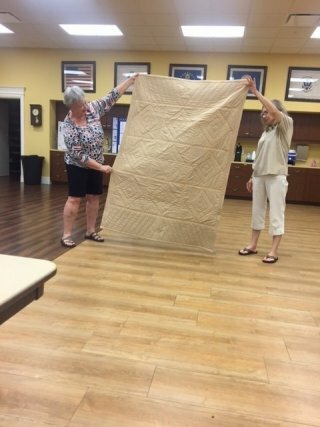 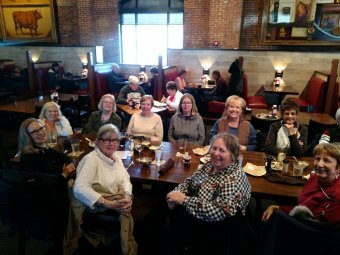 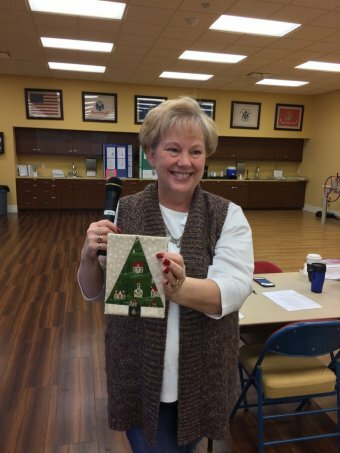 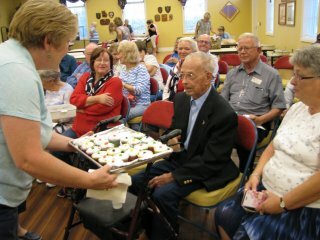 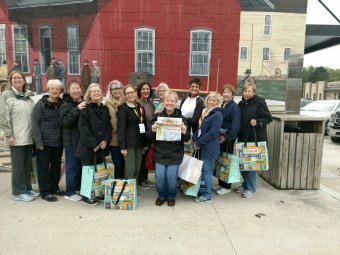 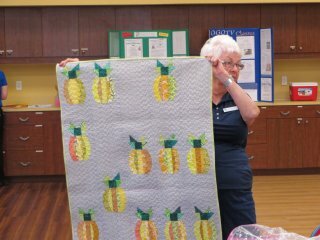 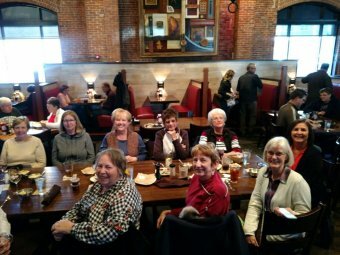 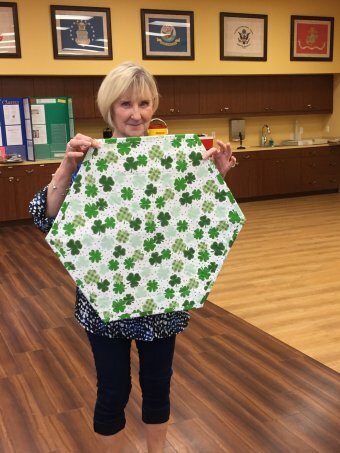 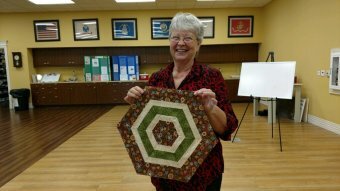 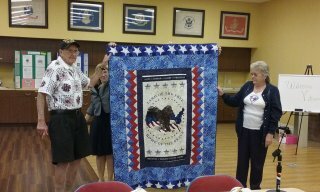 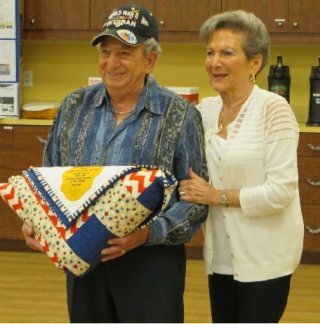 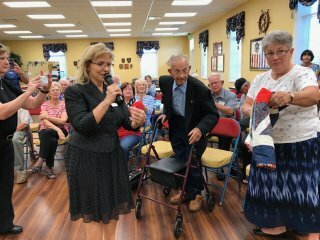 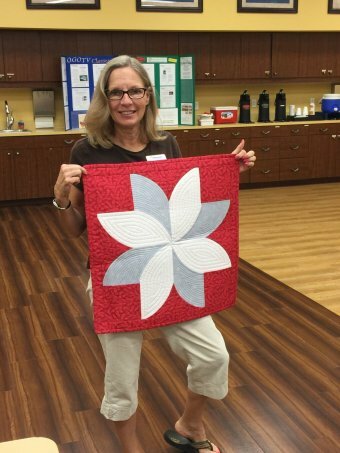 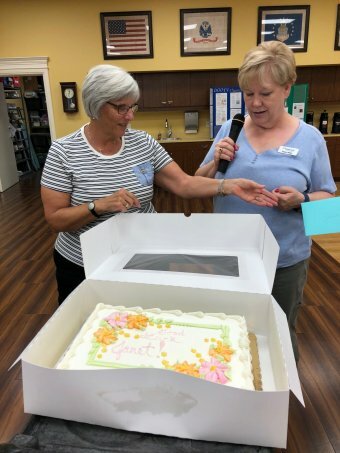 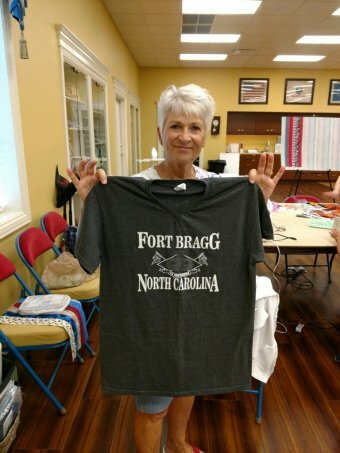 Gathering together for a common purpose gives Khaki Quilters the benefits that a quilter’s social life can provide. 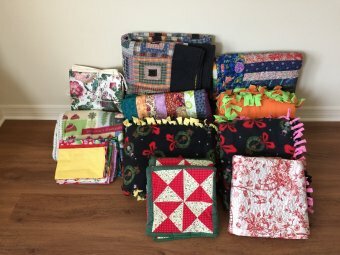 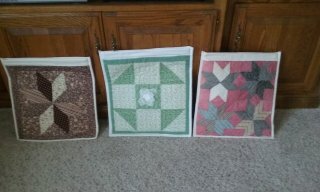 Quilting today includes many things. 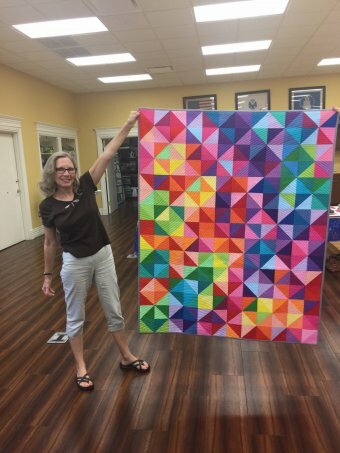 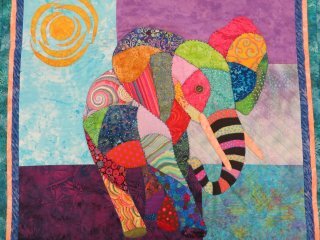 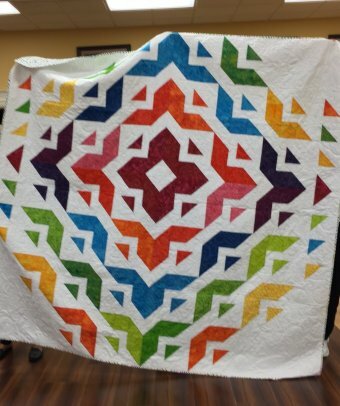 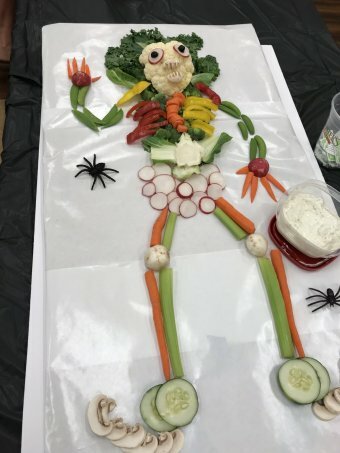 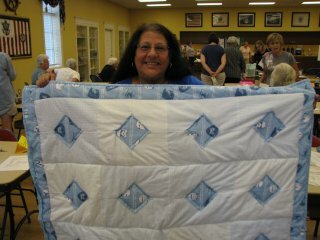 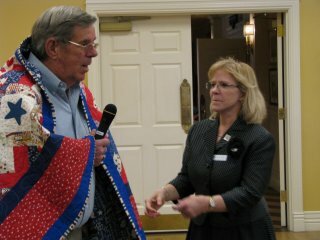 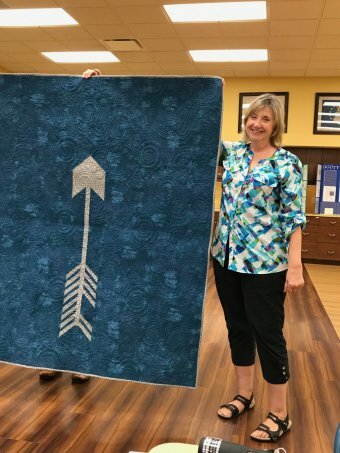 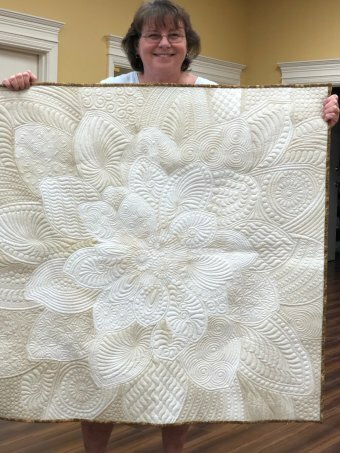 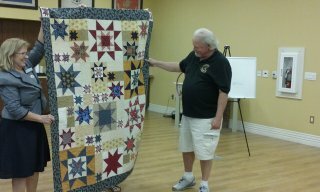 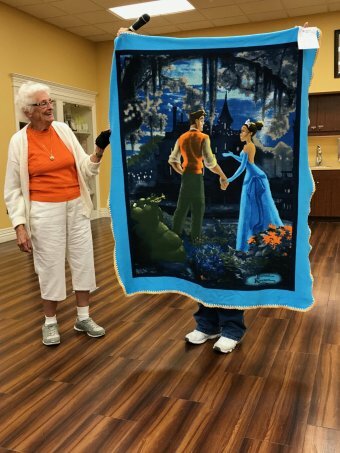 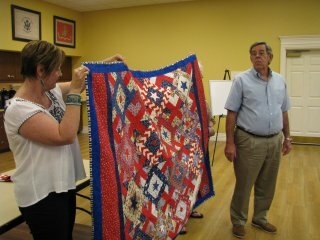 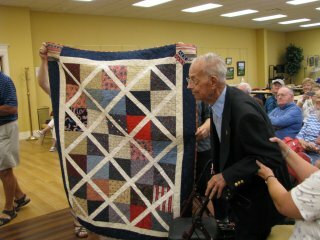 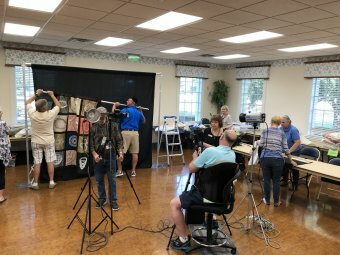 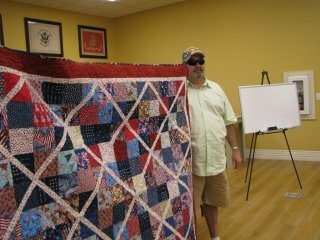 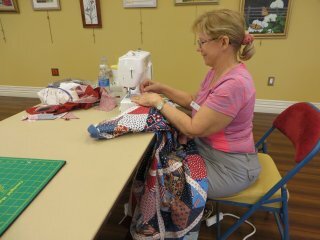 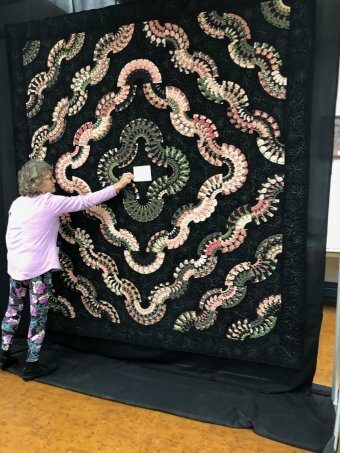 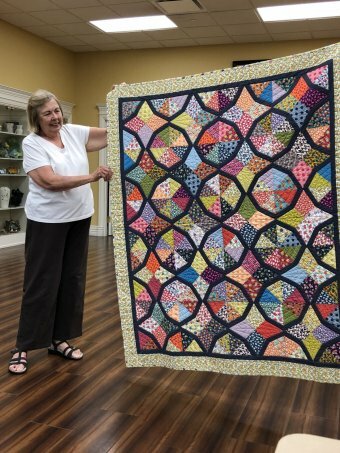 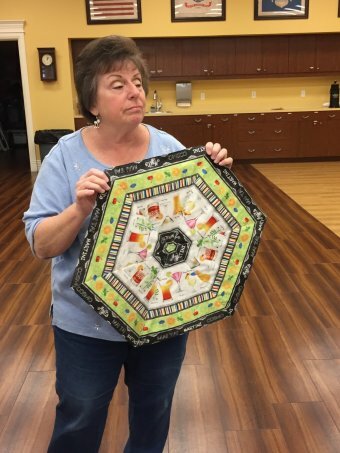 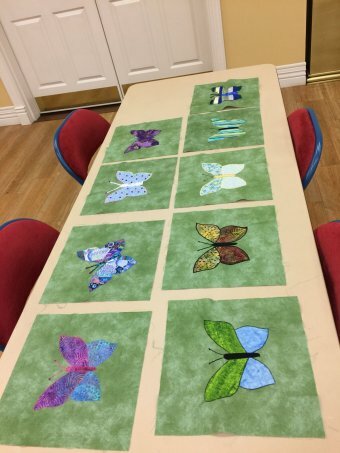 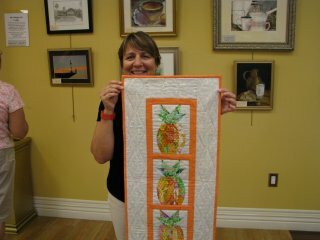 Each quilter brings experiences to the process of creating a unique art form. 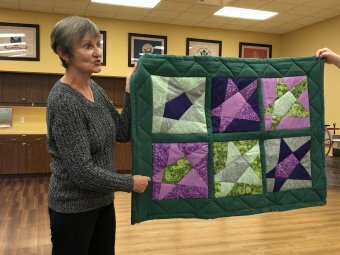 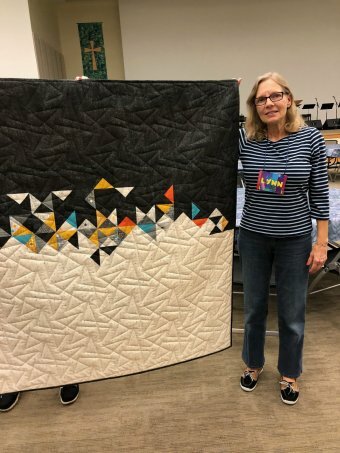 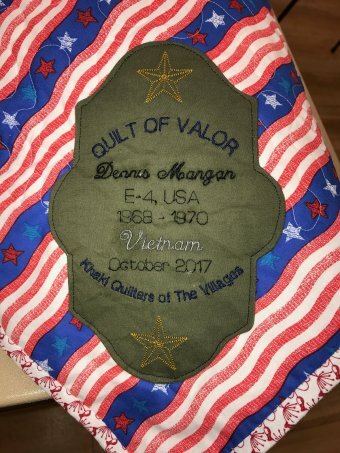 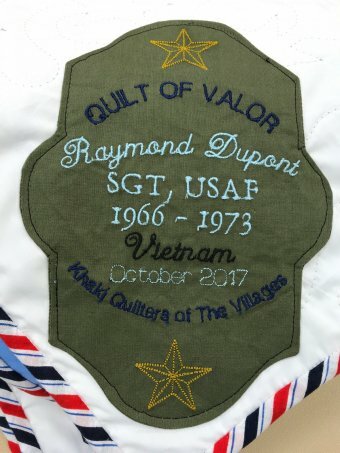 Fabrics, techniques, art, literature, history, education, and styles from geographic regions that stretch across the globe, are all part of each quilted piece that is stitched by the members of Khaki Quilter. 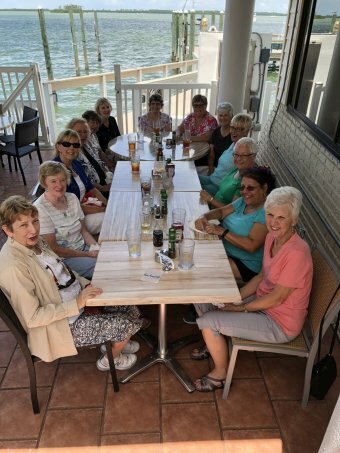 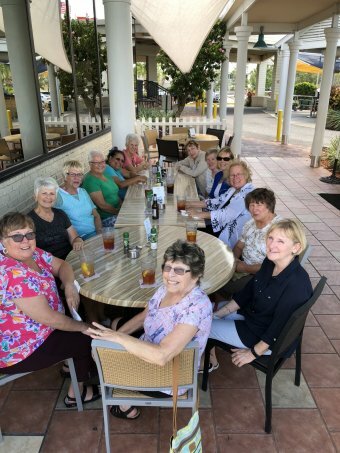 Lunch with our Bradenton Sister Group.